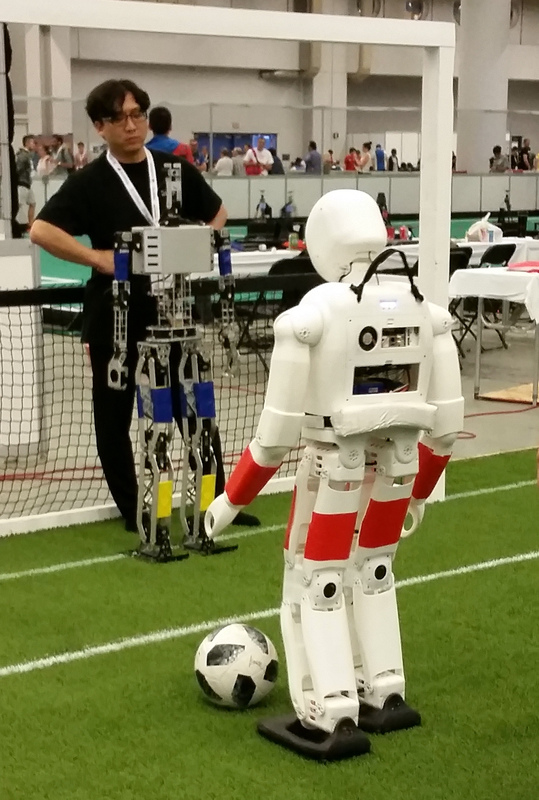 Our team NimbRo won the RoboCup 2018 Humanoid League AdultSize soccer competition in Montreal, Canada. 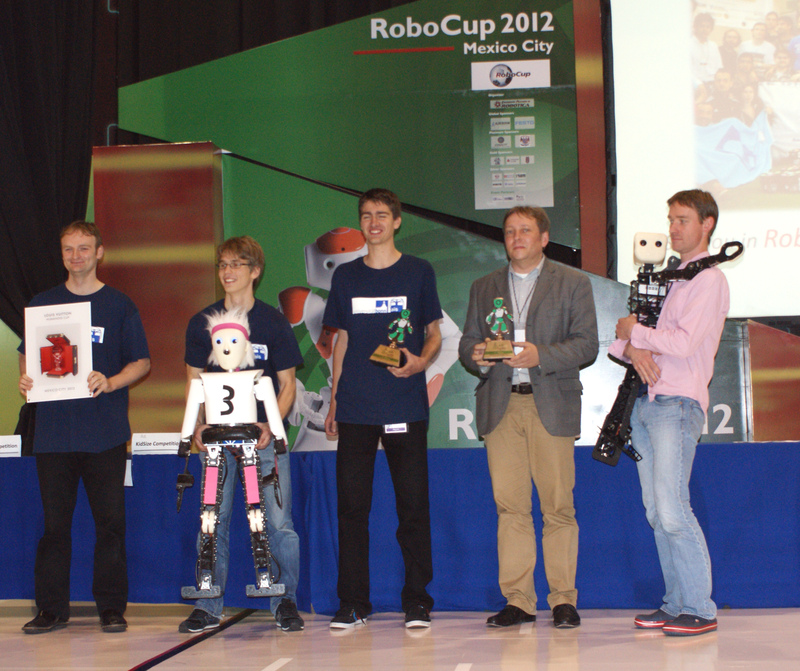 Our robots also won the Drop-in tournament and the Technical Challenges. 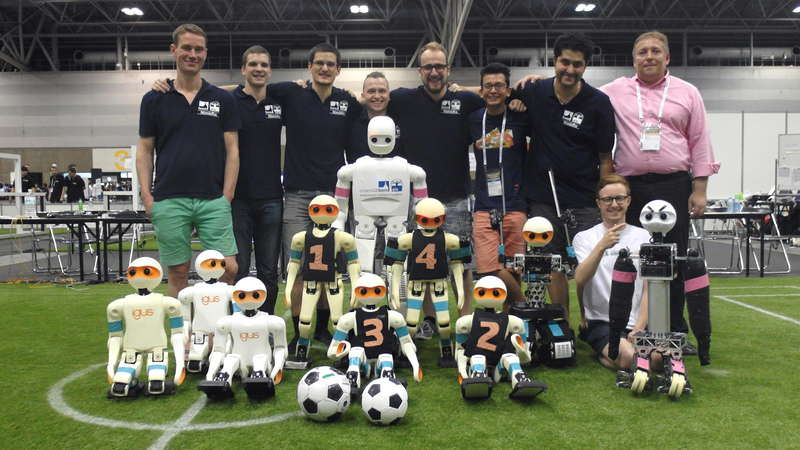 Consequently, our team came in first in the overall Best-Humanoid ranking with 116 points, followed by KidSize winner Rhoban Football Club (France, 113 points) and TeenSize winner Ichiro (India, 98 points). 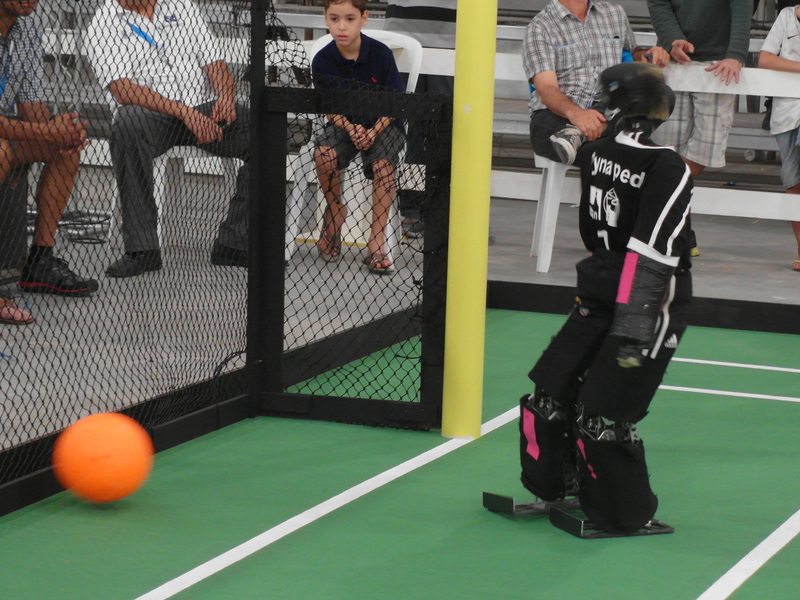 This year, for the first time, 2 vs. 2 drop-in games are played in the AdultSize class. 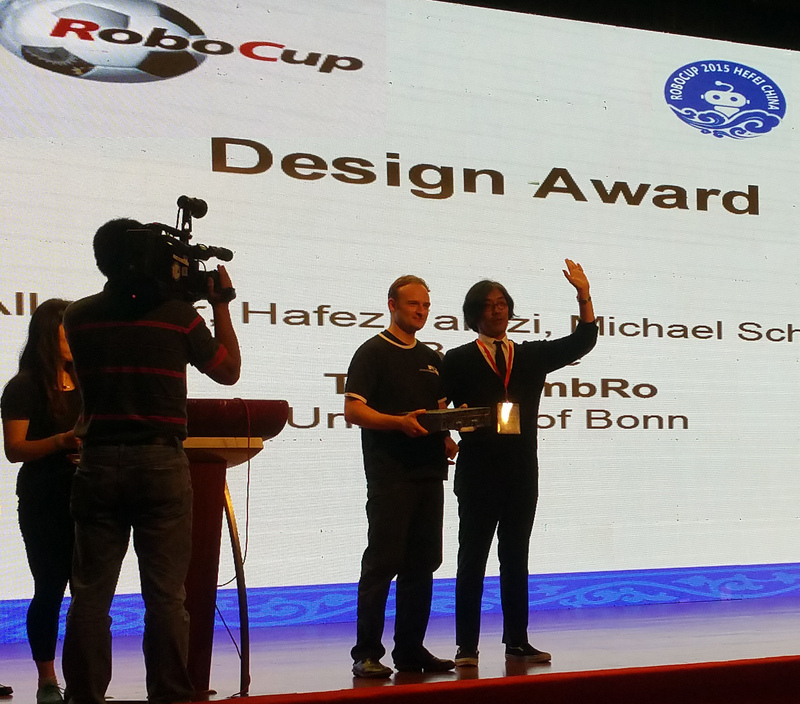 Our team constructed a new robot, NimbRo-OP2X, which has more compute power, a new generation of actuators, and 3D printed gears, as compared to our RoboCup 2017 winner NimbRo-OP2. 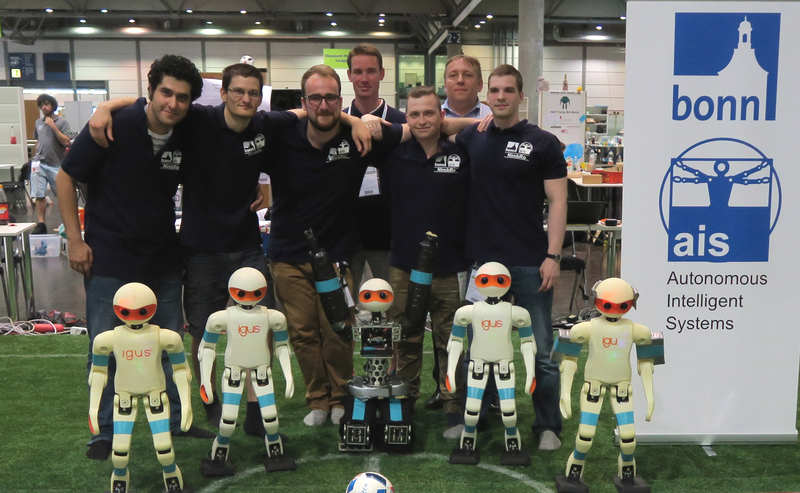 In the Final, our robots met Sweaty (Hochschule Offenburg, Germany) as in 2017. 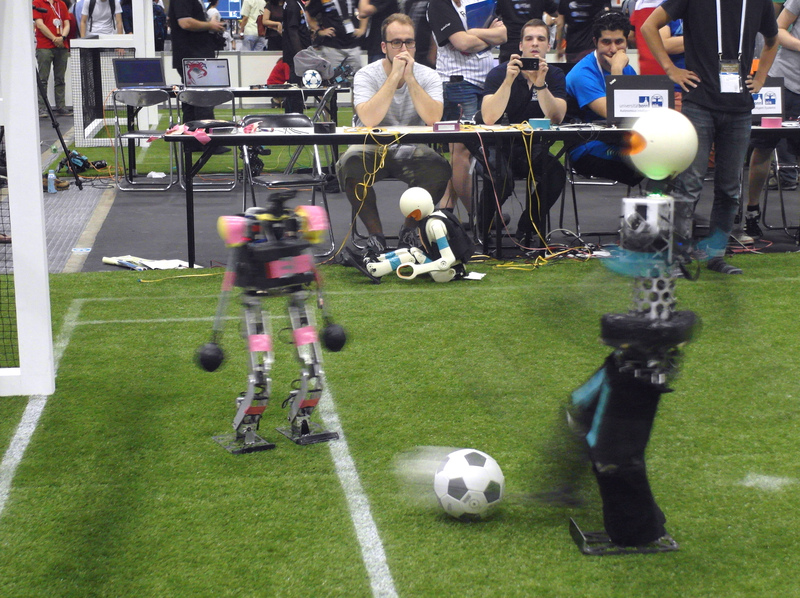 Both teams had very capable robots, which often blocked each other from kicking. 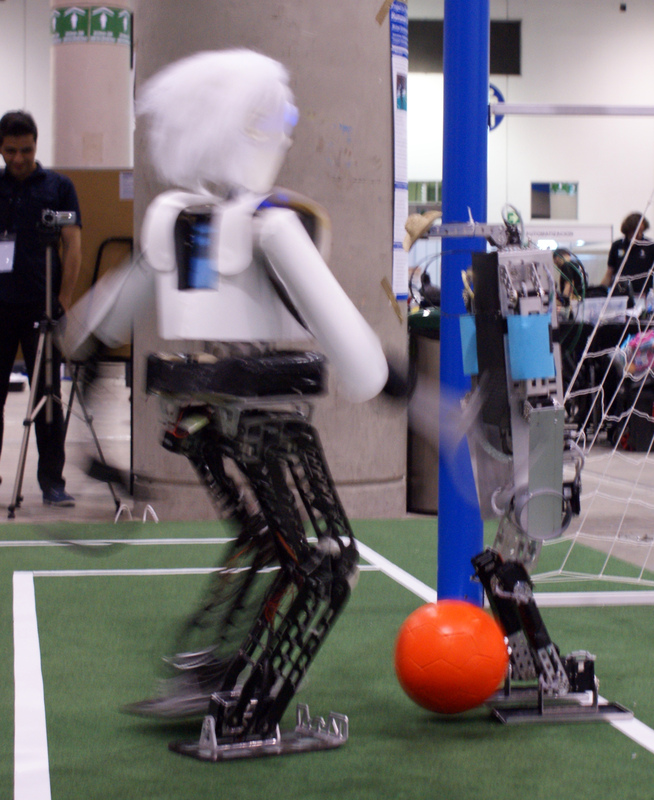 Our robot NimbRo-OP2X had slight advantages in 1 vs. 1 fights, though. 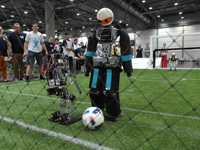 Consequently, after a half-time score of 1:0, the game ended 2:0 for NimbRo. In the semi-final, our robots met Tsinghua Hephaestus (China). 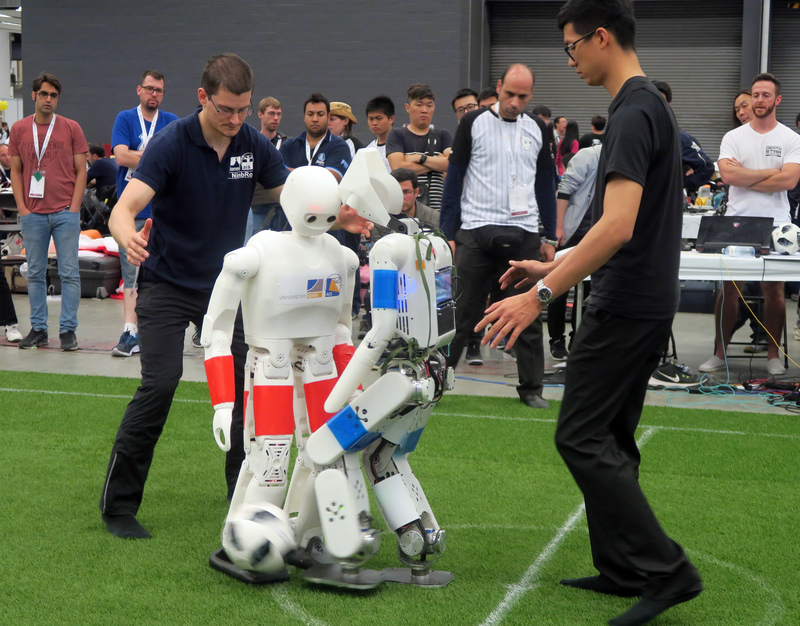 The Chinese robot played very stable and kicked extremely strong, but our robot NimbRo-OP2X was faster and had advantages in 1 vs. 1 fights. 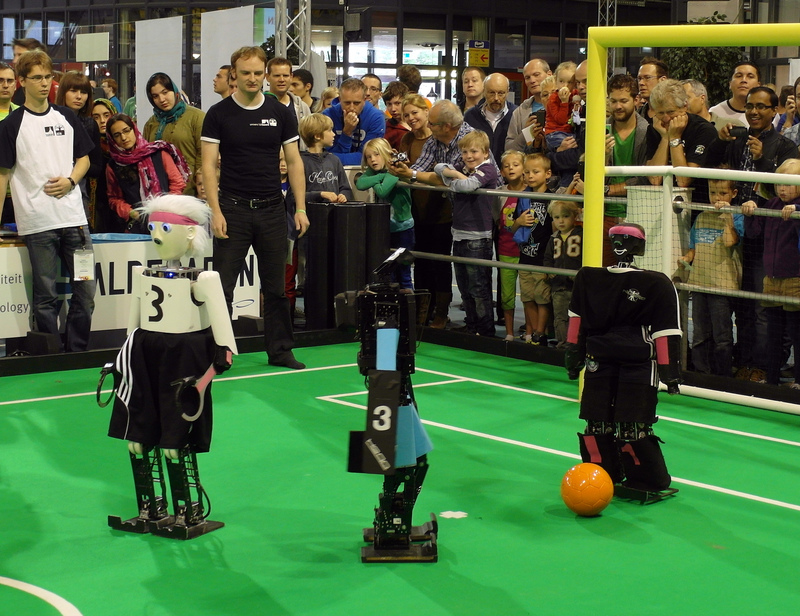 After a half-time score of 4:1, the game ended 7:4 for NimbRo. 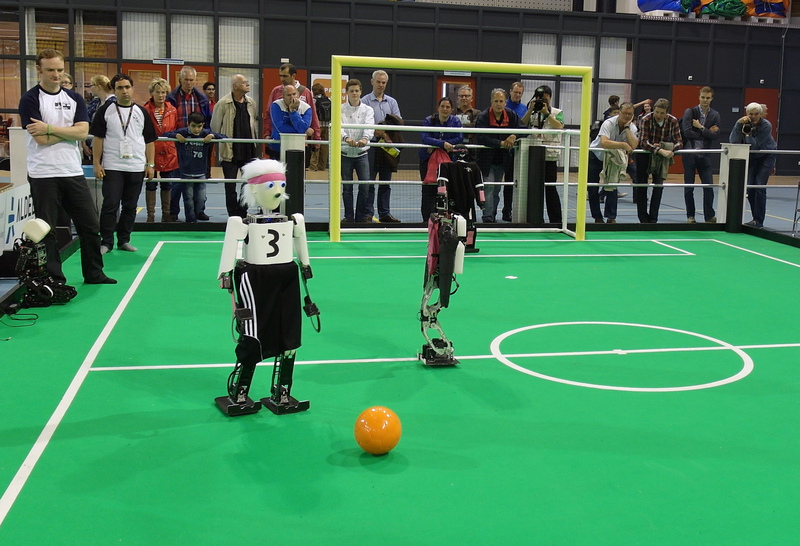 Our robots clearly won the quarter final of the soccer tournament 16:0 vs. CIT Brains & Team KIS (Japan). 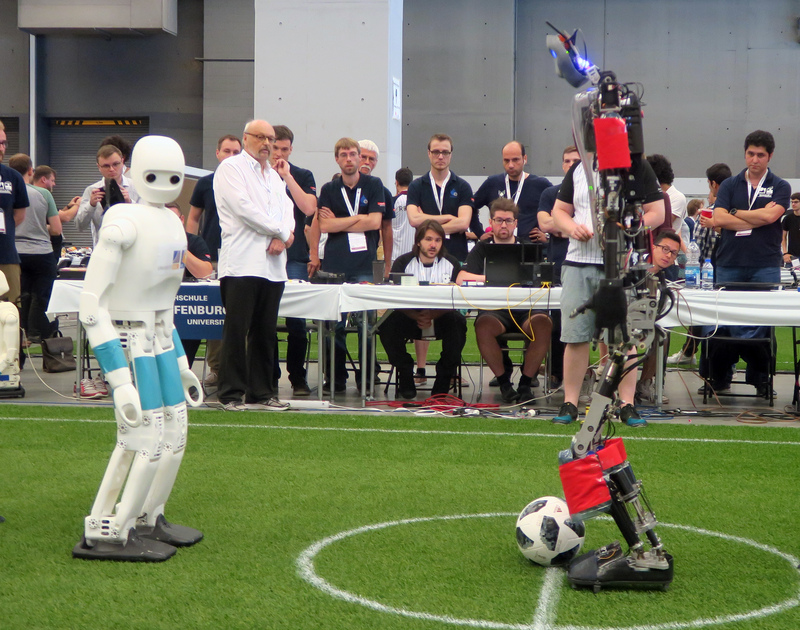 In the Technical Challenges, our robots quickly scored a moving ball, kicked the ball over an obstacle, withstood significant impacts from a swinging mass, and jumped high for a short moment. 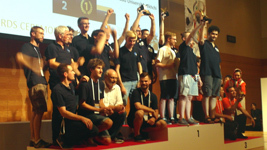 Overall, they won the Technical Challenges with 26 points, followed by Tsinghua Hephaestus (China, 25 points) and ZSTT (Taiwan, 20 points). 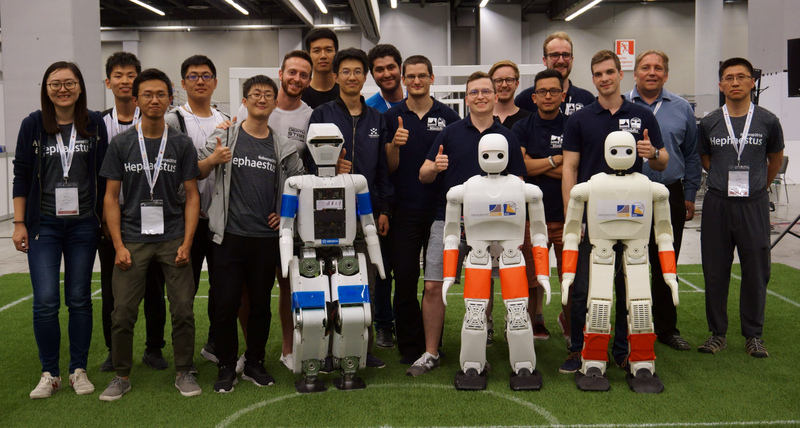 Our robots also won their last drop-in game 3:1, confirming their victory in the first Humanoid AdultSize Drop-in Tournament with a total of 51 points, followed by Sweaty (Hochschule Offenburg, Germany) with 29 points and Tsinghua Hephaestus (China) with 5 points. 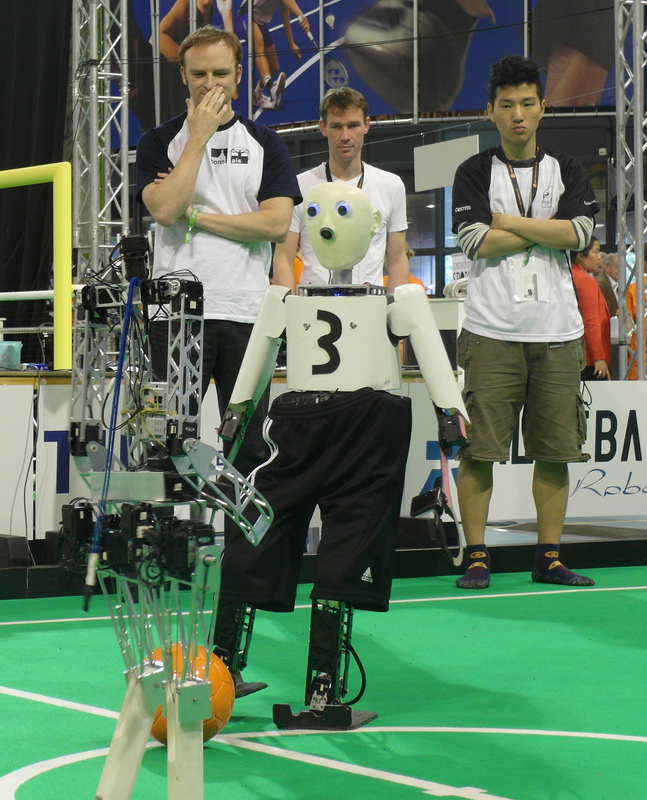 Our robots won their third round robin game 6:0 vs. ZSTT (Taiwan). 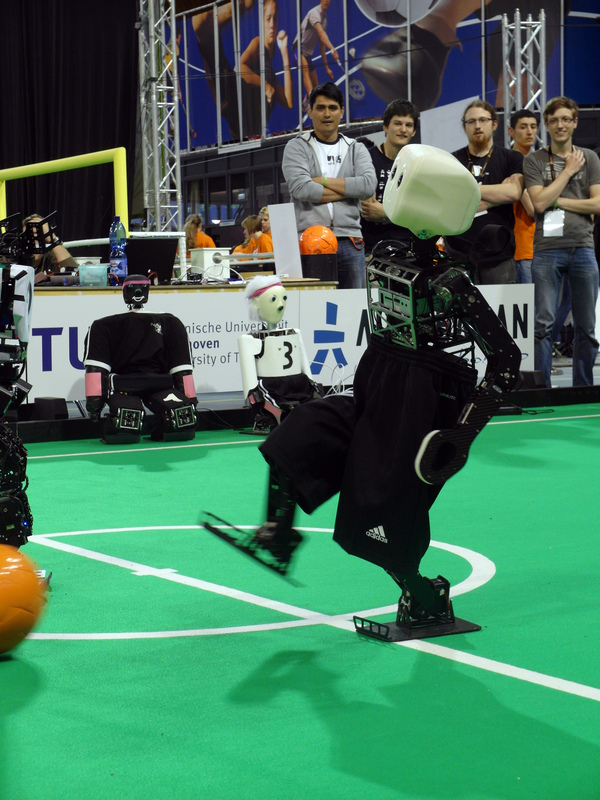 They also scored 14:0 goals in two more drop-in games. 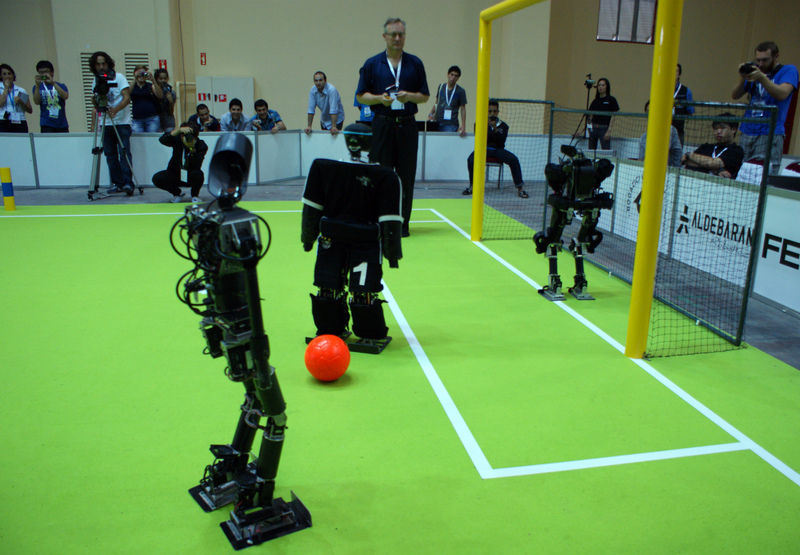 Hence, NimbRo won its round robin group with 16:0 goals from three games. 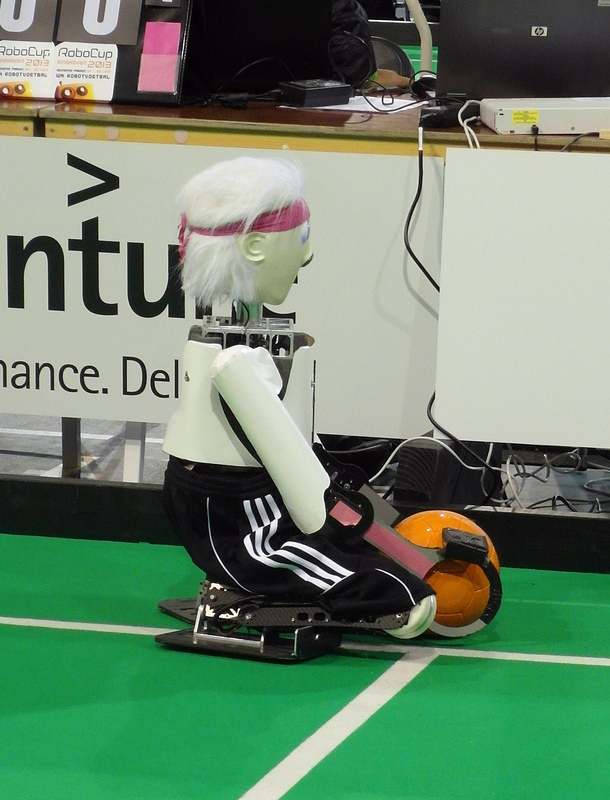 NimbRo is also leading the drop-in competition with a total of 46 points, followed by Sweaty (20 points). 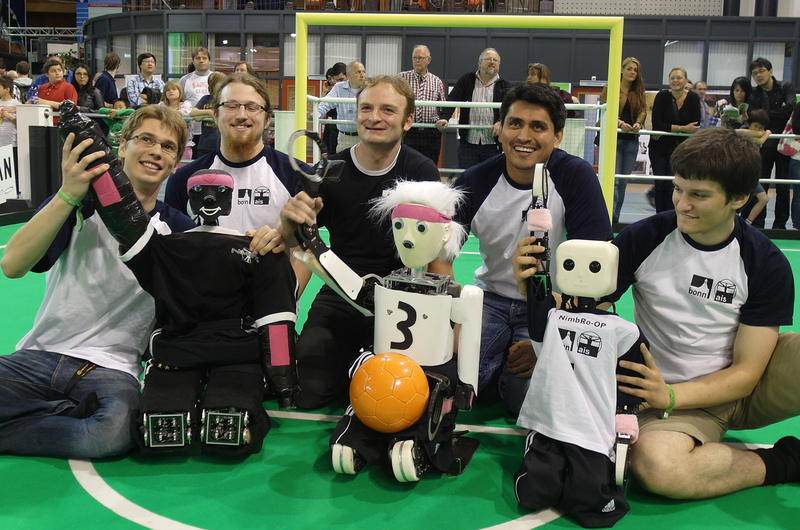 Our robots won all four games of the first competition day - two round-robin games and two drop-in games - with a total score of 18:0 goals. 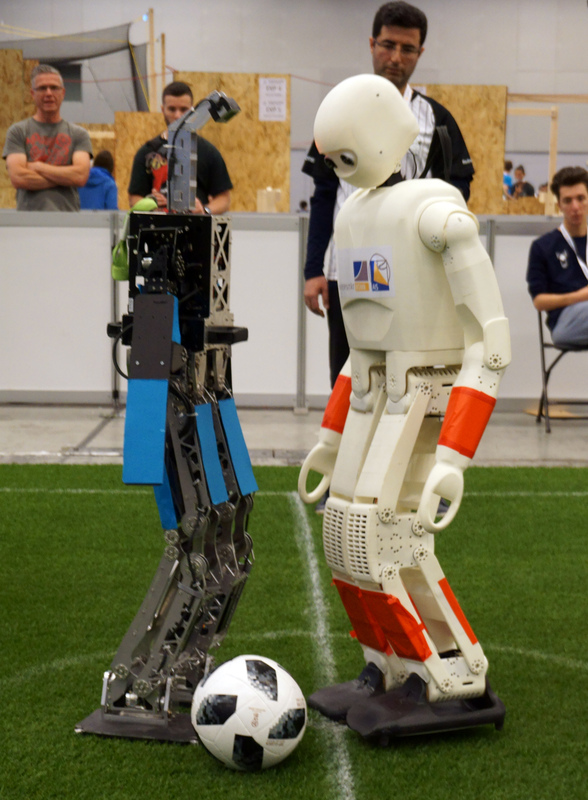 All three of our robots participated in the games, including the newest NimbRo-OP2X, last-year's champion NimbRo-OP2 and our veteran robot Copedo. 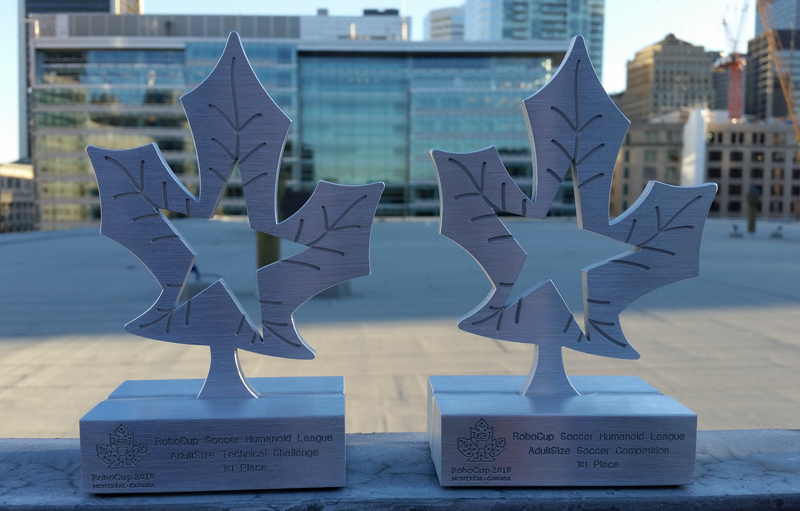 Team NimbRo wins both AdultSize and TeenSize Soccer games, Technical Challenges, Drop-in Challenge, Design Award. 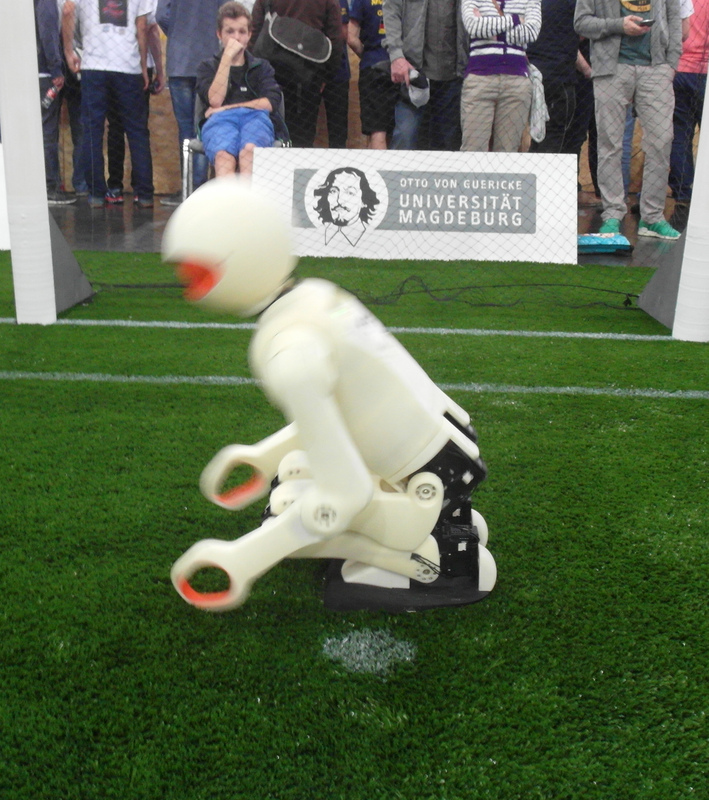 In the final game of the AdultSize soccer tournament our NimbRo-OP2 robot met Sweaty (Hochschule Offenburg, Germany). Both players were capable. 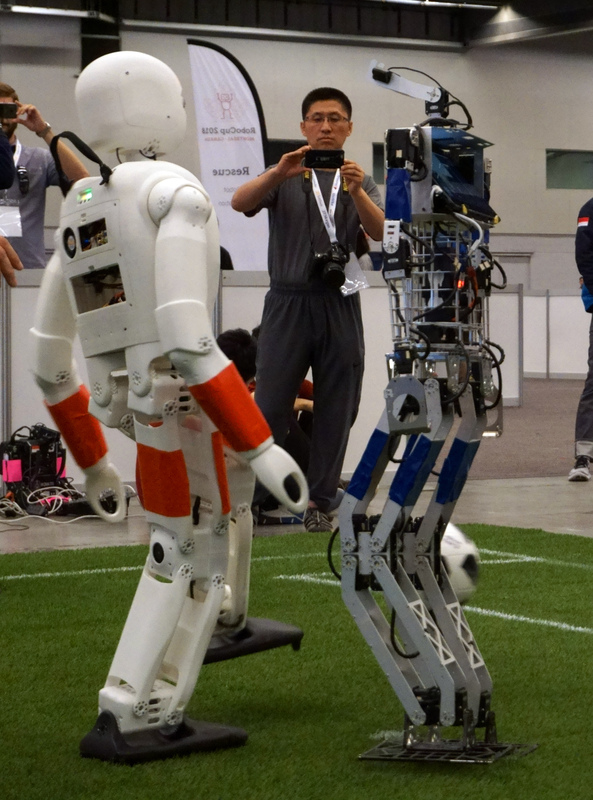 They walked quickly, saw the ball reliably and kicked strongly. 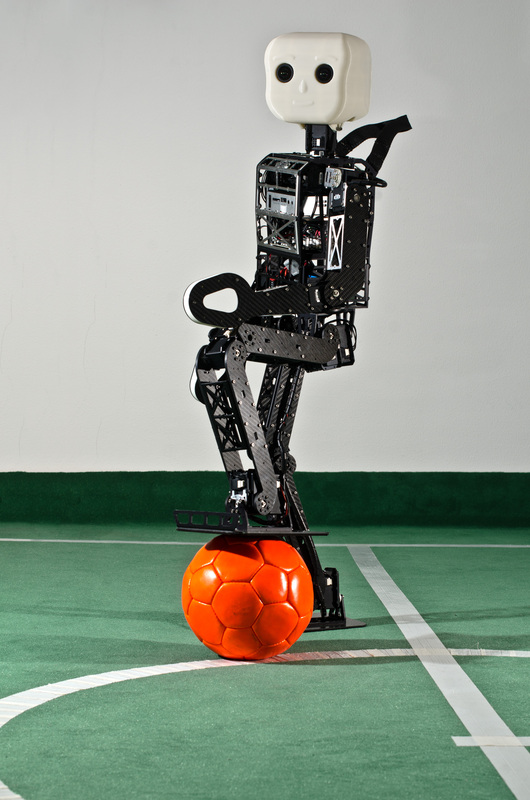 NimbRo had advantages in fights for the ball and maintained a very stable balance. 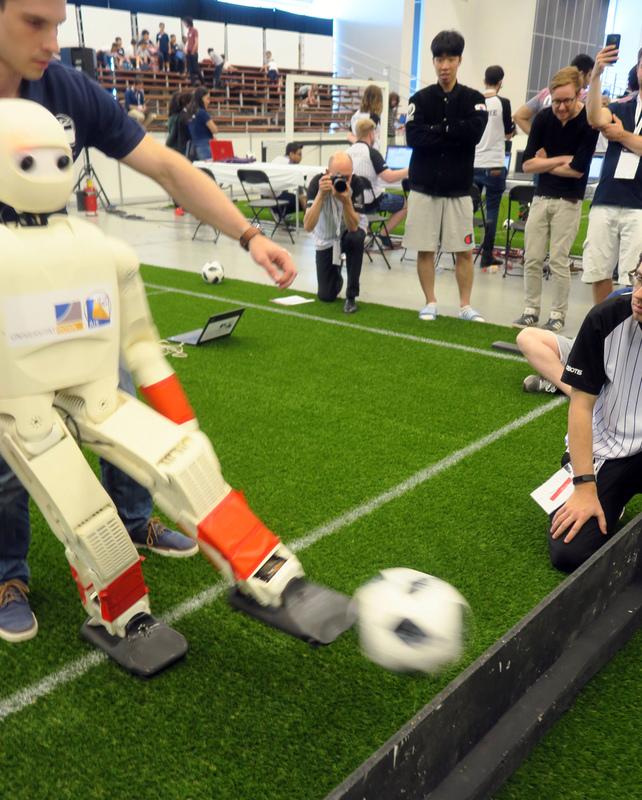 It scored one goal after the other. 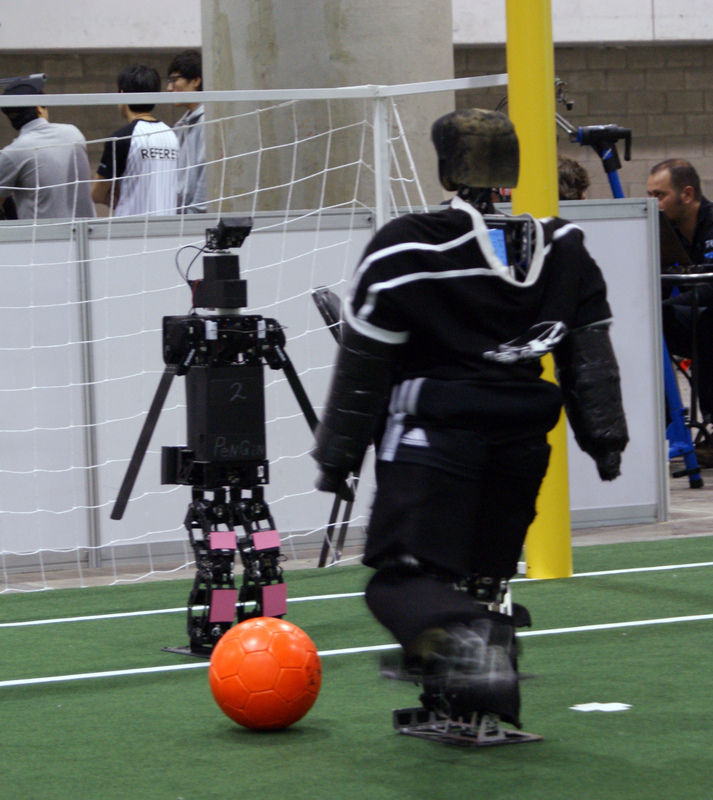 After 7:0 at half time, the game ended early with a score of 11:1 for NimbRo. 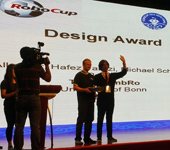 The NimbRo-OP2 robot also received the RoboCup Design Award. 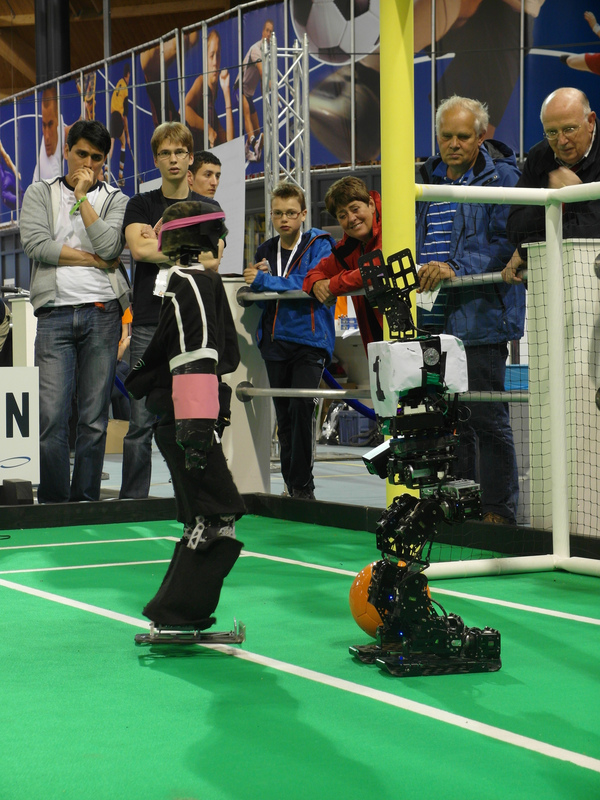 Our TeenSize robots also won their final game 2:0 vs. HuroEvolutionTN from Taiwan. 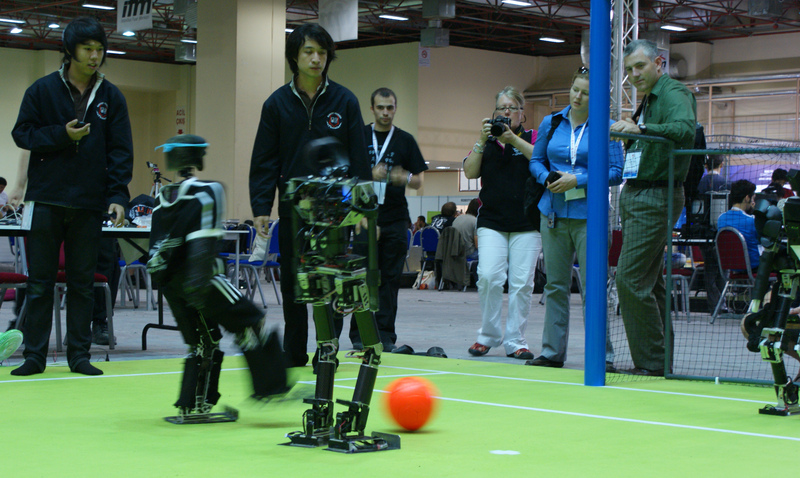 In the AdultSize semi-final our robots met team IRC from Iran. 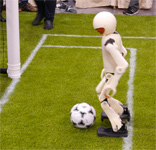 The NimbRo-OP2 robot scored reliably. 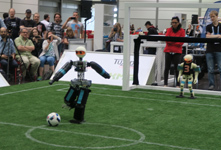 The half-time score was 7:0 and at a score 9:0 we substituted it to give our second robot Copedo also a chance to play. 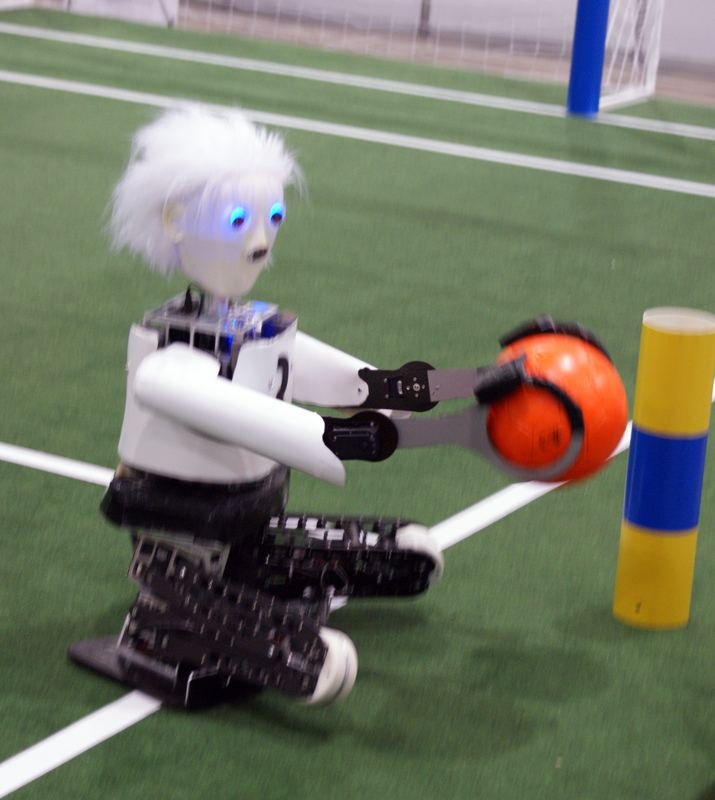 The game ended 9:0 for NimbRo. 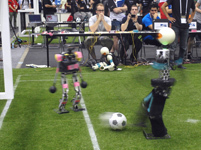 Our TeenSize robots played two more round robin games: 3:0 vs. HuroEvolutionTN (Taiwan) and 2:0 vs. AUTMan (Iran & Canada). 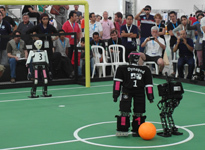 They came in 1st in the round robot with 25:0 goals from six games. In the TeenSize technical challenge, our robots scored in all four challenges: kicking the ball high, kicking a moving ball, jumping high and, continuing to walk after being hit by a mass on a pendulum. 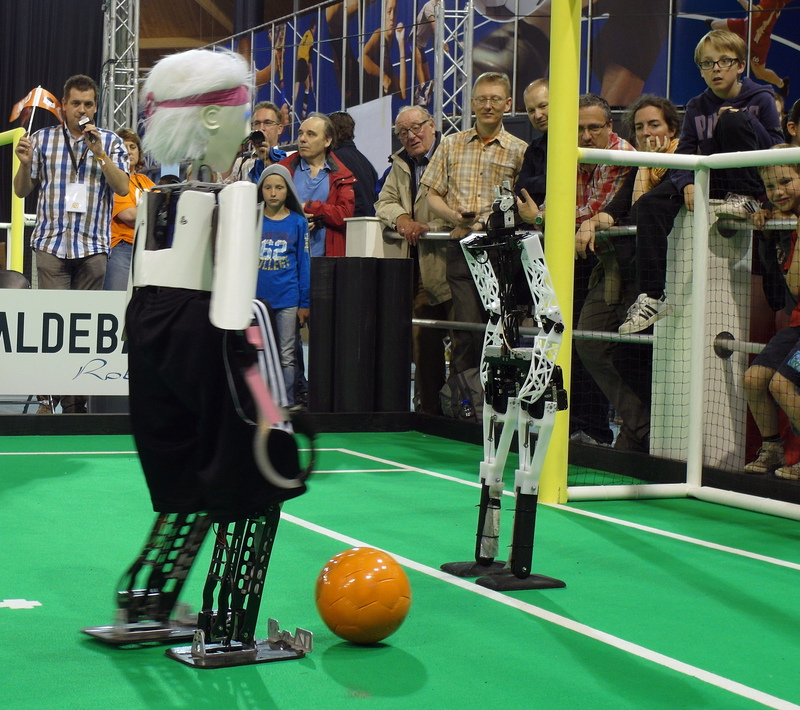 Our robots NimbRo-OP2 and Copedo also scored well in the AdultSize technical challenges. 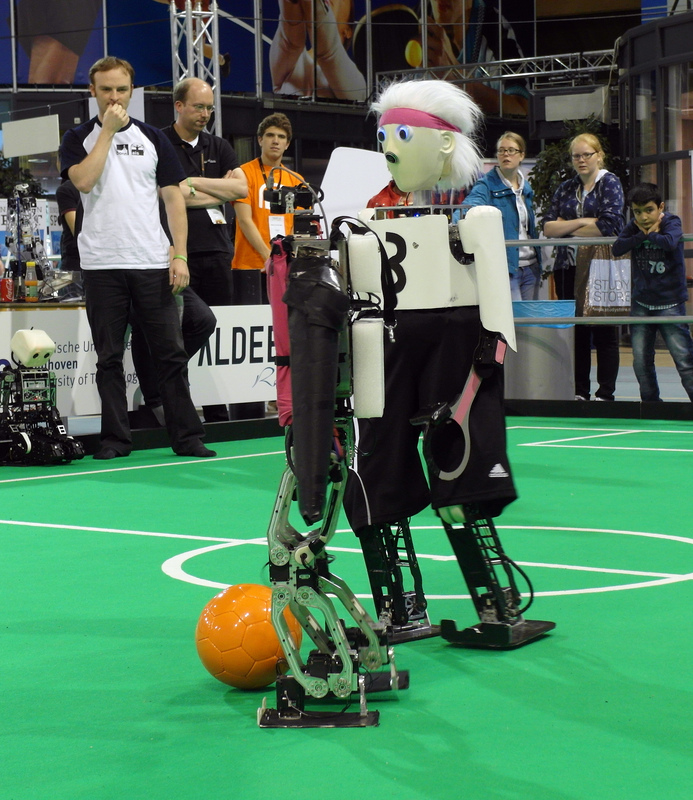 Both, the TeenSize and the AdultSize robots won the Techical Challenges in their size class.with 34 and 15 points, repectively. 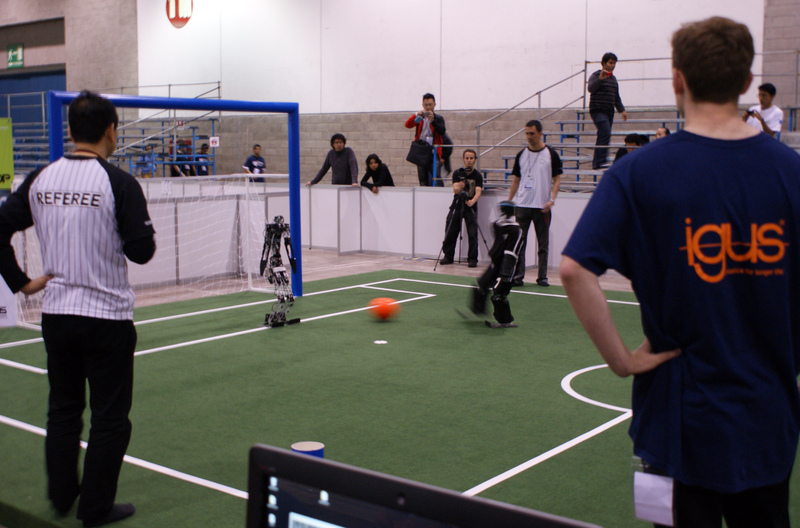 NimbRo TeenSize also won the drop-in challenge, where games were played in randomly assigned teams. 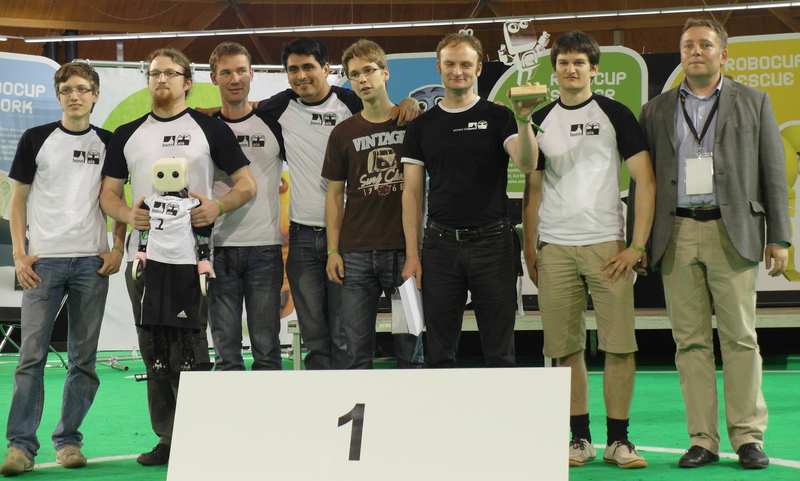 Our AdultSize robot NimbRo-OP2 met team ZSTT and won 8:0. 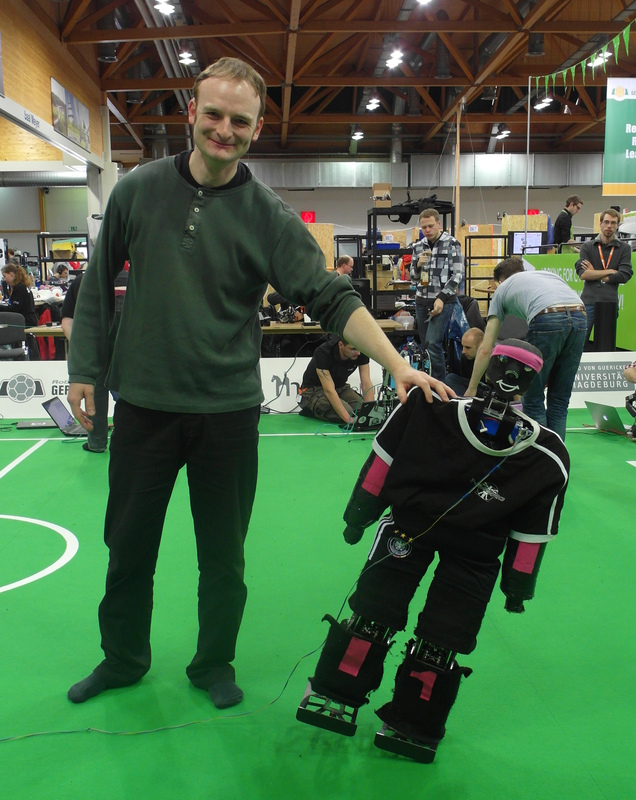 This was the last round robin game. 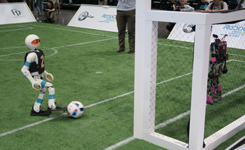 NimbRo AdultSize won its group with 26:0 goals from three games. 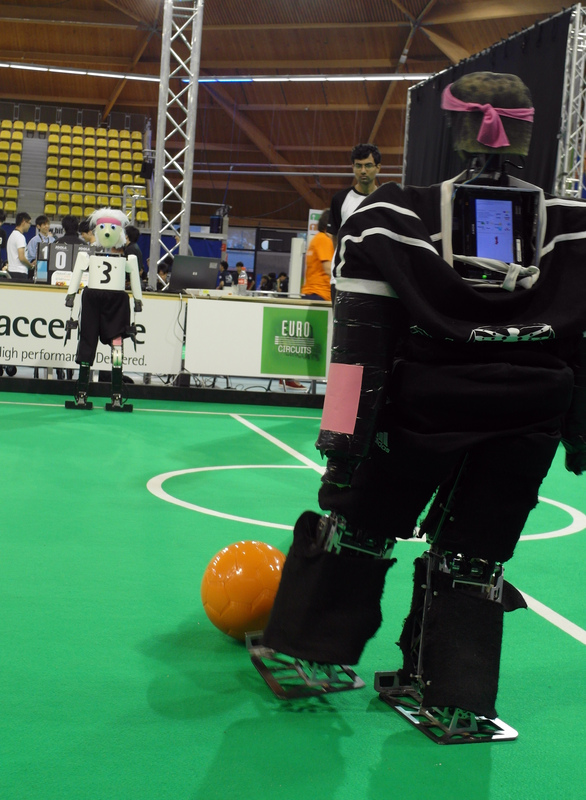 The TeenSize robots also won their round robin games: 5:0 vs. WF Wolves & Taura Bots and 5:0 vs. T-FLOW, For the first time, three NimbRo TeenSize robots played together in a regular game. 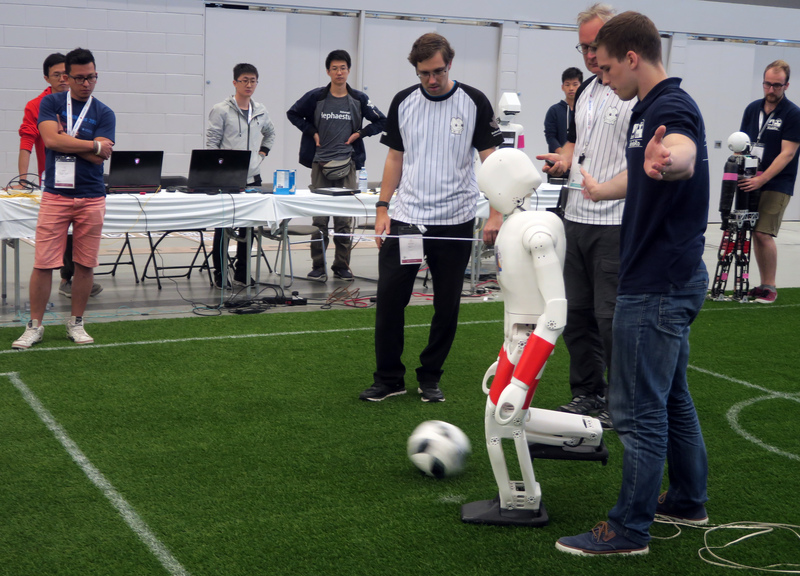 The first goal of the RoboCup Humanoid League Soccer tournament in Nagoya was scored by a robot of our team NimbRo TeenSize. In total, our robot scored four goals in this drop-in game and two goals in a second drop-in game. 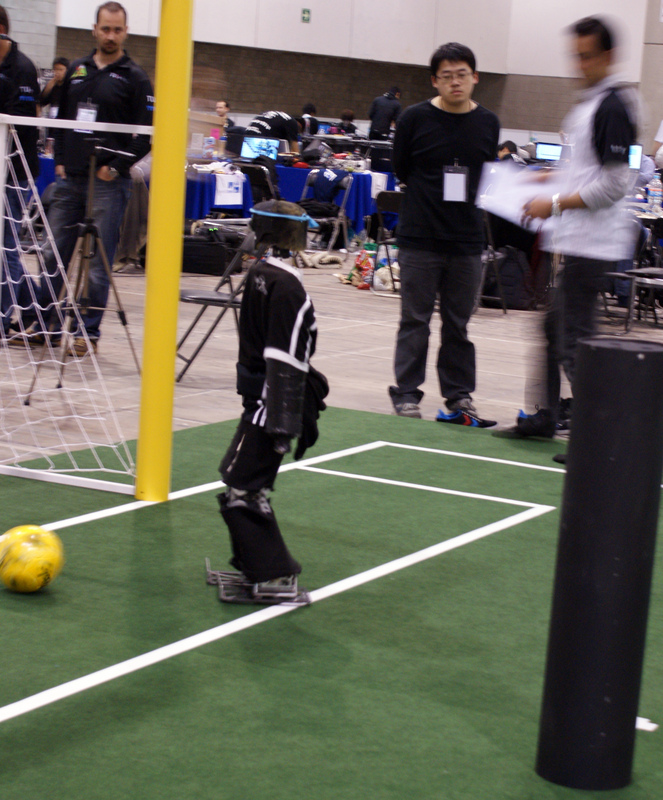 Our new AdultSize robot NimbRo-OP2 played its first round robin game vs. CIT Brains from Japan very well. 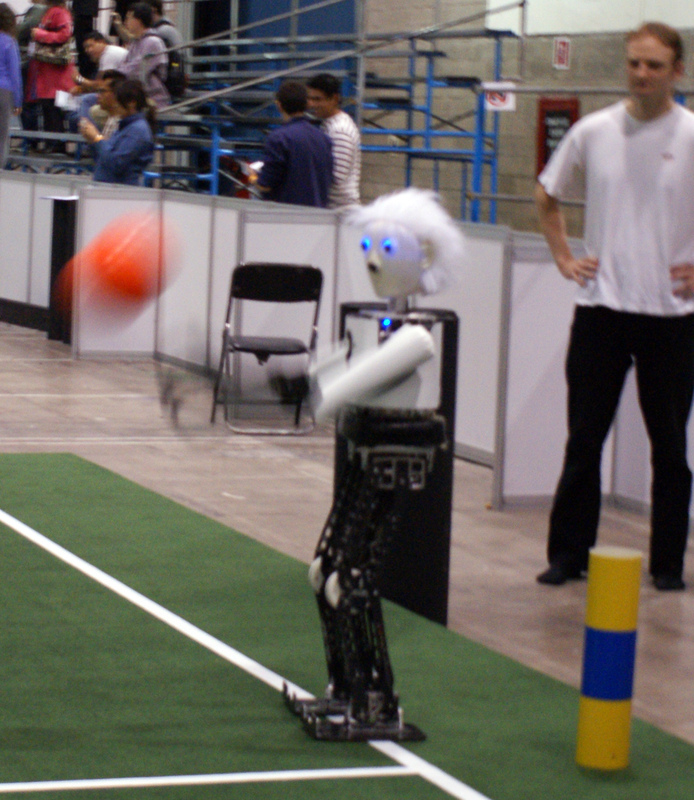 The game ended early 10:0 for NimbRo. 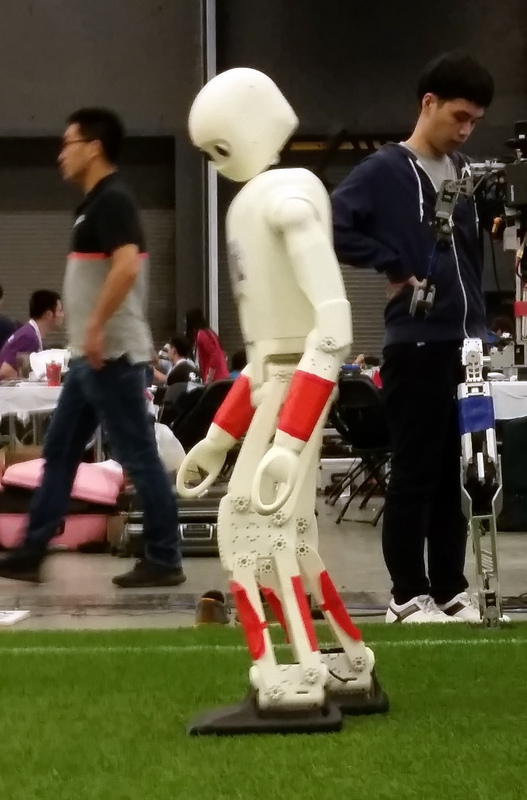 Our robot also won its second round robin game 8:0 vs. team KIS from Japan. 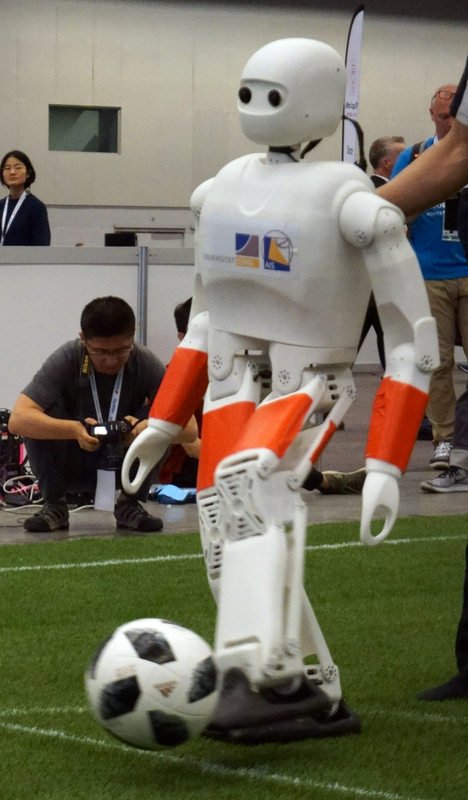 Our TeenSize robots also won their round robin games: 5:0 vs. aiRobots from Taiwan and 5:0 vs. team AcYut from India. 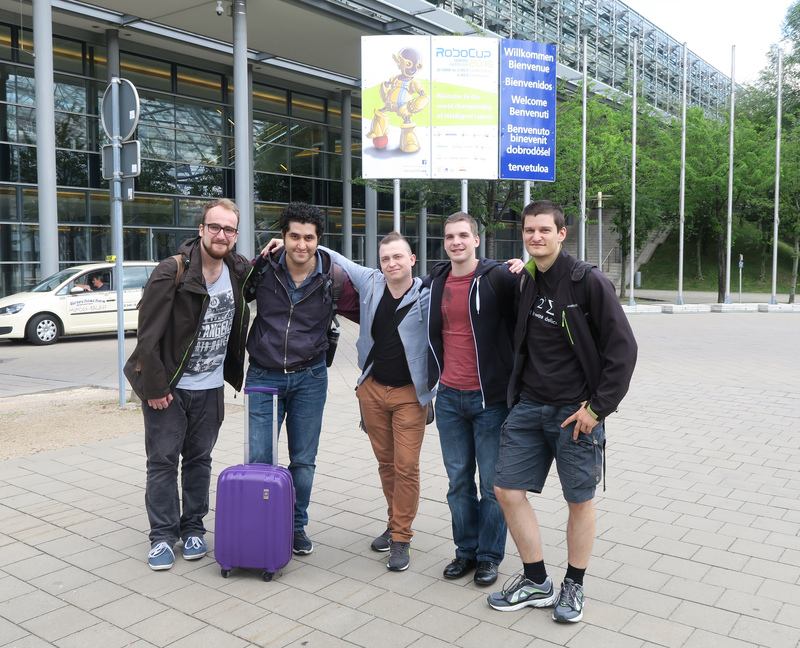 Our team arrived at the RoboCup venue in Nagoya. 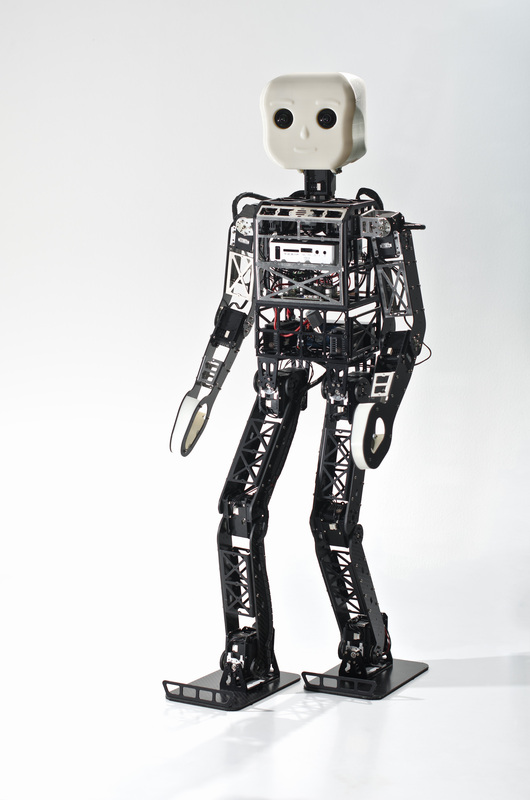 We assembled the robots and are setting-up the system. 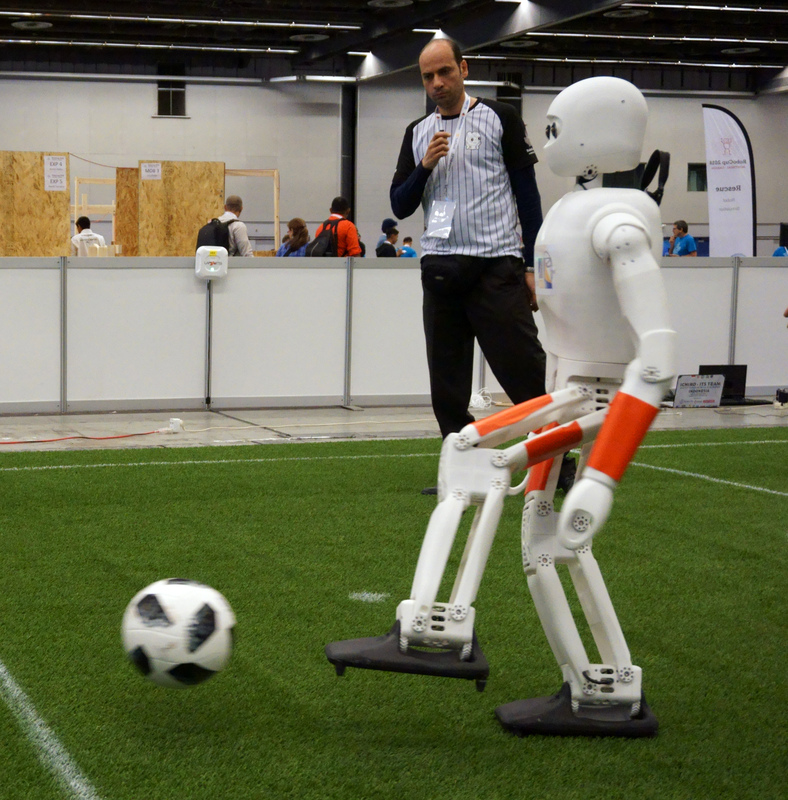 This year, the number of players in the TeenSize class has been increased to 3 vs. 3, which will allow for more team play. 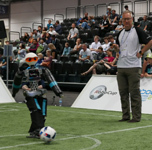 We also participate in the AdultSize class, where for the first time 1 vs. 1 soccer games will be played. 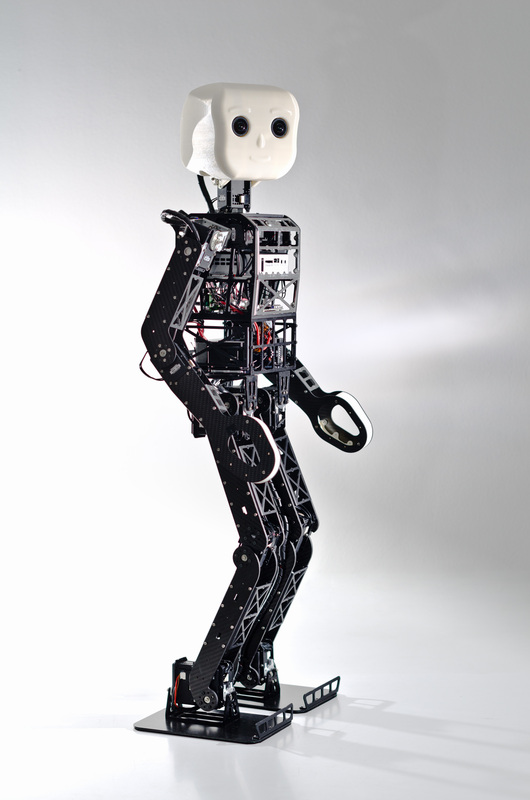 For this, we constructed a 135cm tall 3D printed robot: NimbRo-OP2. 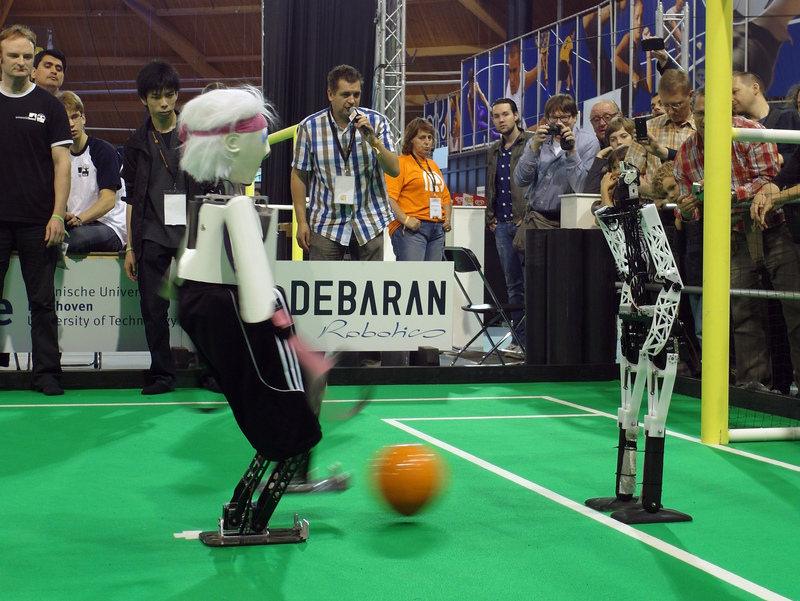 Our team NimbRo is qualified for the RoboCup 2017 Humanoid League TeenSize and AdultSize competitions in Nagoya, Japan. 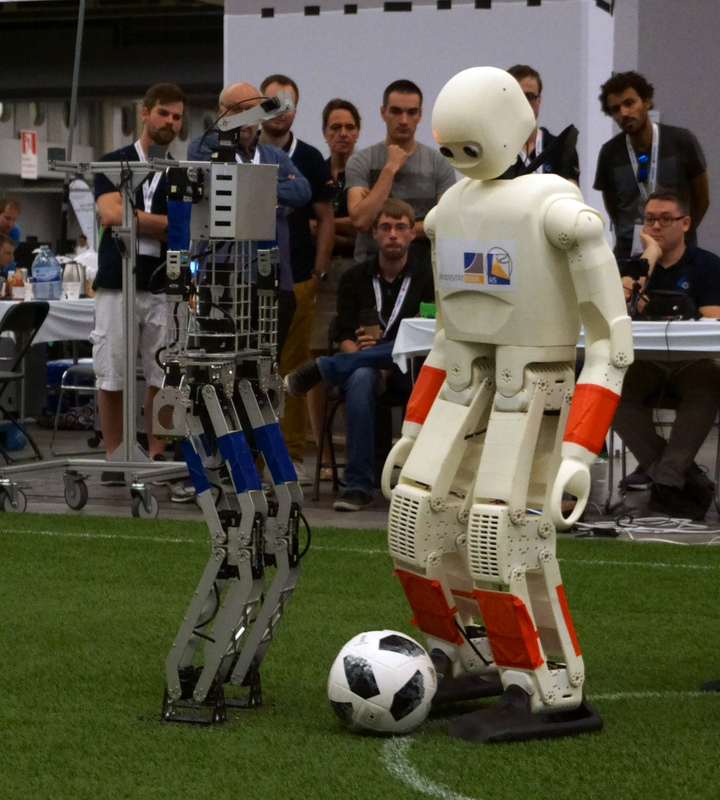 Our team NimbRo won the soccer tournament of the RoboCup 2016 Humanoid TeenSize class. 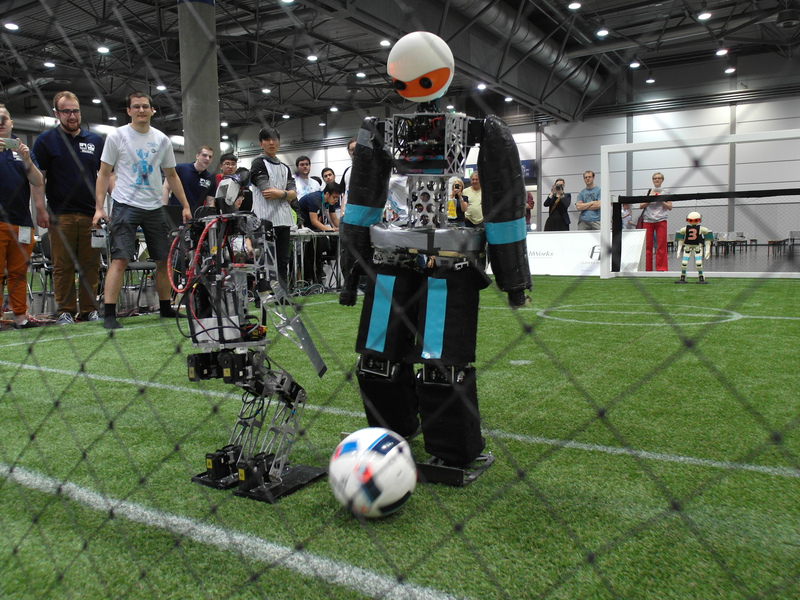 The final game vs. HuroEvolutionTN (Taiwan) was dominated by our robots Dynaped and igus Humanoid Open Platform. 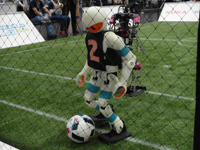 After a half-time score of 3:0 the game ended 9:0 for Nimbro. 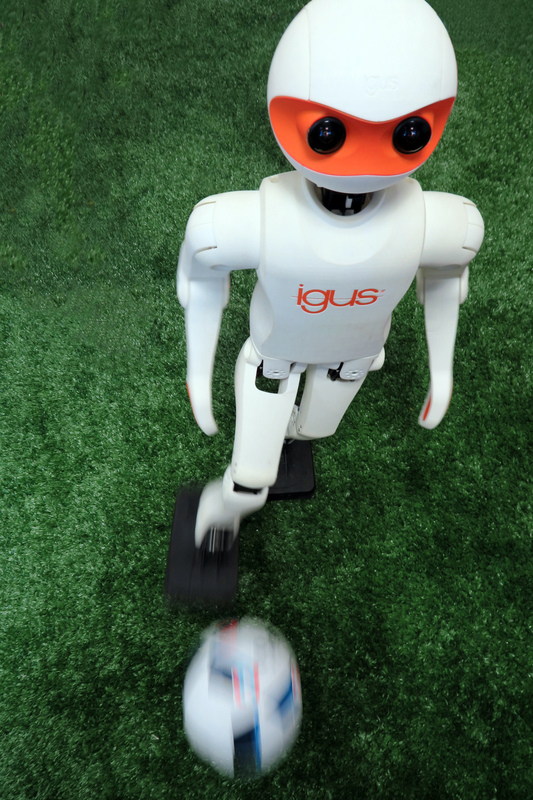 In total, our robots scored 29:0 goals in five games. 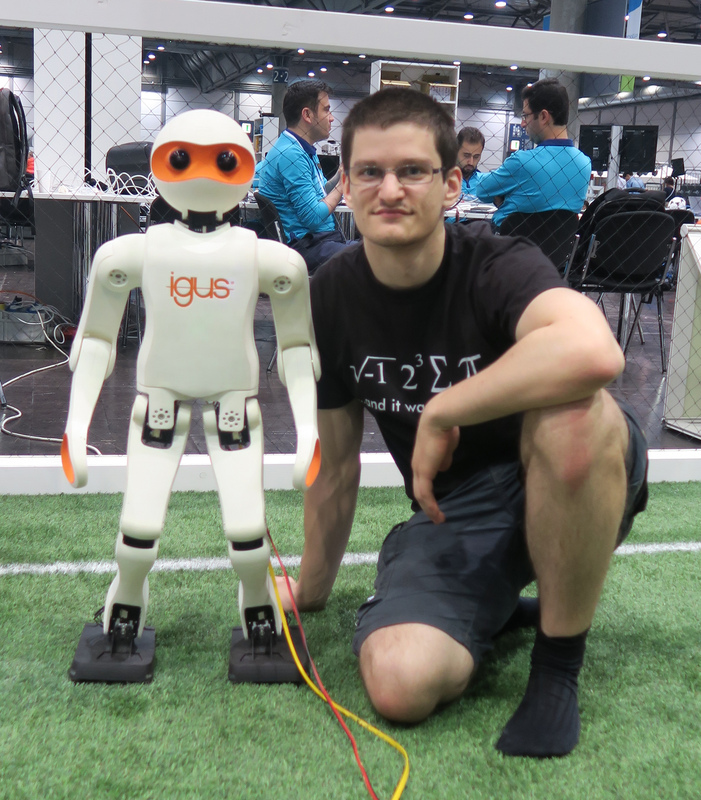 Our igus Humanoid Open Platform robot also received the First International Harting Open-Source Award. 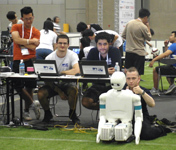 In the semi-final, NimbRo met the 4th of the round robin: AUTMan (Iran, Canada). 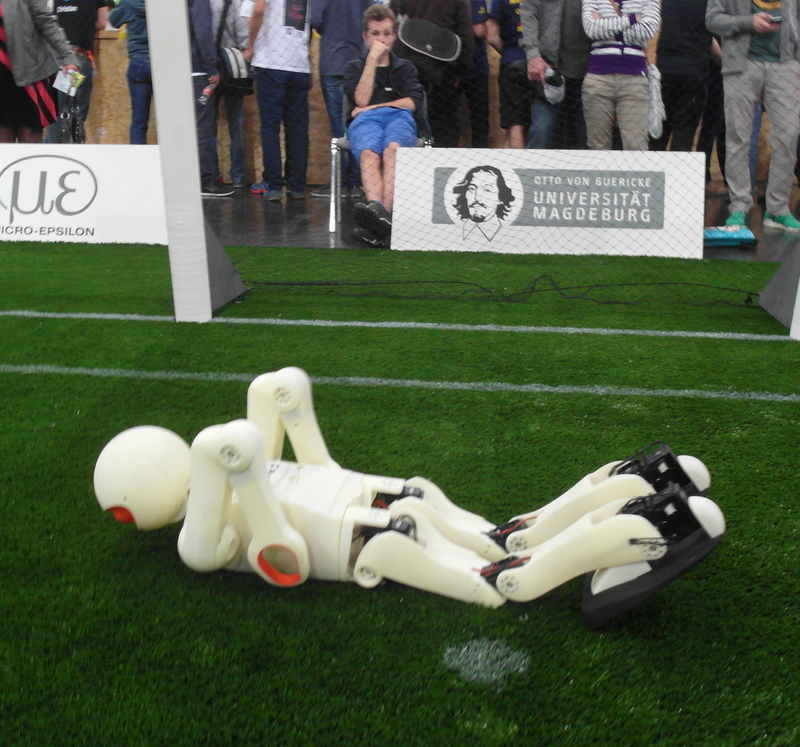 Again our robots played very well and won the game without difficulty 5:0. 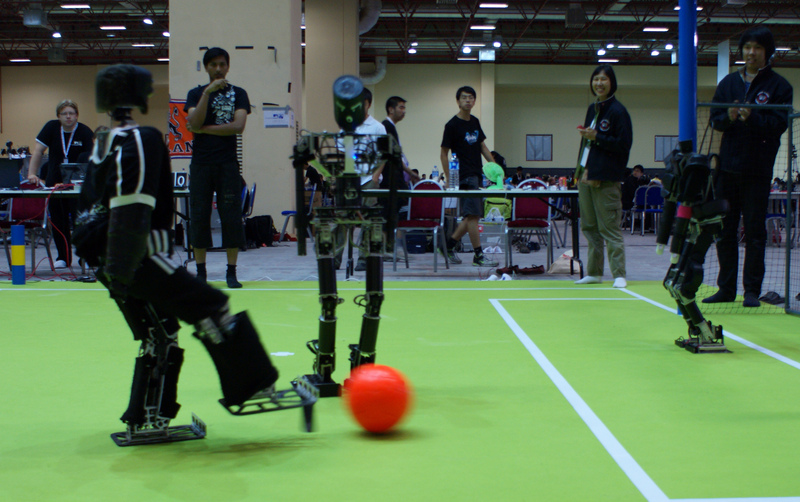 The second round robin game was played vs. HuroEvolutionTN from Taiwan. 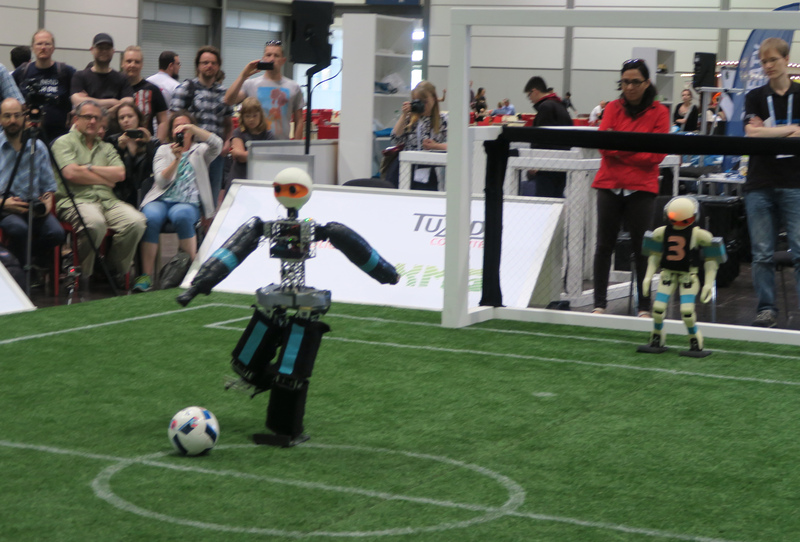 All goals were scored in the first half, including a self-goal of HuroEvolutionTN. 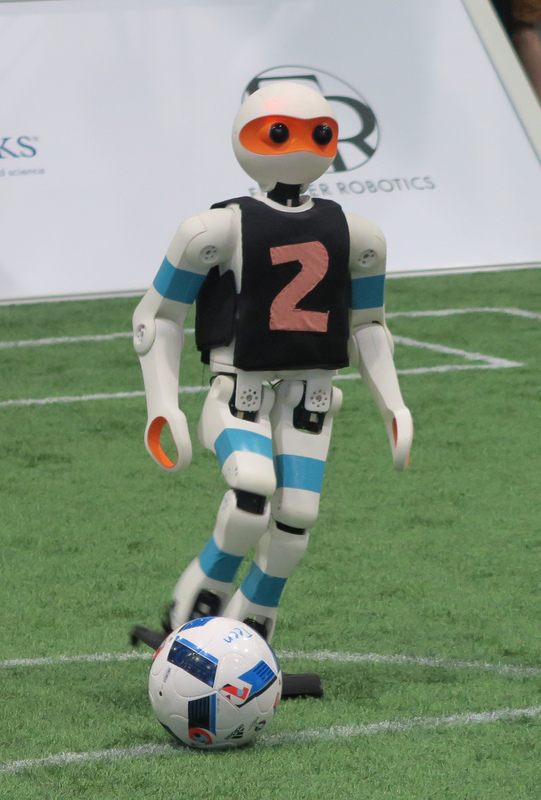 The game ended 4:0 for NimbRo. 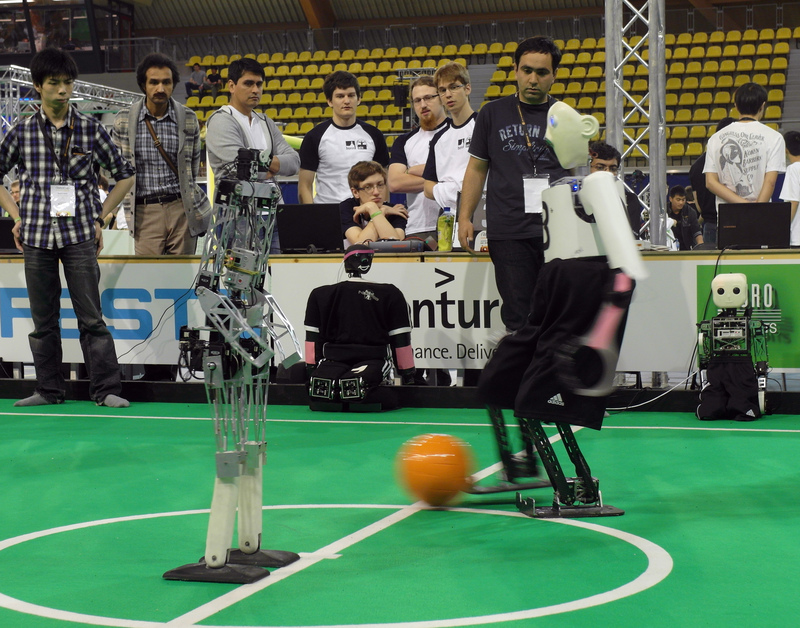 In the third and final round robin game, our robots met the joint team WF Wolves & Taura Bo. 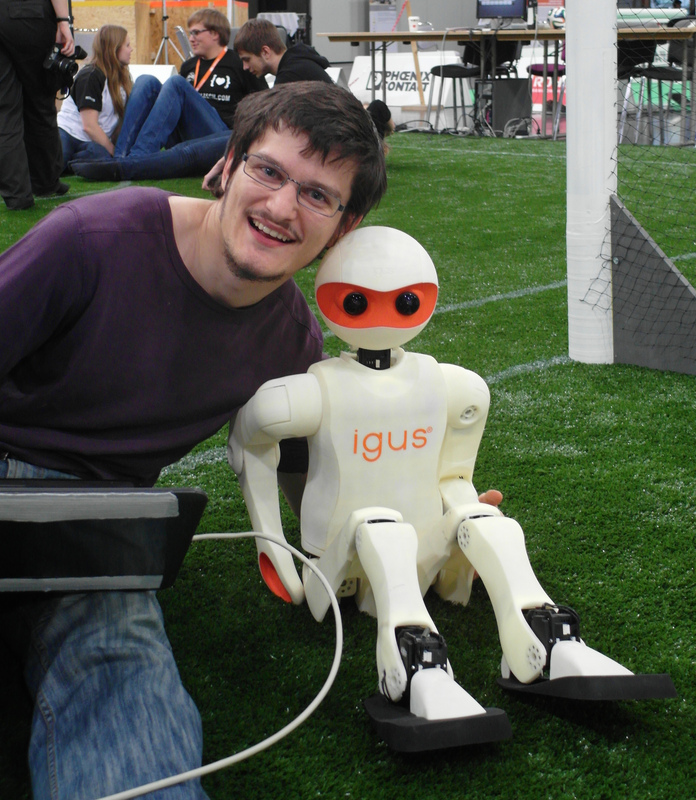 Dynaped and the igus Humanoid Open platform scored reliably. 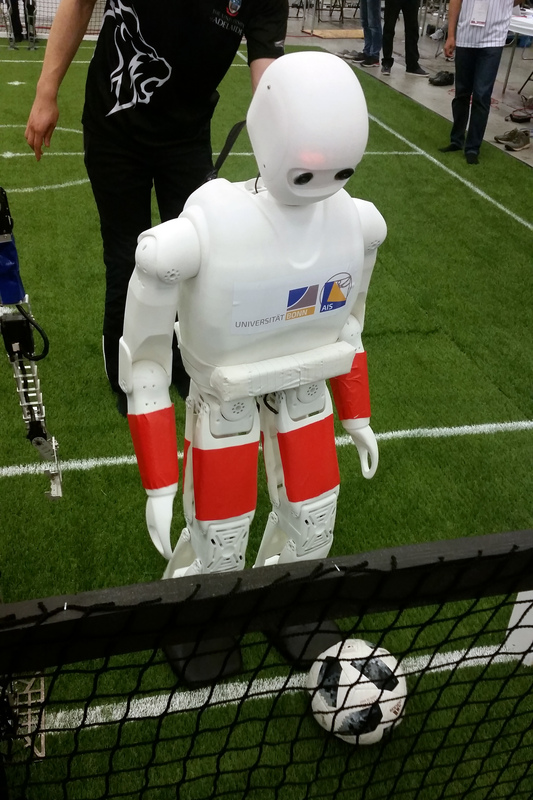 The game ended 5:0 for NimbRo. After winning all thee games, NimbRo is first in the round-robin. 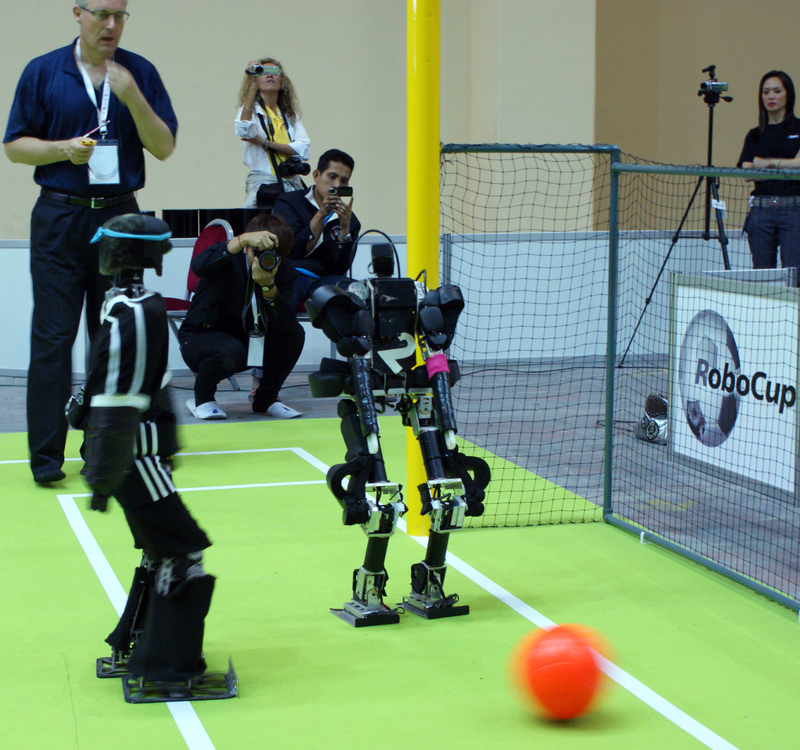 Our robots won their first game 6:0 vs. AUTMan (Iran, Canada). 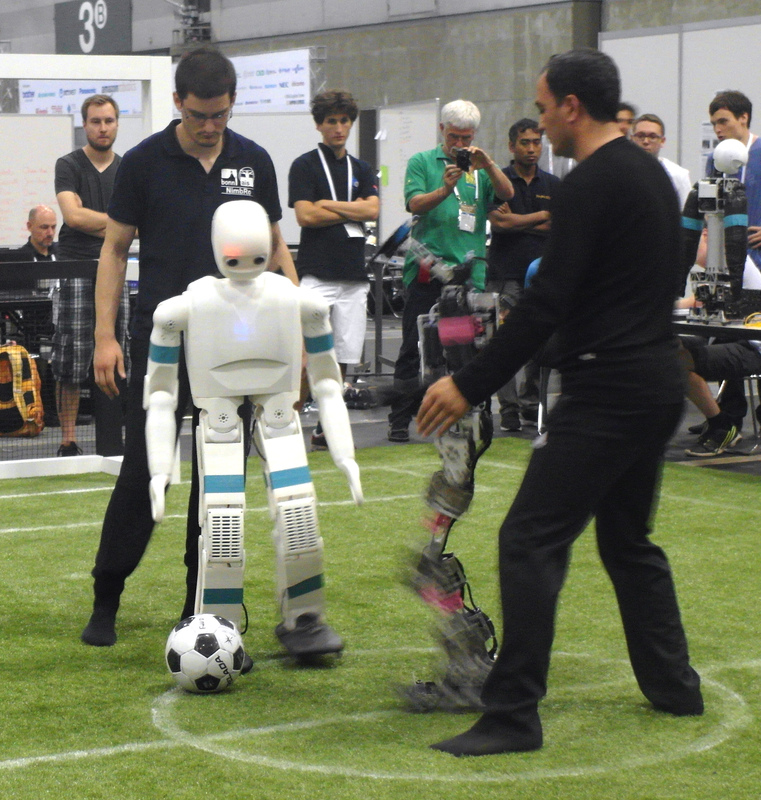 Half-time score was 4:0. 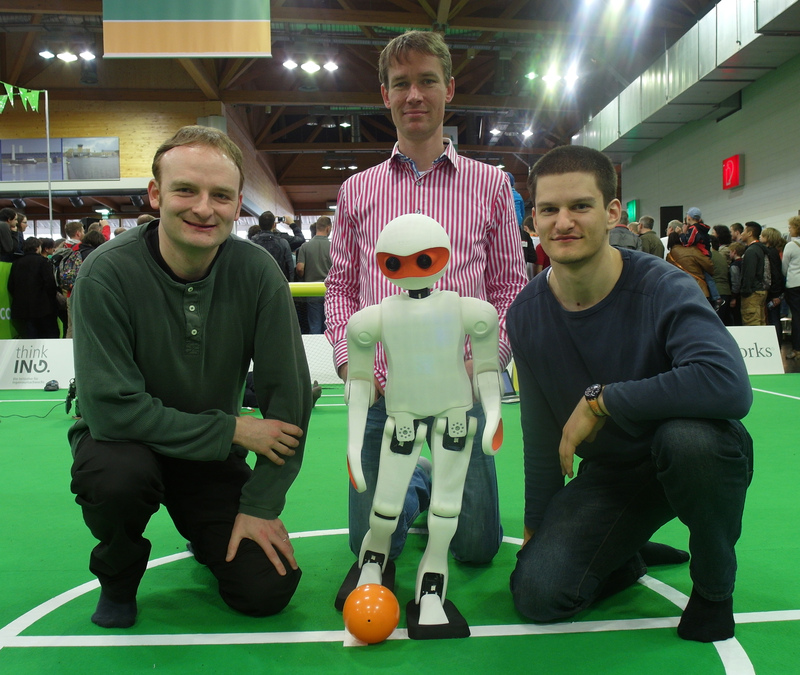 Our team NimbRo TeenSize arrived at Leipziger Messe and is setting up the robots for the RoboCup Humanoid League soccer competition. 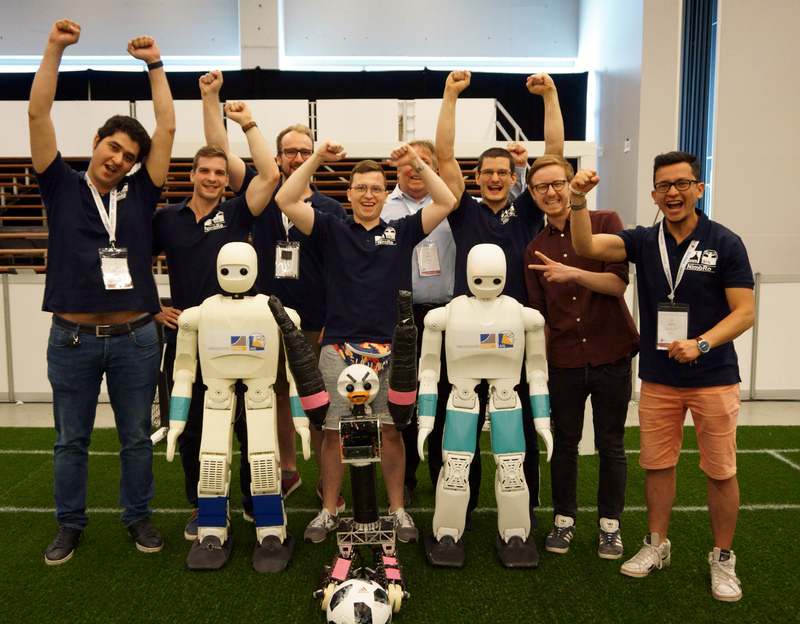 Our team NimbRo is qualified for the TeenSize class of the Humanoid League for the RoboCup 2016 competition in Leipzig, Germany. 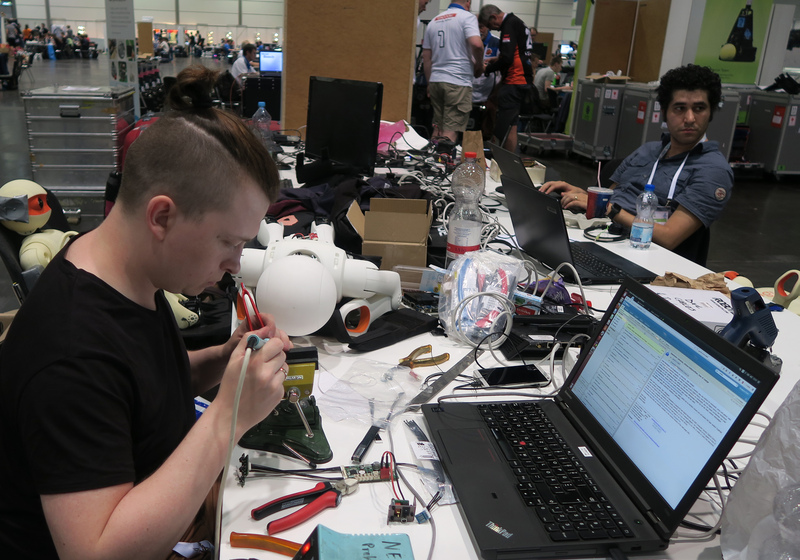 After two setup days, the tournament will start on July 30th. 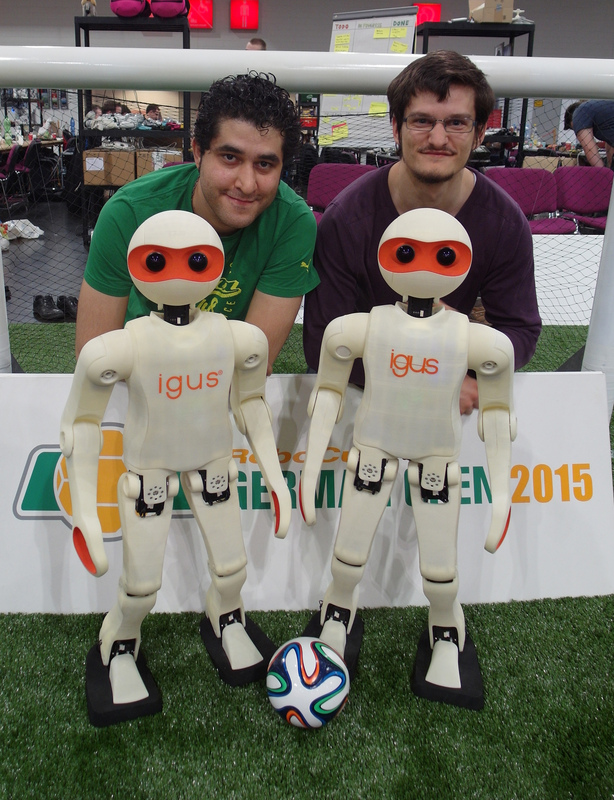 Our igus Humanoid Open Platform robots are demonstrated by Philipp and Hafez at RoboCup German Open in Magdeburg. 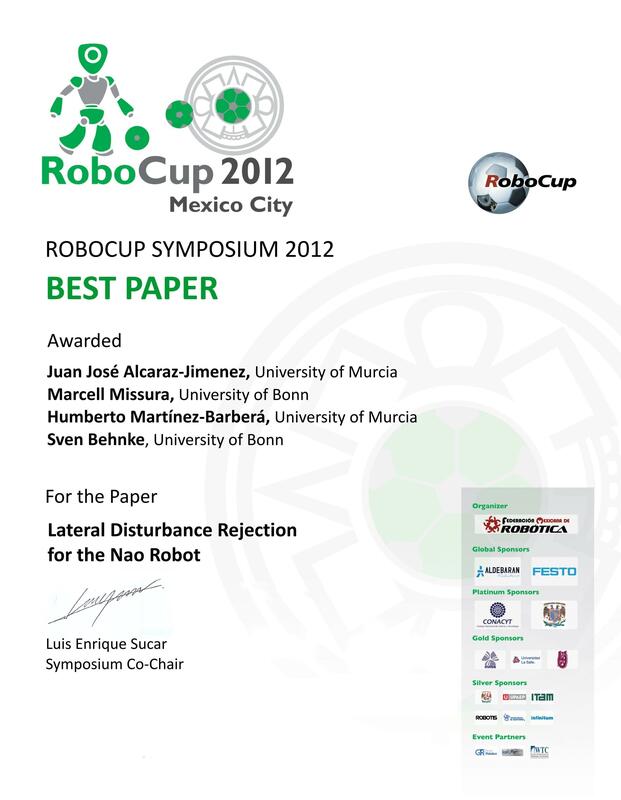 The paper by Marcell Missura and Sven Behnke: "Balanced Walking with Capture Steps" won the Best Science Paper Award at he 18th RoboCup International Symposium, Joao Pessoa, Brasil. 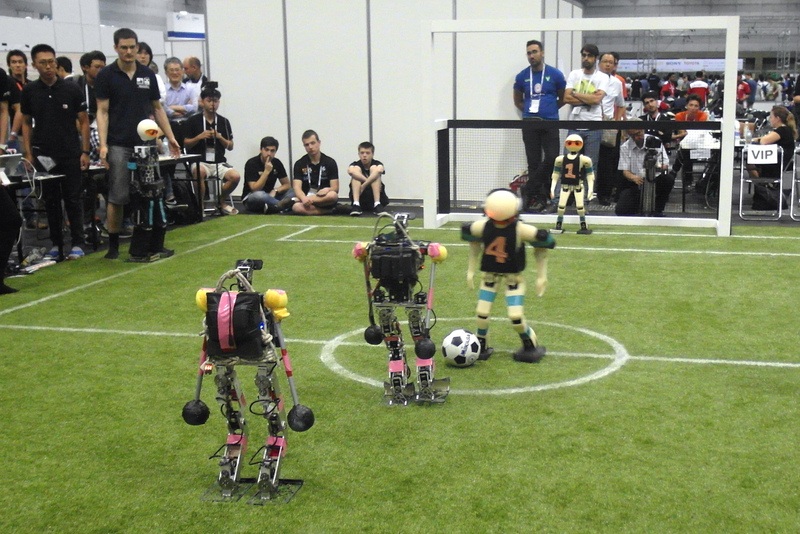 In the final, our robots Copedo and Dynaped met team Baset from Iran. 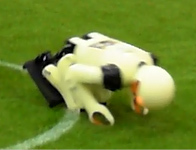 Copedo played goalie and Dynaped, which had a new capture step feature enabled, was a field player. 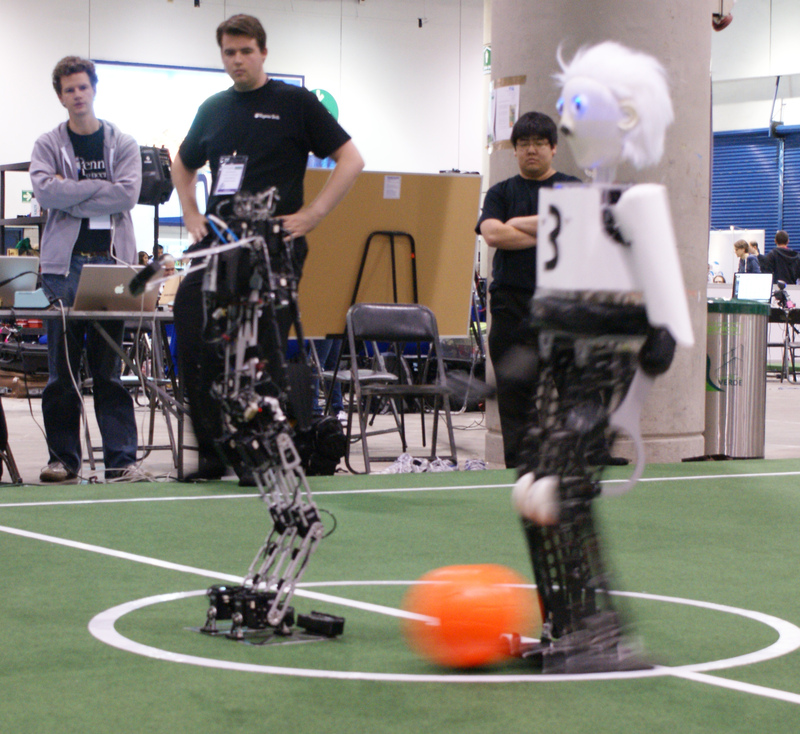 When struggling for the ball, robots of both sides often went down. Dynaped is not equipped to get up and had to be taken out, In these situations, the Baset robots, which got up quickly, scored. 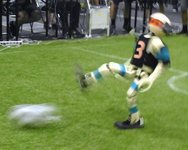 After 5:0 at half time, the game ended 8:4 for Baset. 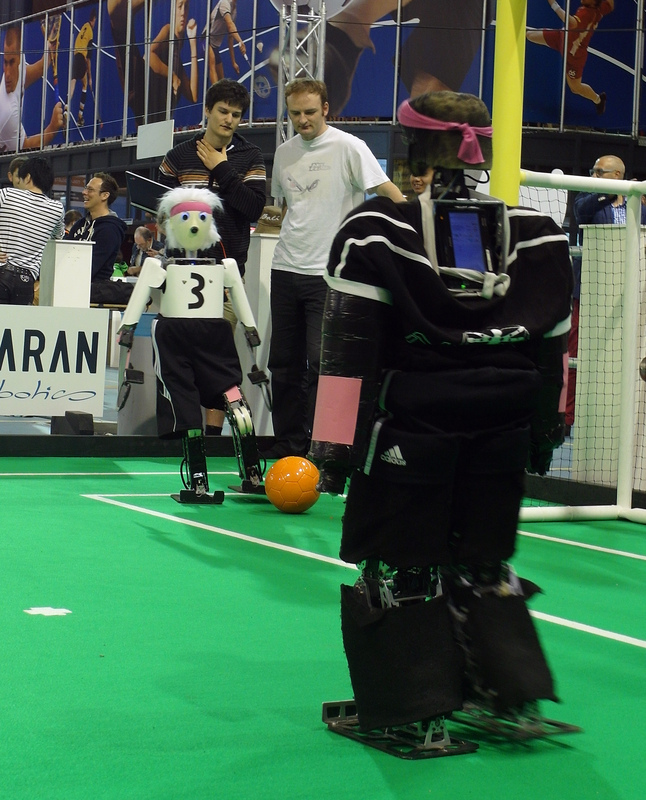 Our robots Dynaped and Copedo met team Parand (Iran) in the last round robin game. 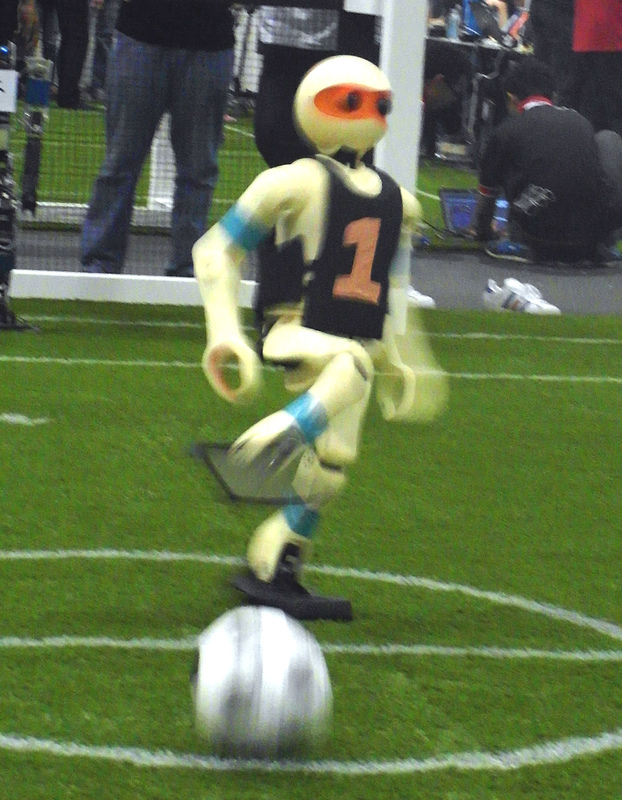 Copedeo had the field player role and scored three times. 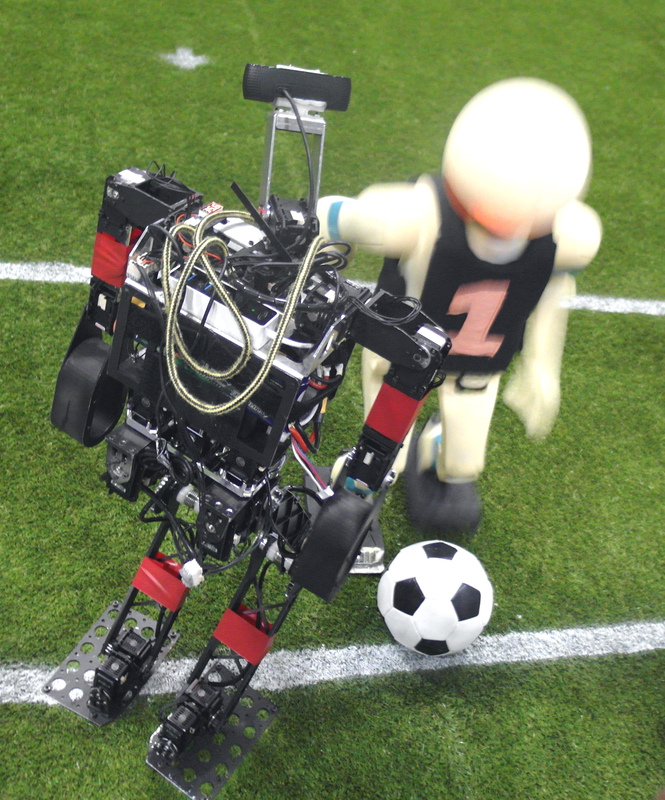 After 2:1 at half time, the game ended 3:1 for NimbRo. 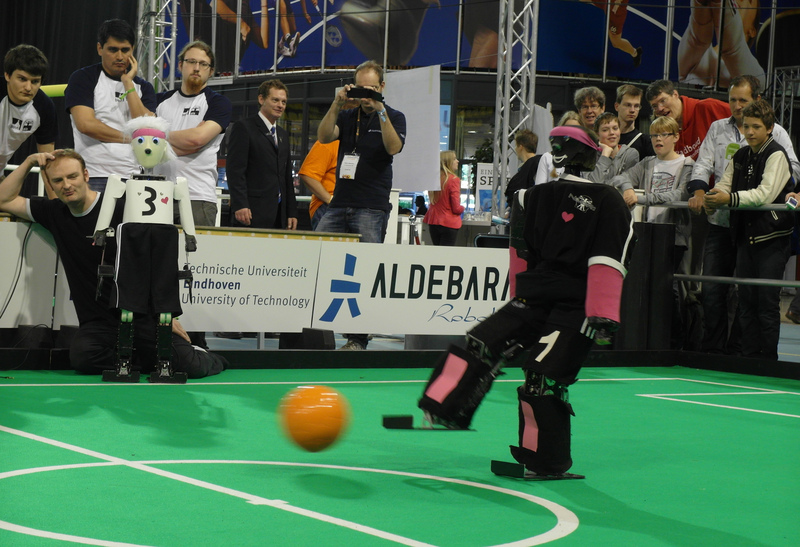 Both teams will meet again in the semi-final in the evening. In the technical challenge, Dynaped got points for dribbling an arbitrary colored ball. 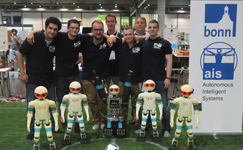 Our robots met team MU-L8 from USA. 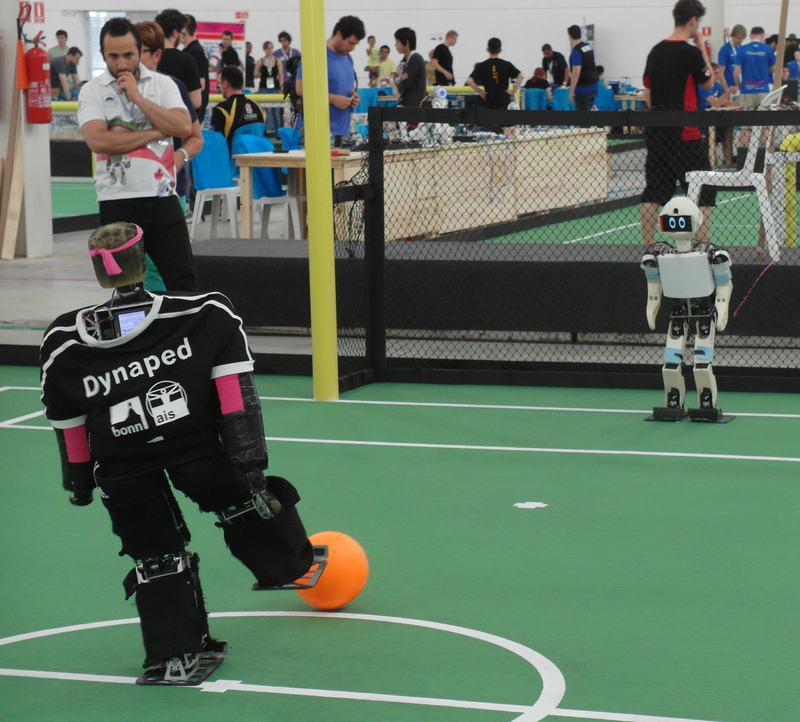 Dynaped was quick to reach the ball and scored reliably. 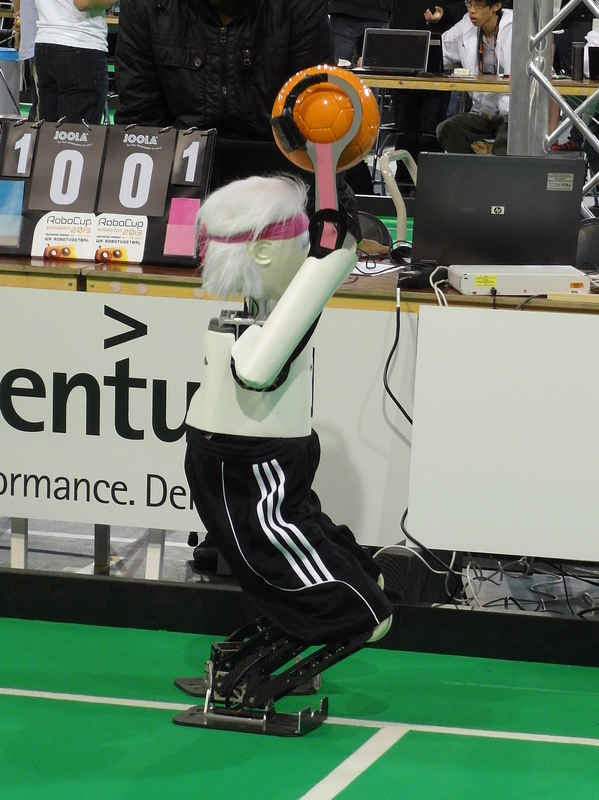 The game ended early in the second half 10.0 for our robots. 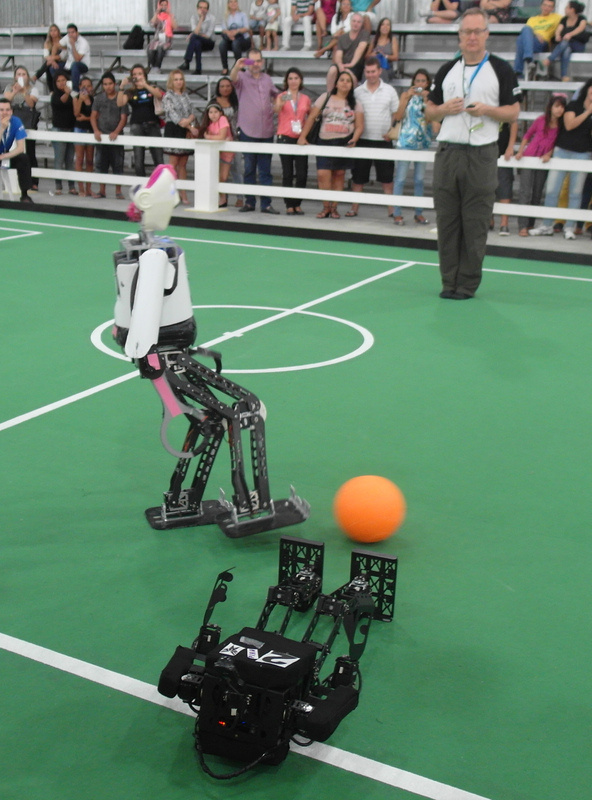 In the second game of the day, our robots met EDROM from Brasil. Dynaped scored reliably, but the second goal went into our own. 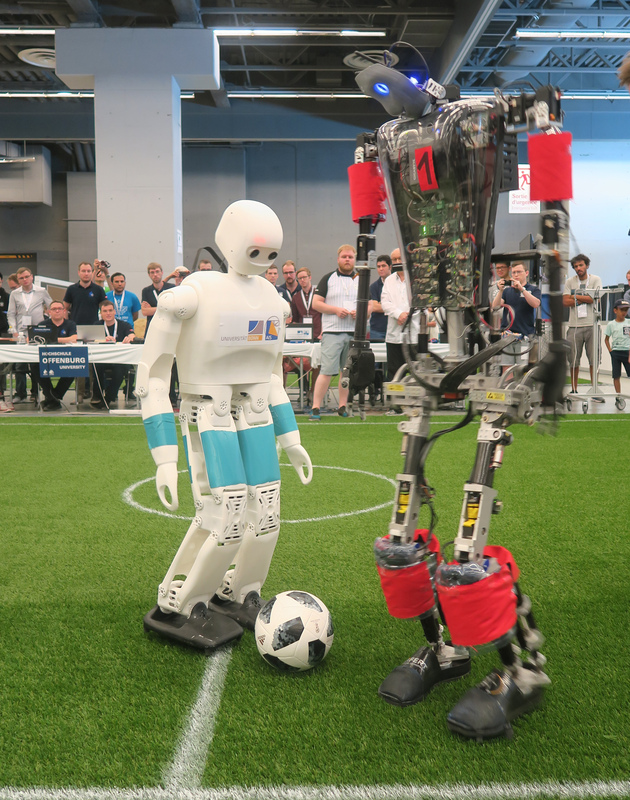 Hence, the game ended in the second half 11:1 for NimbRo. Today is the first day of the round robin. 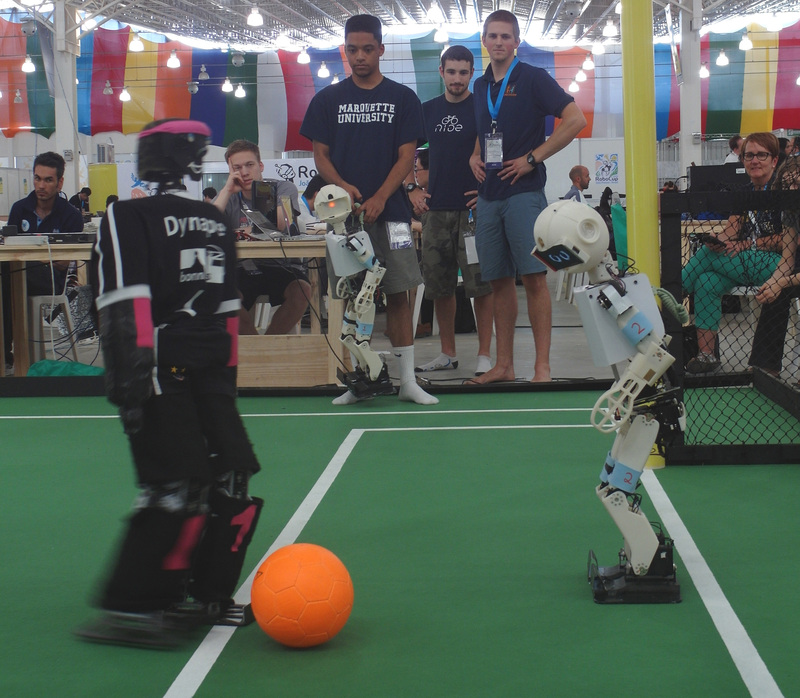 Our robots Dynaped and Copedo played their first match vs. team AUT-UofM, a joint team from Iran and Canada. 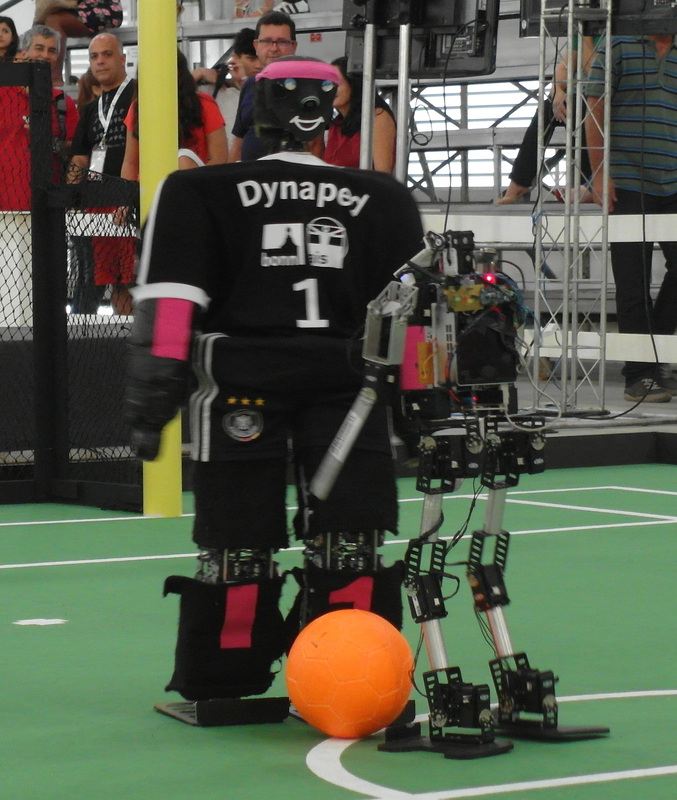 Dynaped was the field player and scored three times in the second half. 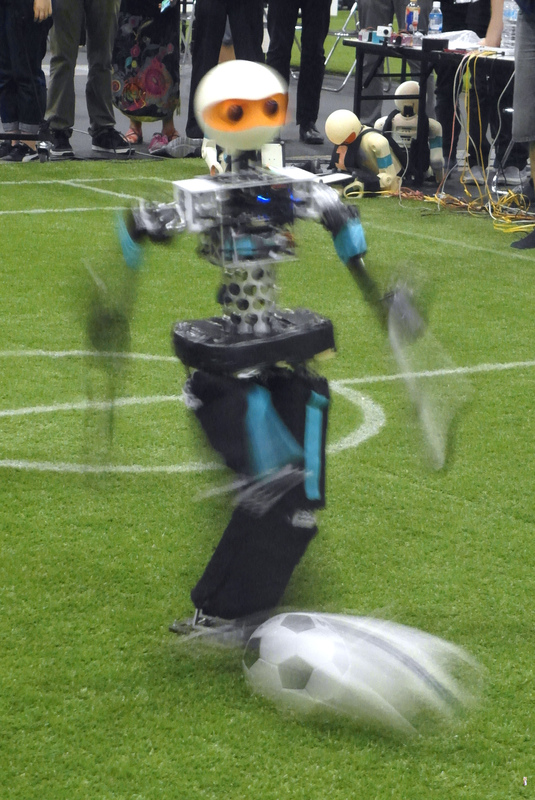 The AUT-UofM robots also had some good actions, but did not score. Our robots did not play well in the game vs the Iranian team Baset. 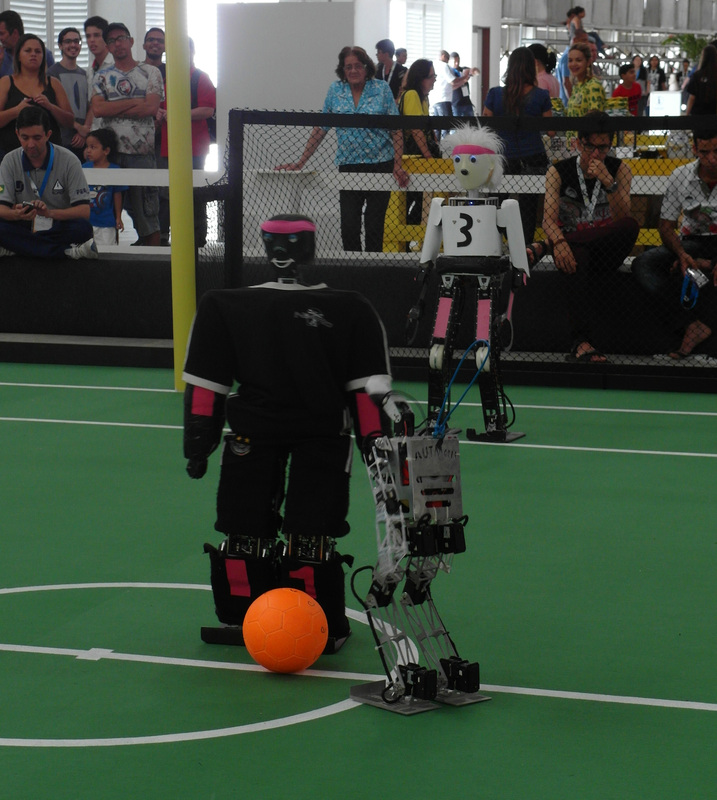 Our team NimbRo TeenSize participates in the RoboCup 2014 Humanoid League competition in Joao Pessoa, Brasil. 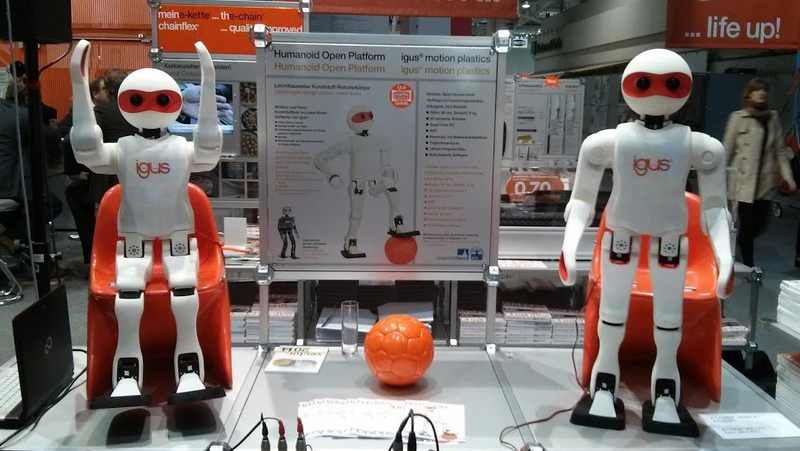 Our new 3D printed robot, which we are developing with igus GmbH, is presented at Hannover Messe. 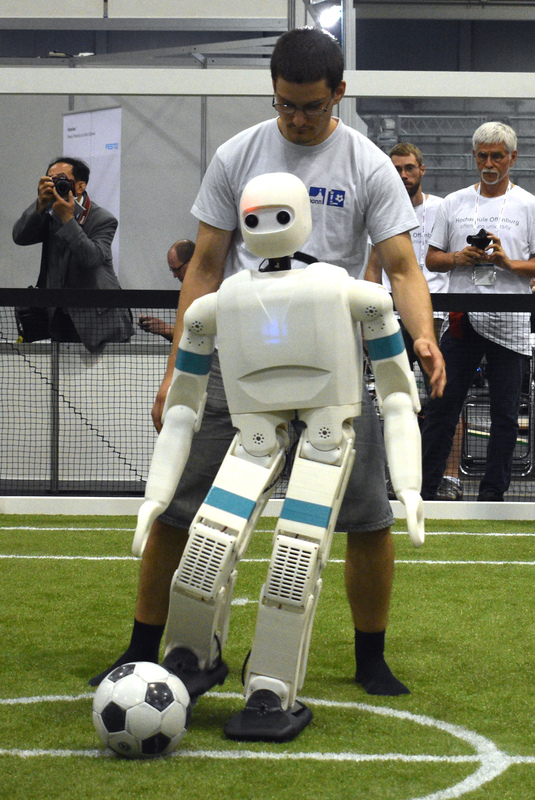 At RoboCup German Open, our robot Dynaped demonstrated improved omnidirectional capture steps. Our soccer robots won the Humanoid TeenSize competitions at RoboCup 2013! 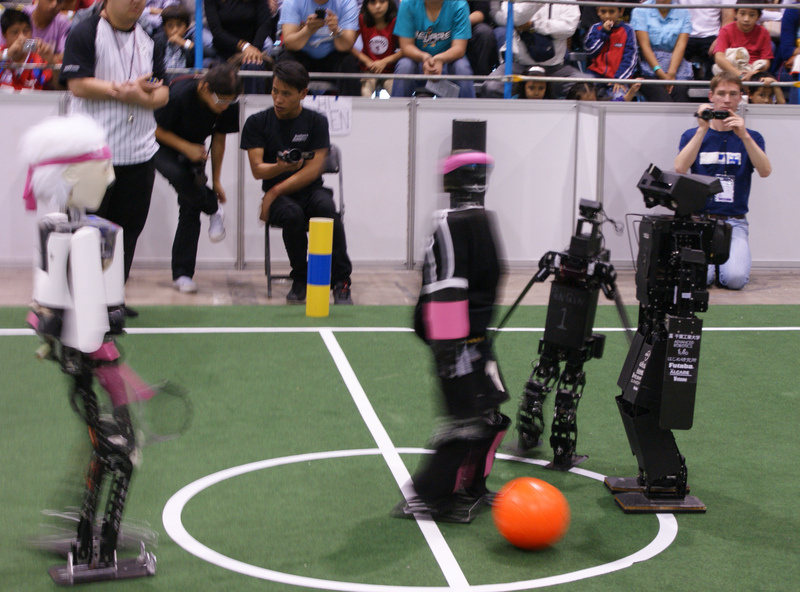 In the final game, they met team CIT-Brains from Japan. The Japanese team had a good start with a dangerous situation in front of the NimbRo goal. 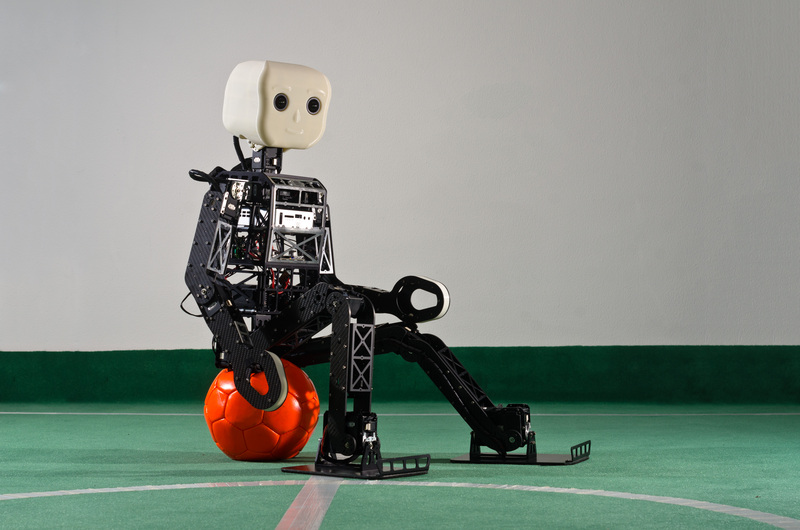 Our robot Copedo, which was used as field player, could clear the situation. 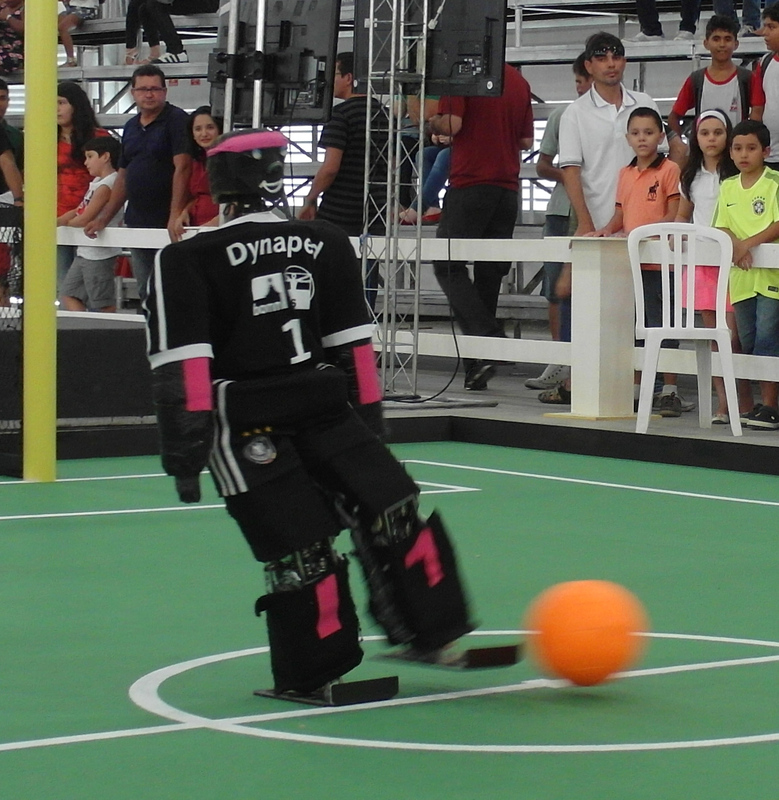 Dynaped played goalie. 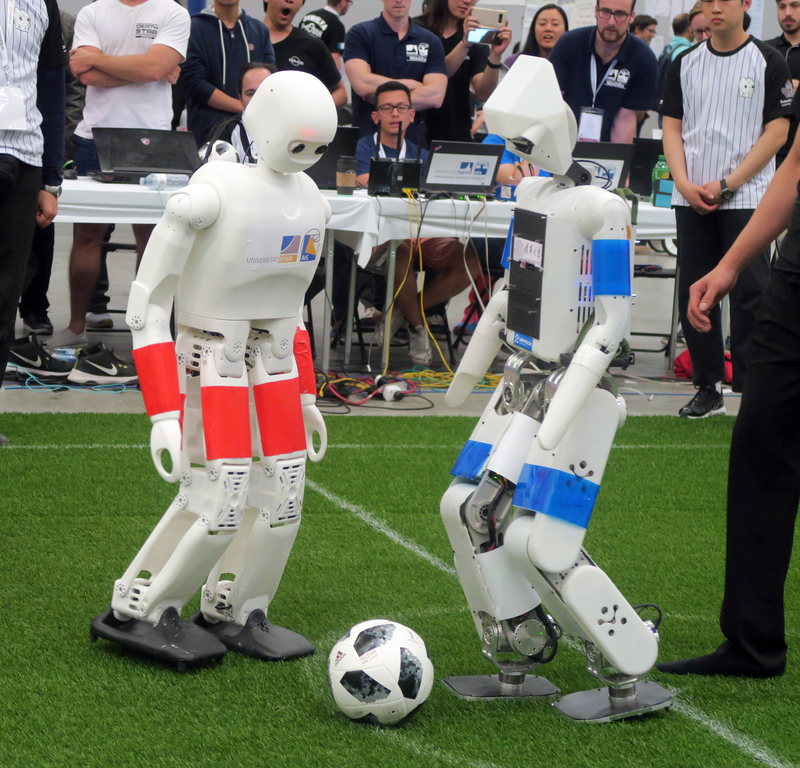 Both robots coordinated well who was going for the ball. NimbRo had a clear advantage and scored three goals in the first half. 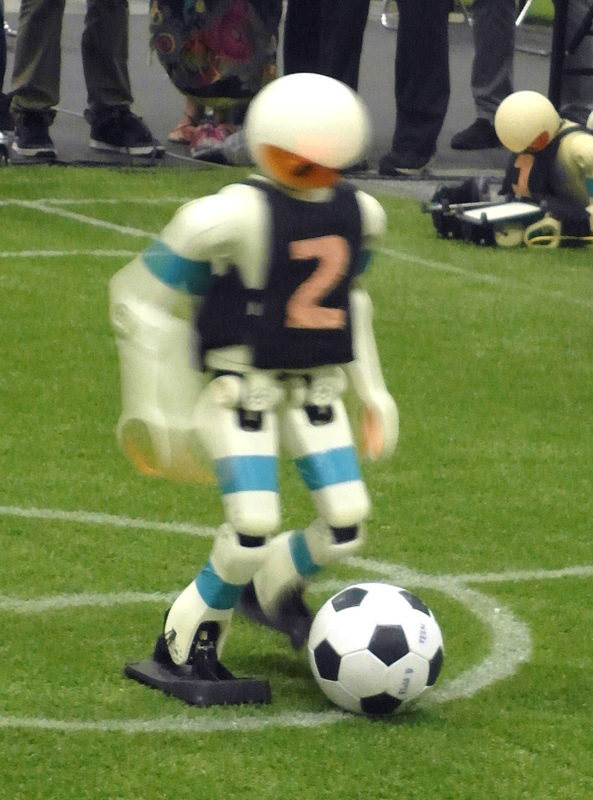 The game ended 4:0 for NimbRo. 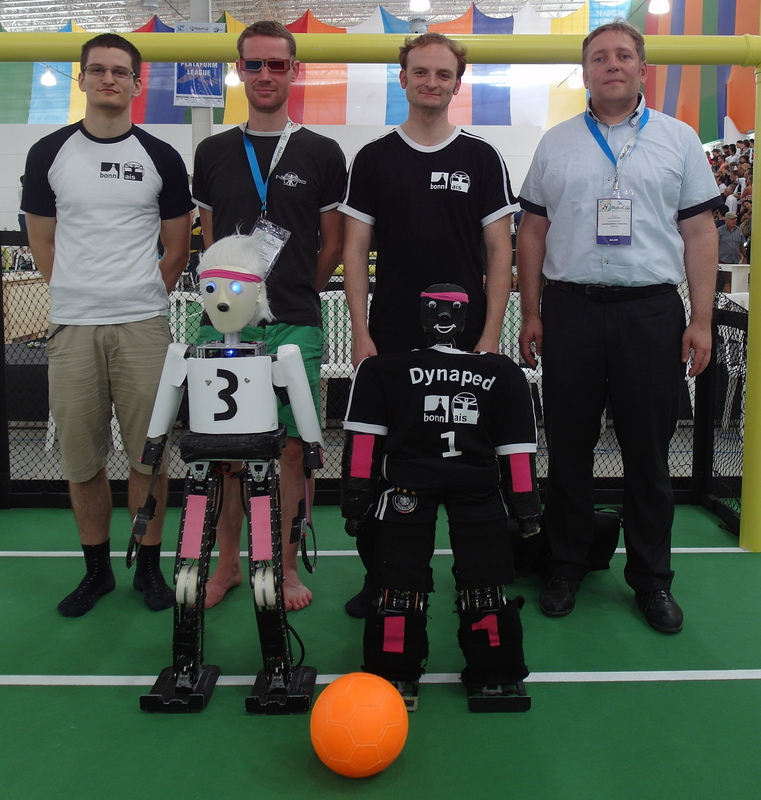 In the semi-final, our robots Dynaped and Copedo met again team FUB-KIT (FU Berlin, Germany-Kyushu, Japan). 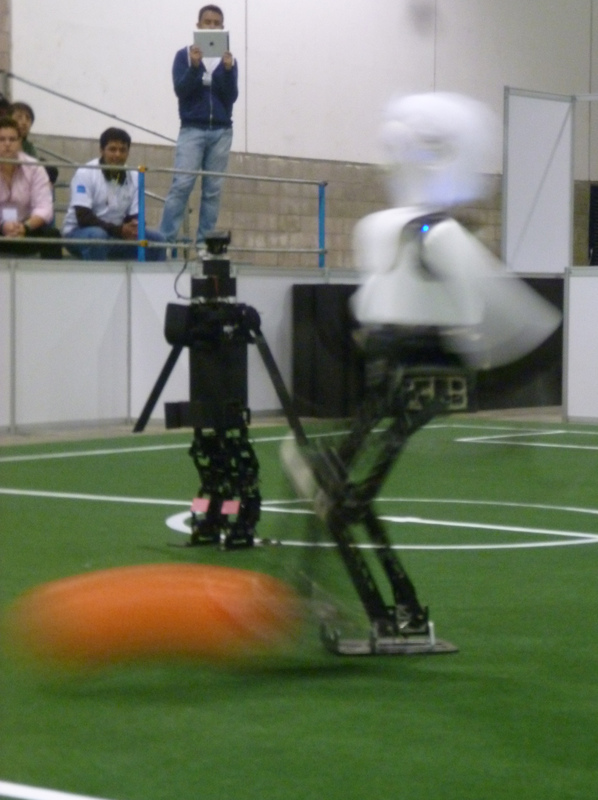 The NimbRo robots scored reliably, yielding a final result of 8:0 (after 3:0 at half time). 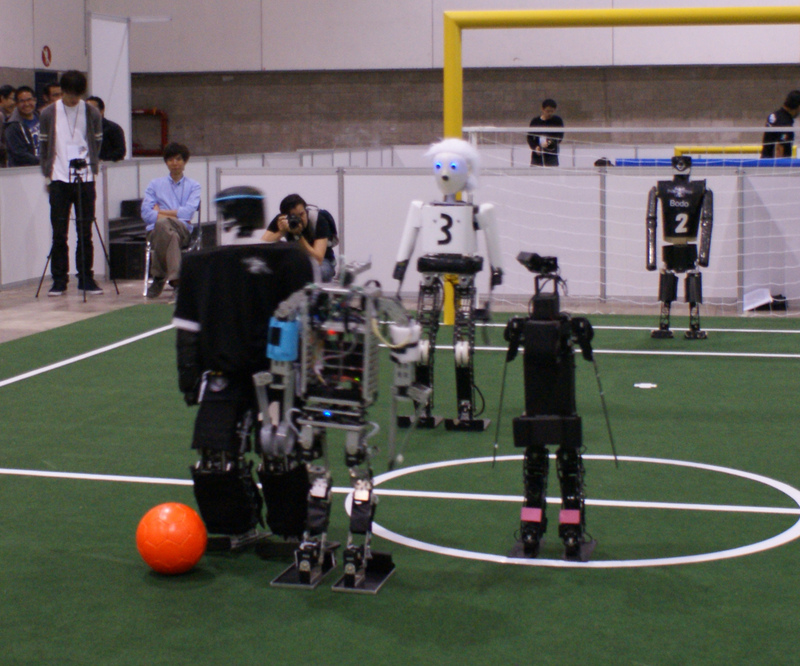 In the final, NimbRo will meet as in previous years team CIT-Brains from Japan. 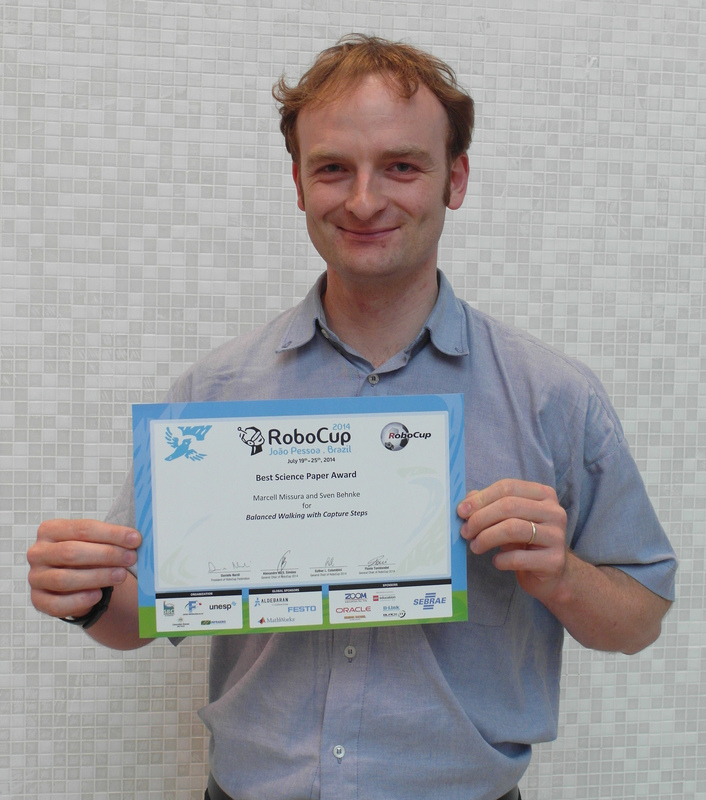 Our robots scored in the Technical Challenge. In the Throw-in Challenge, Copedo found the ball at the side line, picked it up and made a throw. 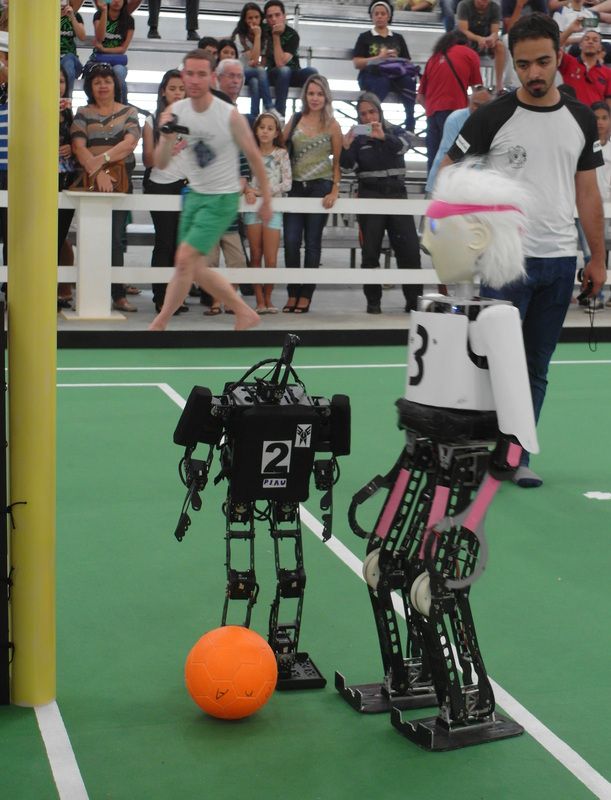 Copedo and Dynaped also scored in the Double Pass Challenge. 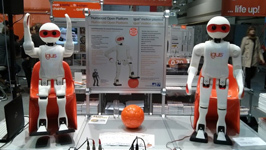 In total, our robots reached 14 of 30 possible points. 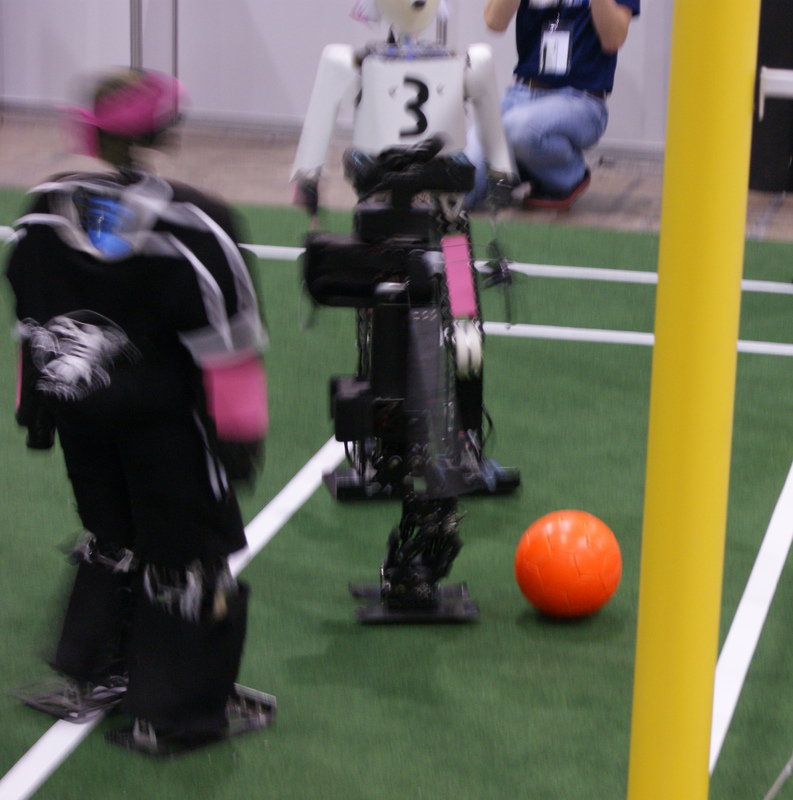 Our robots played two more round robin games. First, they met team FUB-KIT, a joint team from Freie Universität Berlin and Kyushu Institute of Technology. 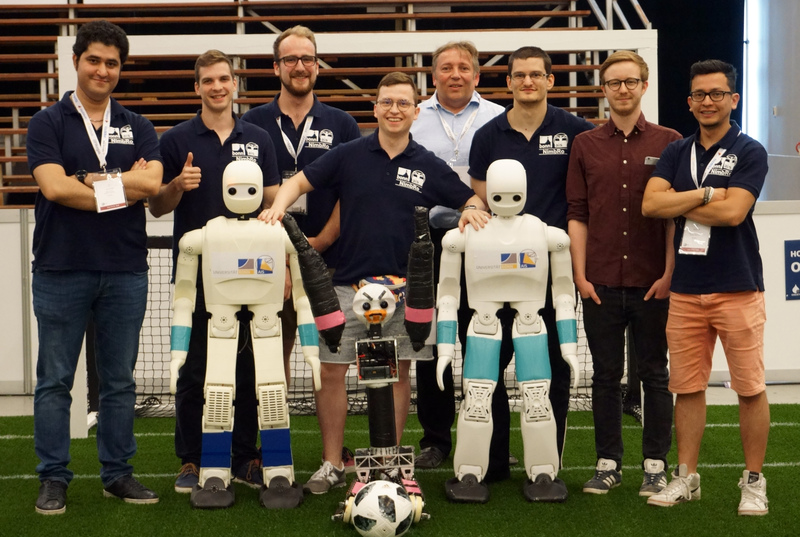 Their lightweight robots were equipped with an innovative cable-driven mechanism, which allows to place all actuators in the hip. 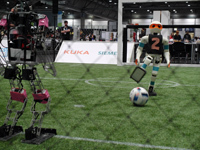 Copedo scored reliably, having only some problems to see the semi-transparent FUB-KIT robots. 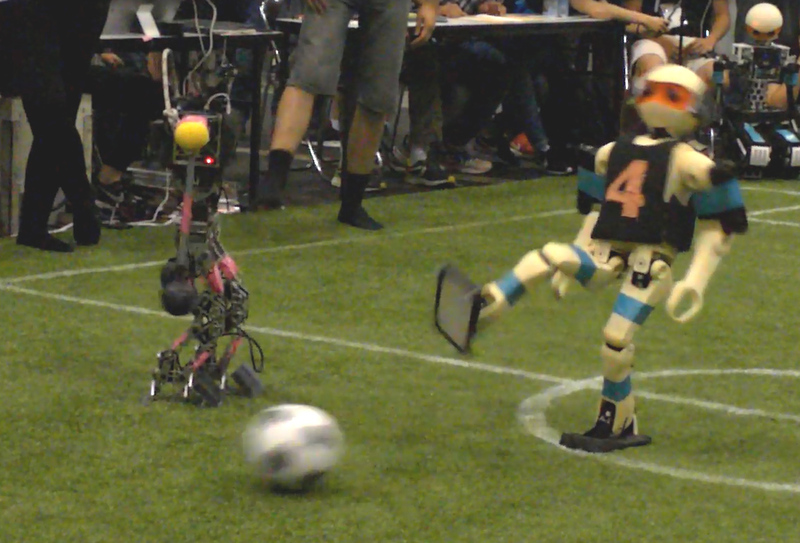 After 4:0 at half time, the game ended 6:0 for NimbRo. 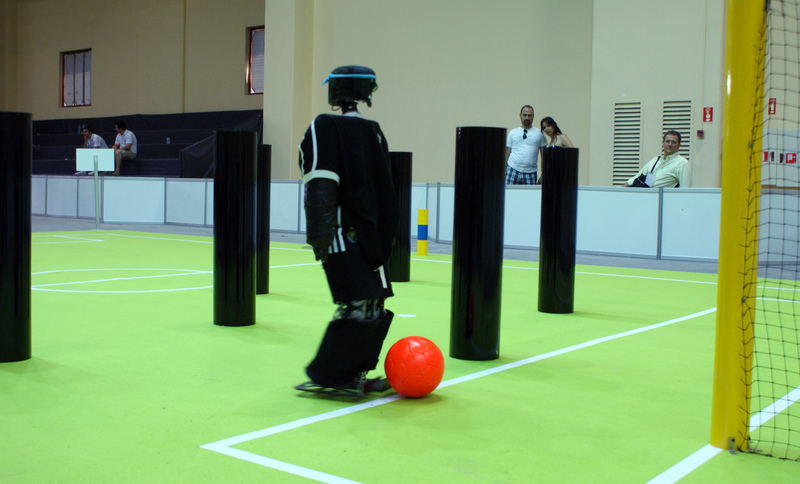 The second game was vs. team AcYut from India who reliably went to the ball. 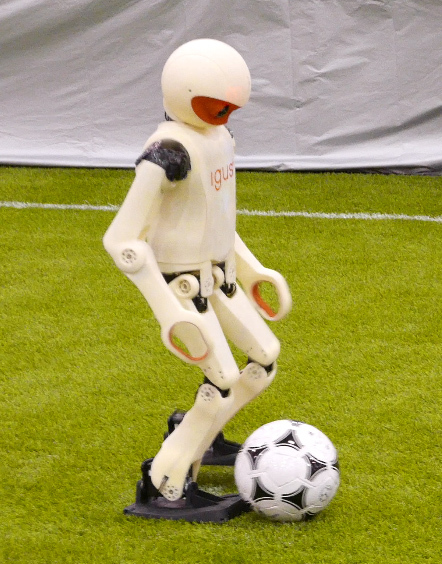 The game ended 5:0 for NimbRo (after 2:0 at half time). 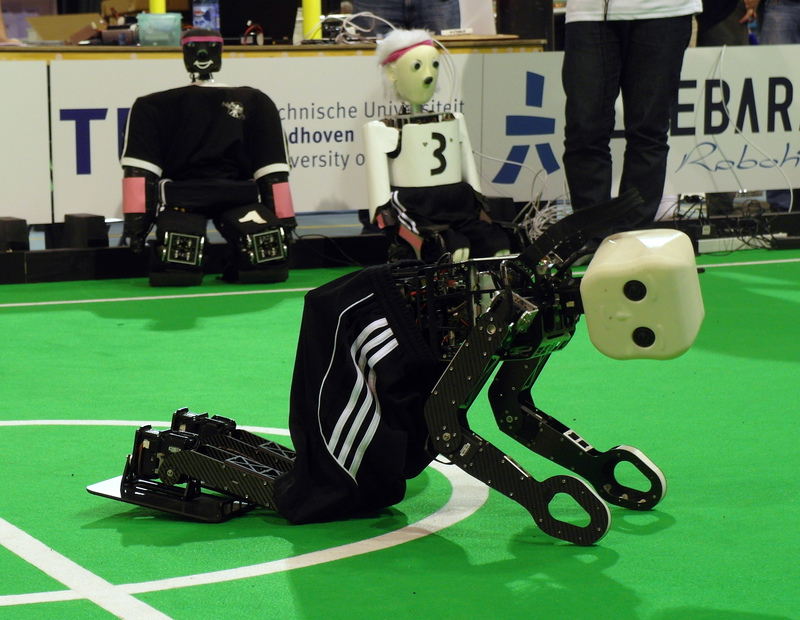 This makes NimbRo first of the round robin with 12:0 points and 20:1 goals. 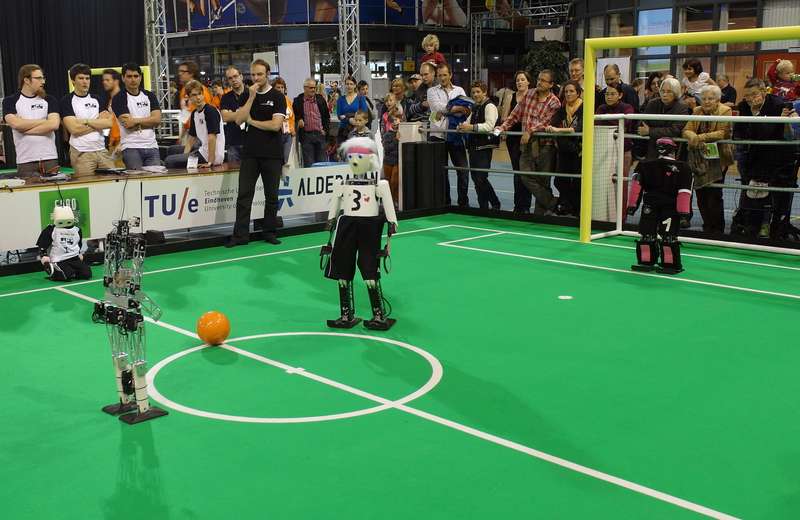 Our team NimbRo TeenSize participates in the Humanoid League competitions of RoboCup 2013 in Eindhoven, Netherlands. 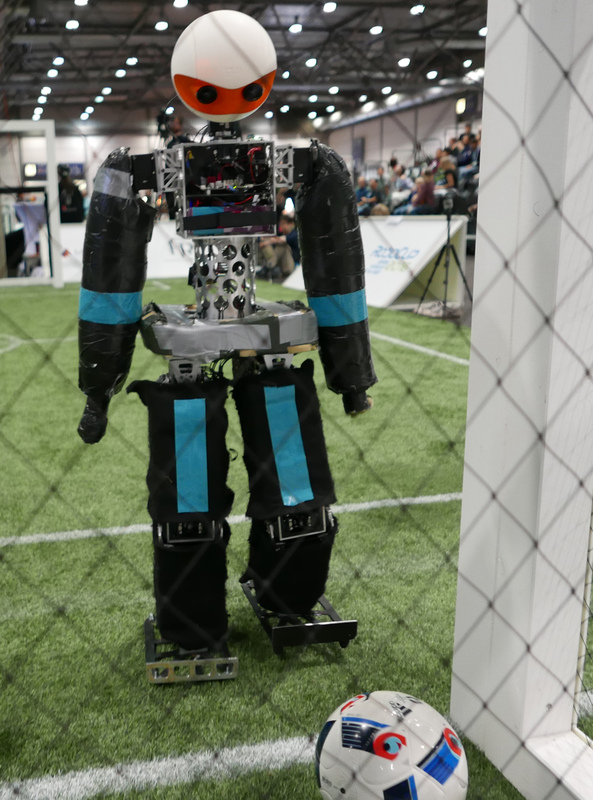 This year, both goals have the same color and visual landmarks on the sideline of the field have been removed. 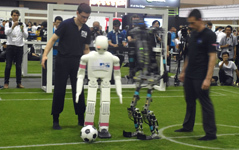 This makes localization on the field harder. 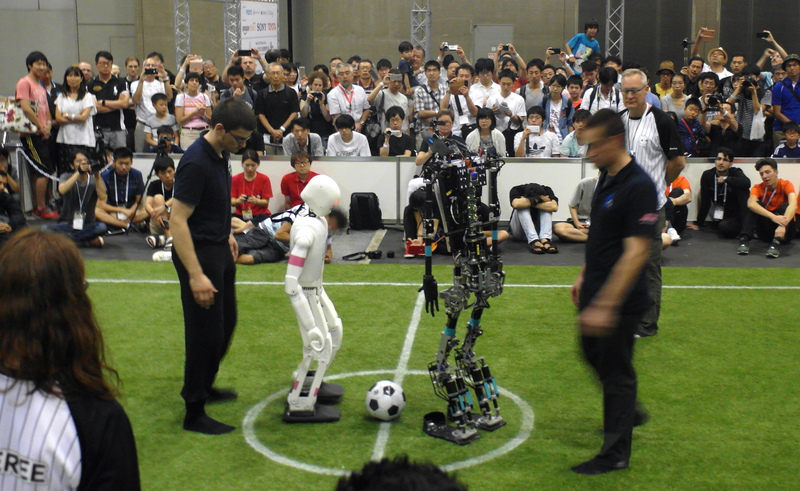 In the first round robin game, our robots Dynaped and Cosero met CIT-Brains from Japan. 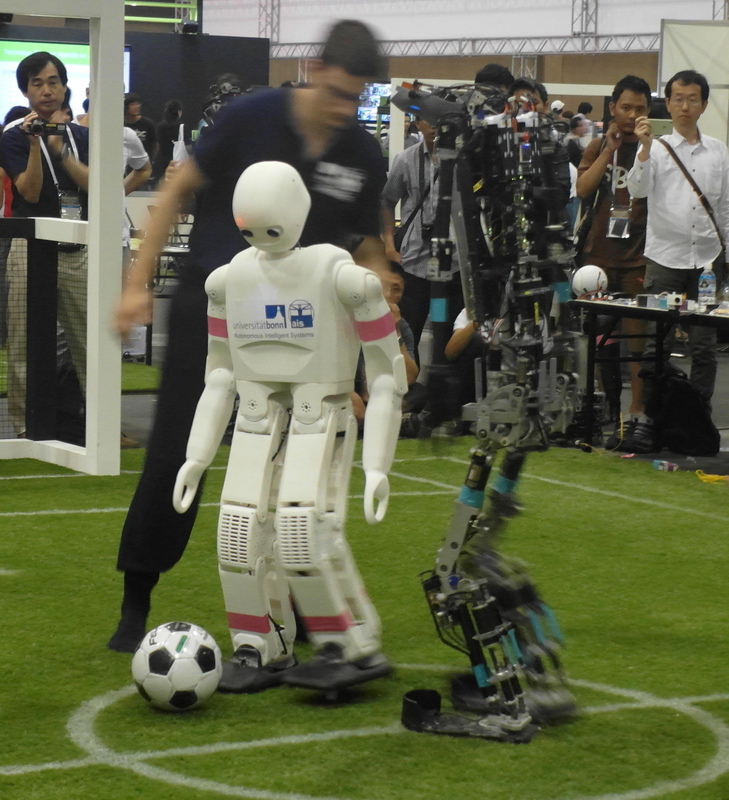 The Japanese team seems to be the strongest competitor in the TeenSize class. 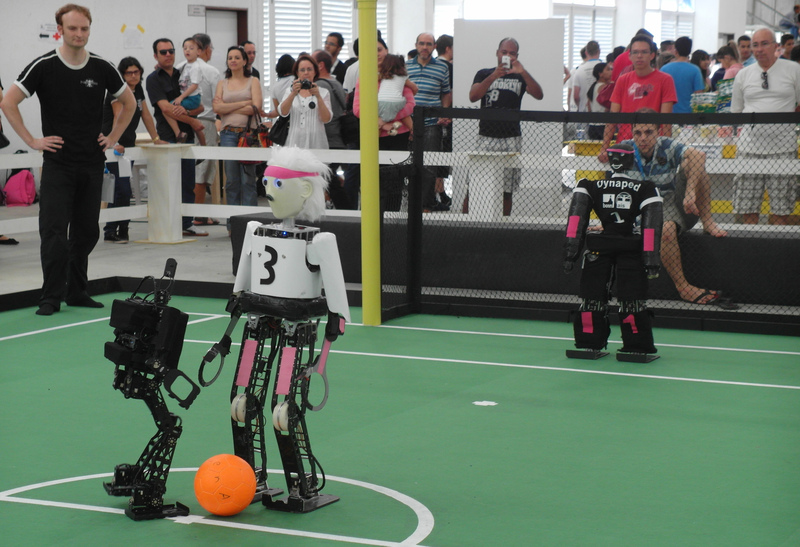 Both teams played well, went quickly to the ball and could kick hard. 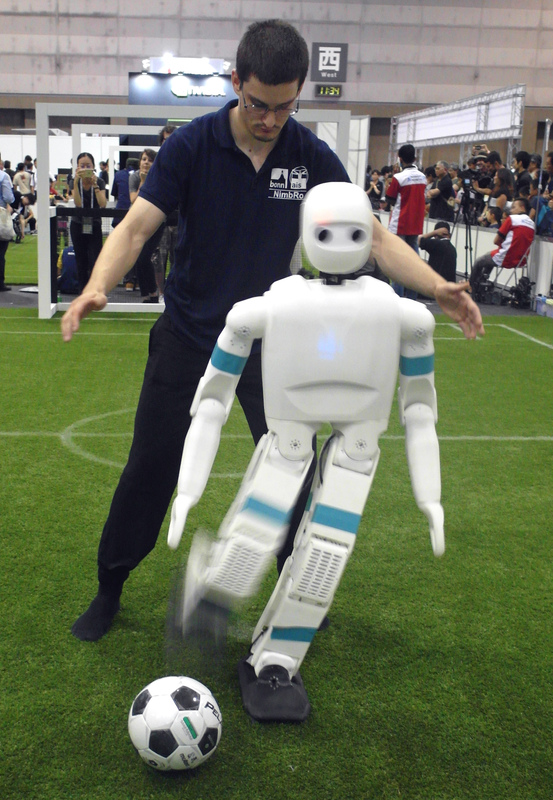 The NimbRo robots were more stable and had advantages in one vs. one fights. 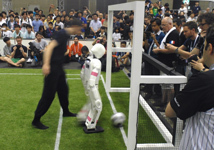 Consequently, they won the game 4:1 after 2:0 score at half time. 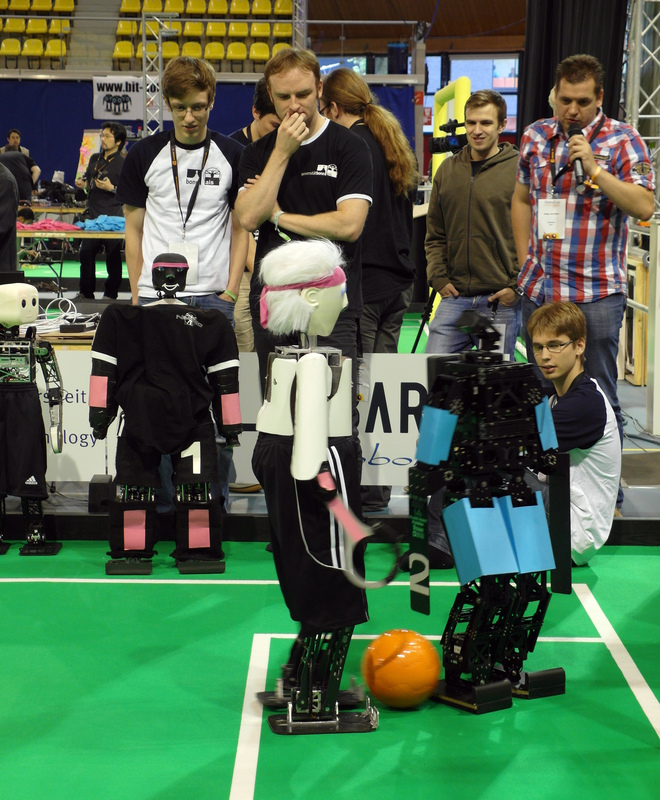 In the second game, our robots met team SIOR from Korea. 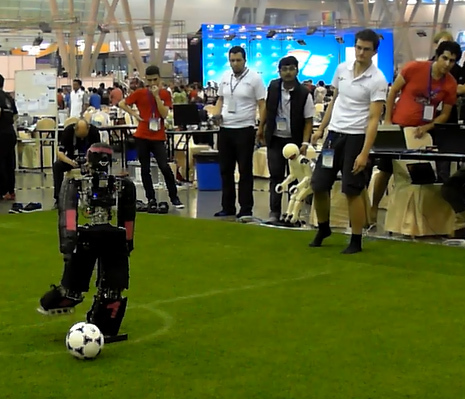 In this game, our new NimbRo-OP robot entered the tournament and scored its first official goal. 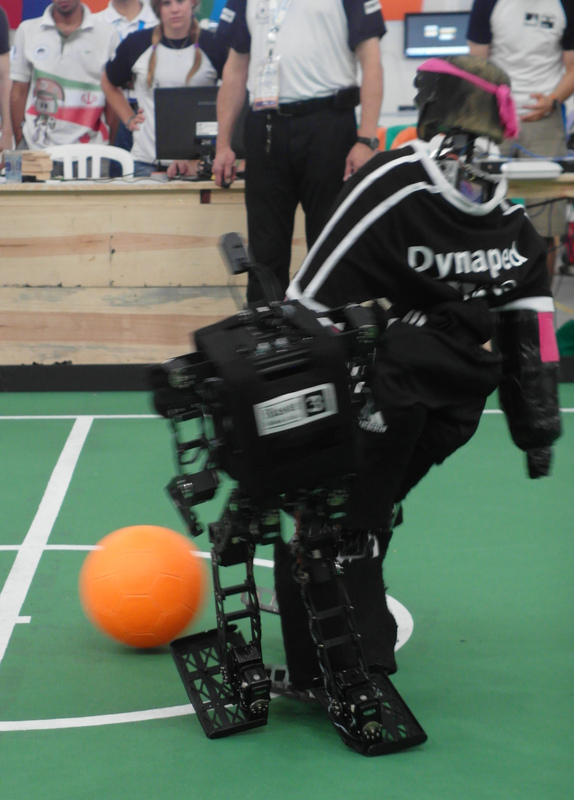 With the help of Dynaped, the game ended 7:0 for NimbRo (after 4:0 at half time). 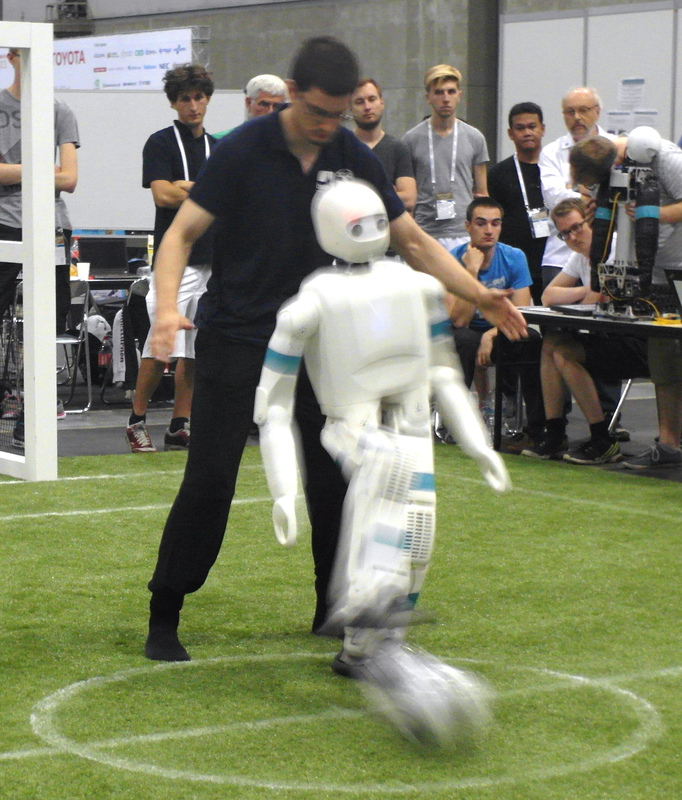 We exhibit our new NimbRo-OP Humanoid TeenSize Open Platform robot at the IEEE-RAS International Conference on Intelligent Robots and Systems (IROS) in Vilamoura, Portugal. 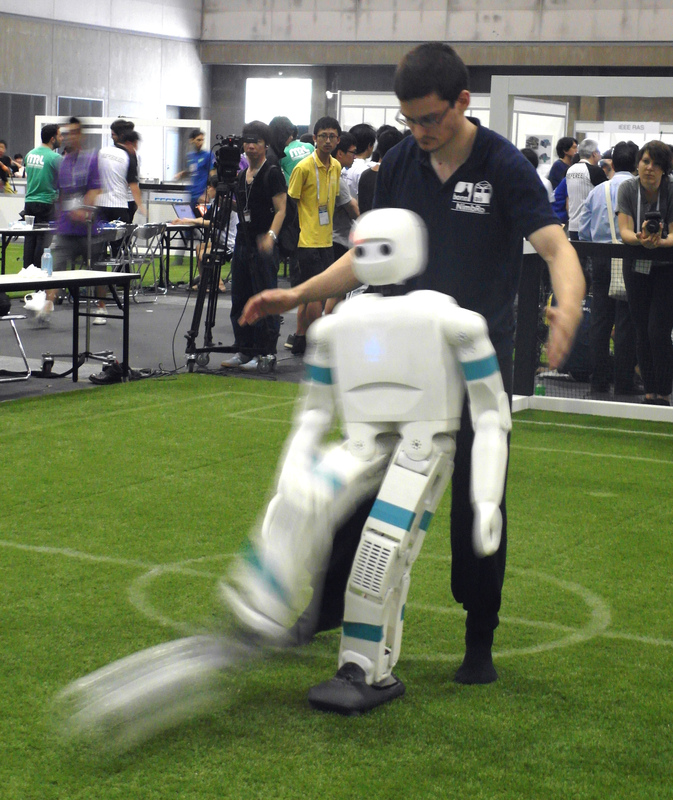 The specifications and sources of the robot are available here. Our team NimbRo won the TeenSize soccer competition, technical challenge, and received the Louis Vuitton Best Humanoid Award. 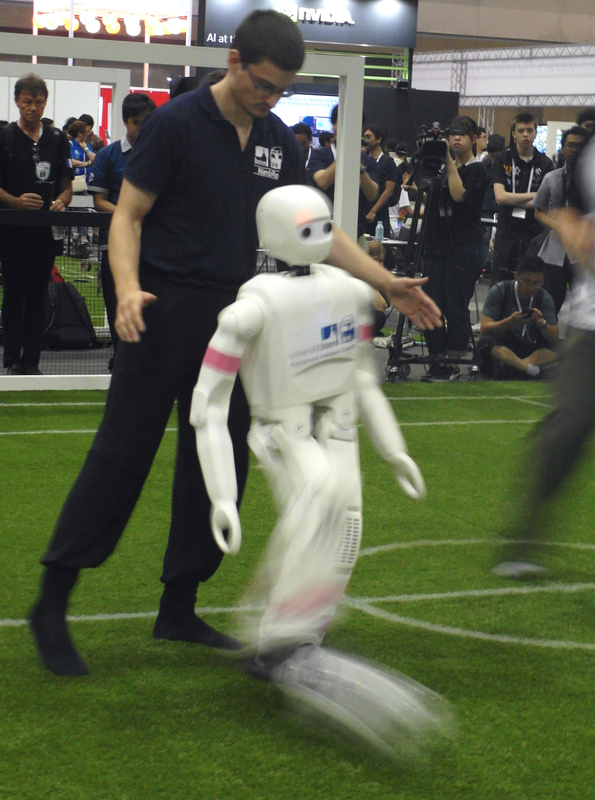 In the final, our robots met the team CIT Brains from Japan. 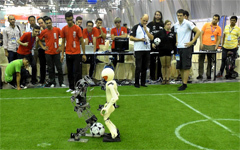 Both teams already played the final 2010 in Singapore. 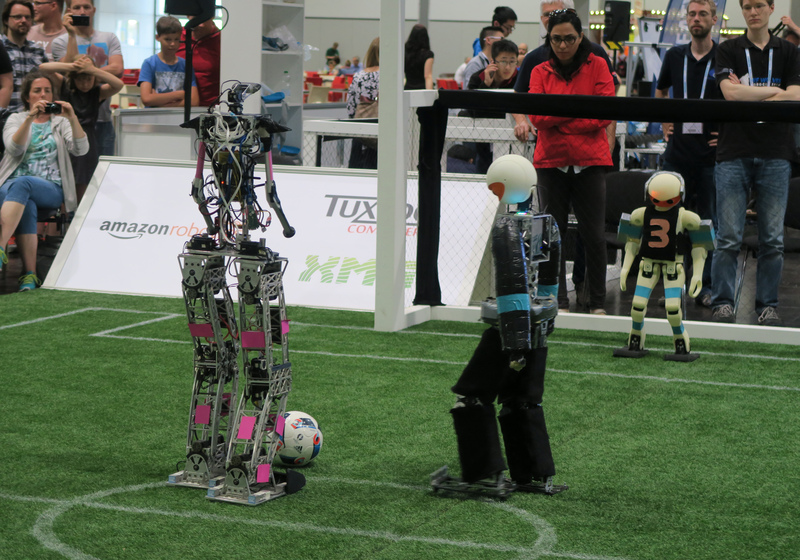 It was a very exciting game where both teams played with two capable field players and no goalie. 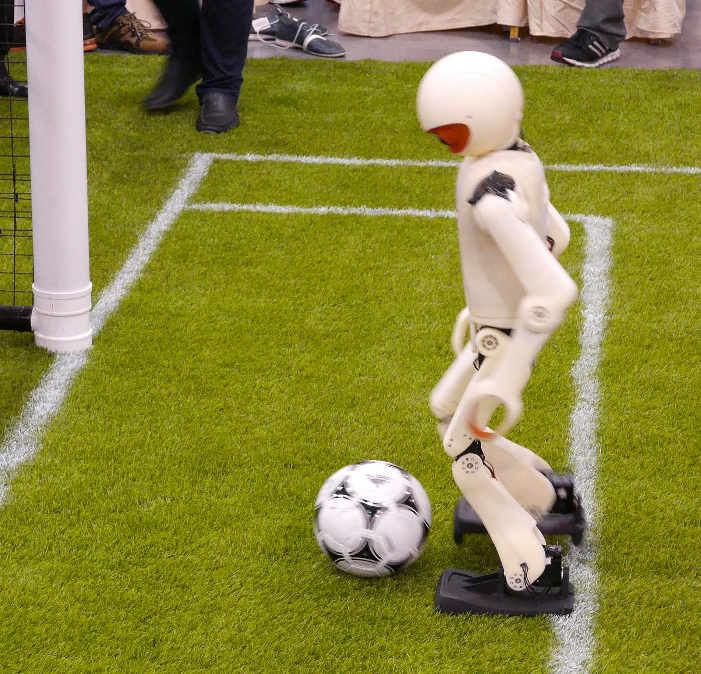 In the first half, the NimbRo robots were not going for the ball enough. 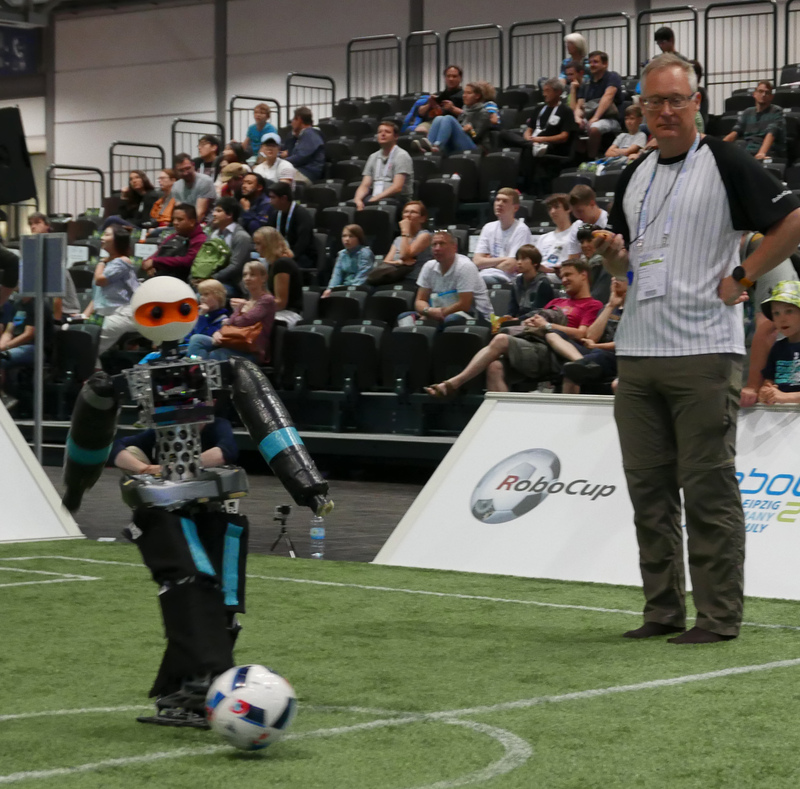 The game was open, which is reflected by the score of 2:2 at half time. 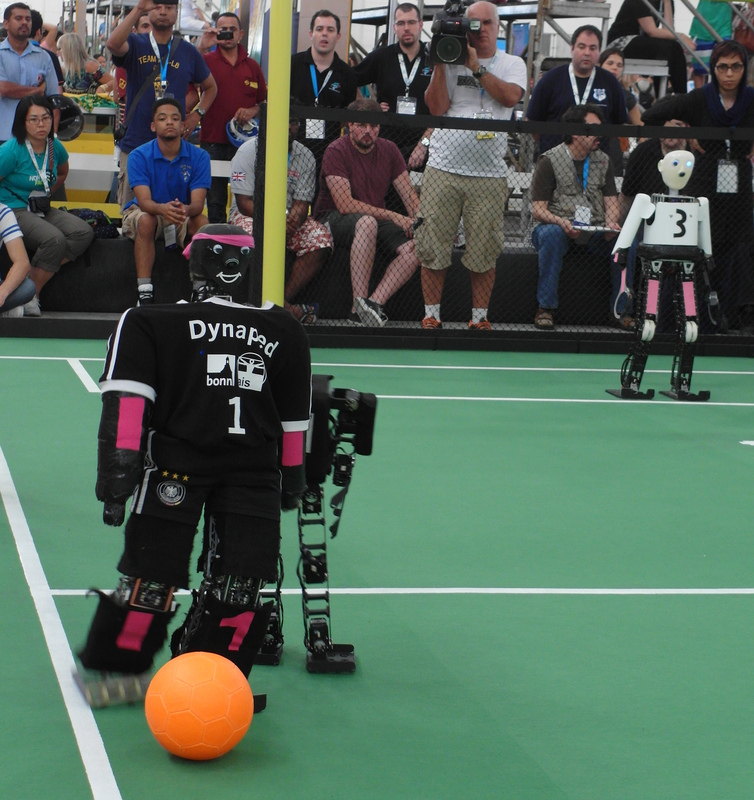 After a programming adjustment during the break, the NimbRo robots Copedo and Dynaped had an advantage in the second half. 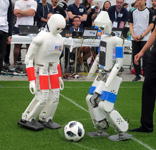 They scored four more goals while the Japanese robots scored only once. 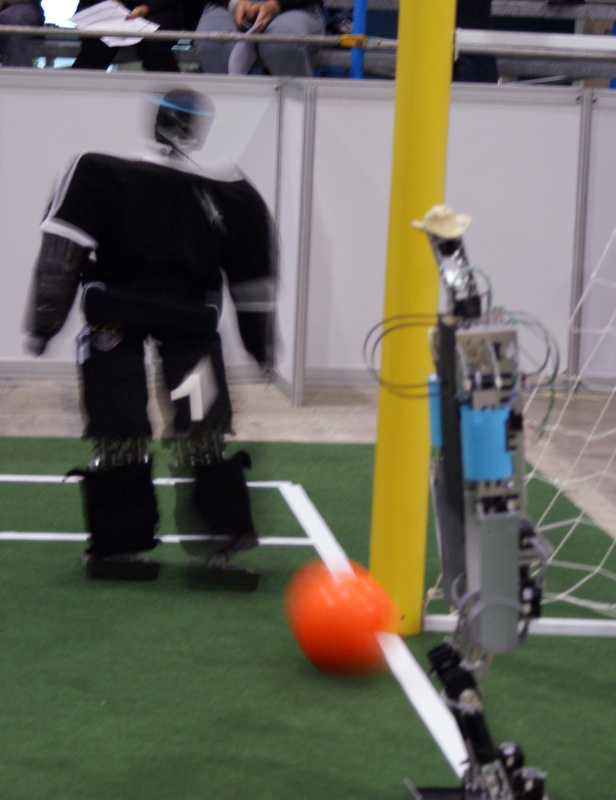 The game ended 6:3 for NimbRo. 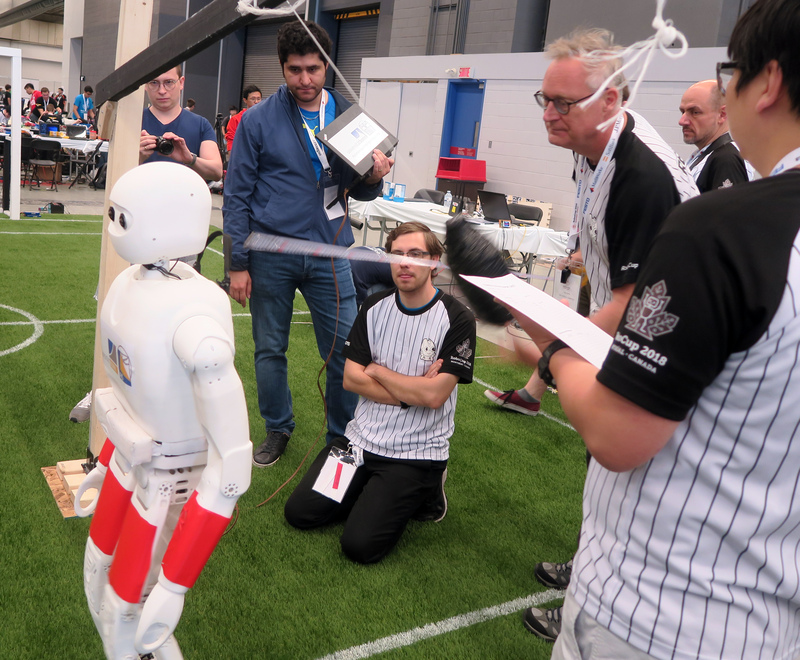 After the competition, our robots were elected for the Louis Vuitton Best Humanoid Award by the 30 team leaders of the entire Humanoid League. 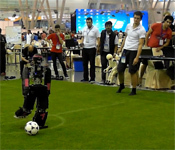 Our soccer robots did the Technical Challenges very well. 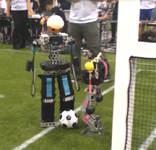 Dynaped learned a new ball and dribbled it through six obstacles and into the goal. Copedo picked up a ball outside the field and threw it in, across the entire field. 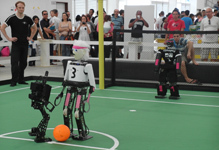 Both robots passed the ball four times back and forth between obstacles and scored at the end of the Double-pass Challenge. Together, this gave a perfect score of 30 points for the Technical Challenges. 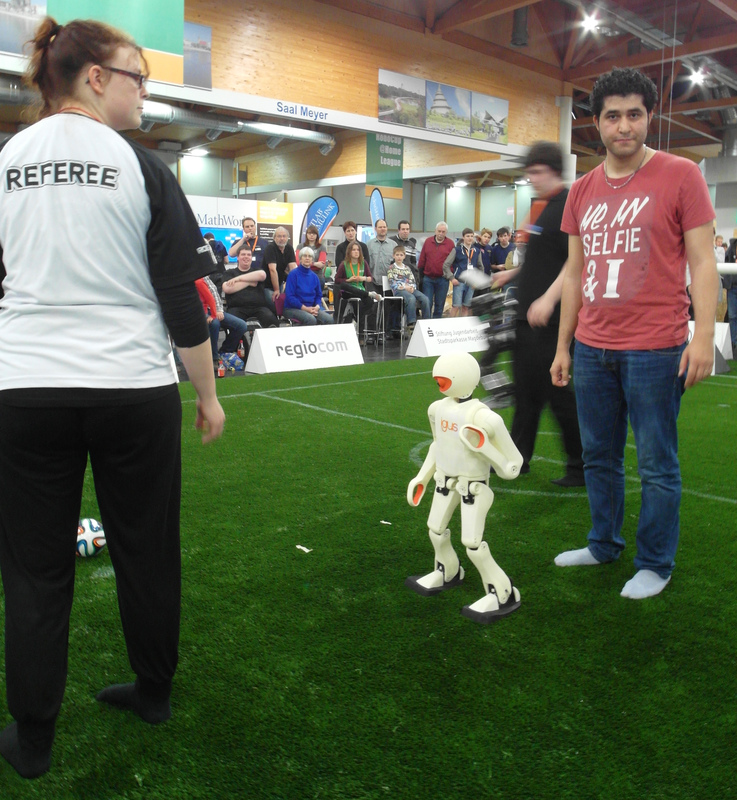 In the semi-final, our robots met again team SHAYAN. 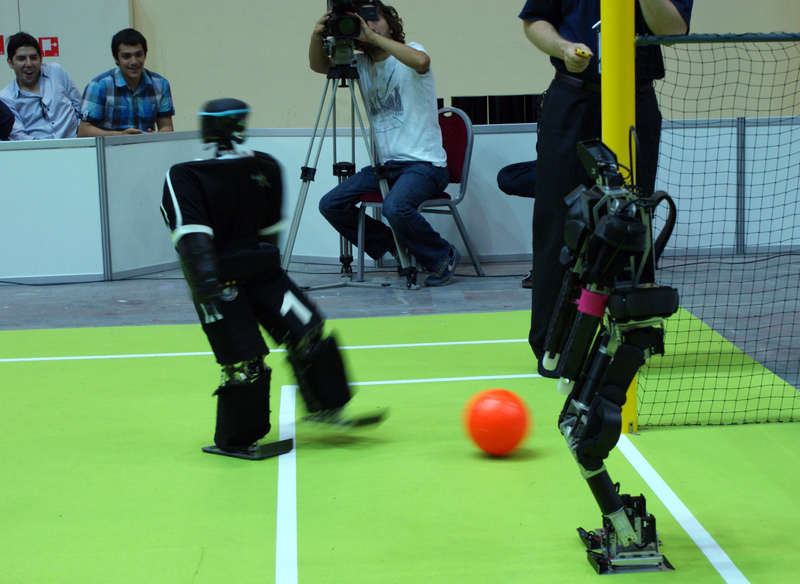 The Iranian team improved there robot a lot, such that frequently two opponents were at the ball. 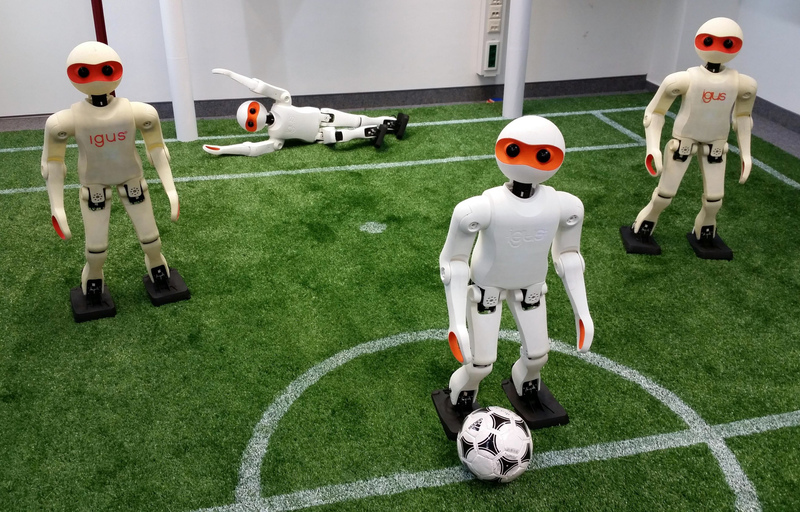 After clearing these situations, our robots Dynaped (first half) and Copedo (second) half scored reliably. 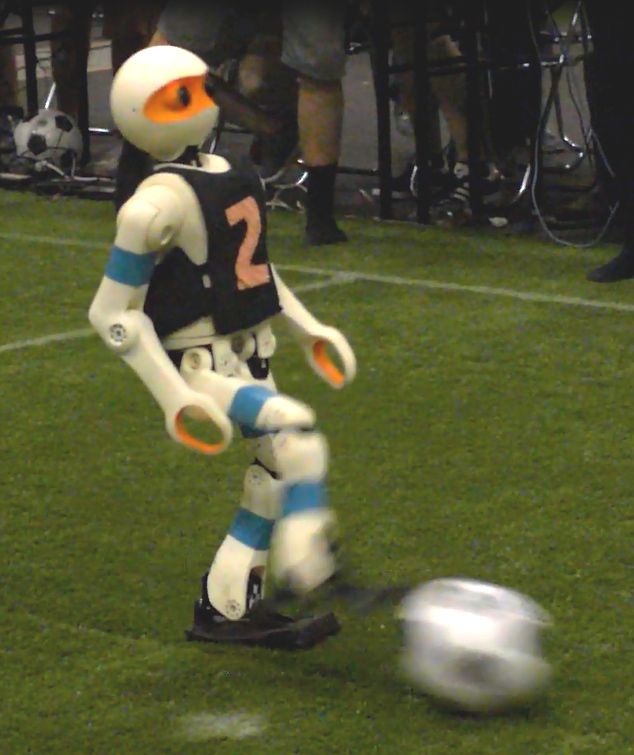 The game ended 6:0 for NimbRo after 3:0 at half time. 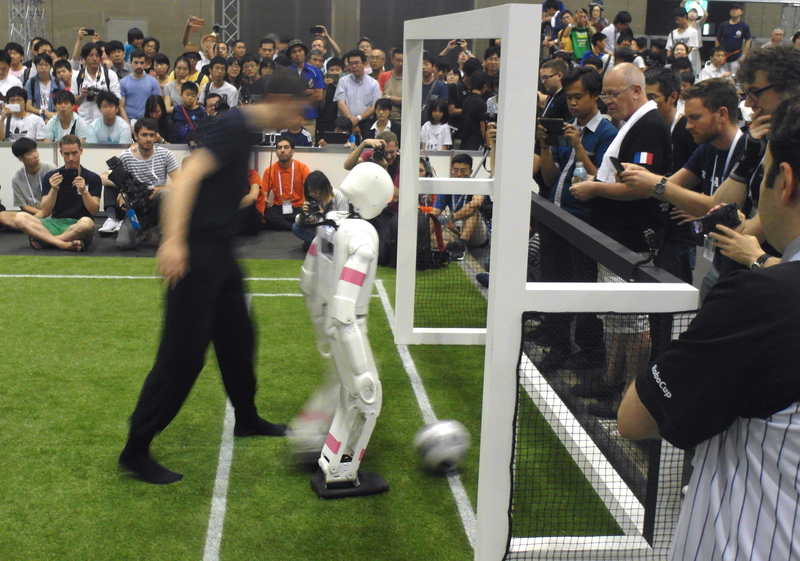 In the evening, a 3 vs. 3 demonstration game was played. 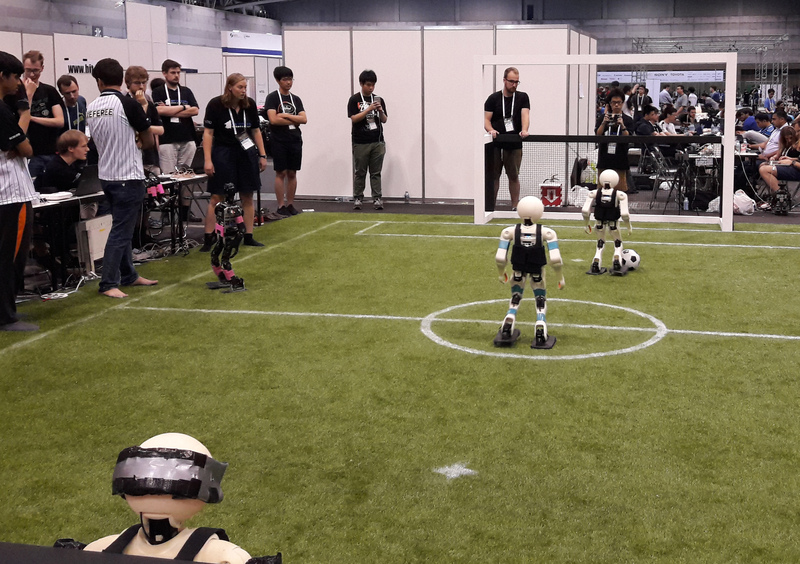 Our three robots played vs. robots of the three other teams. 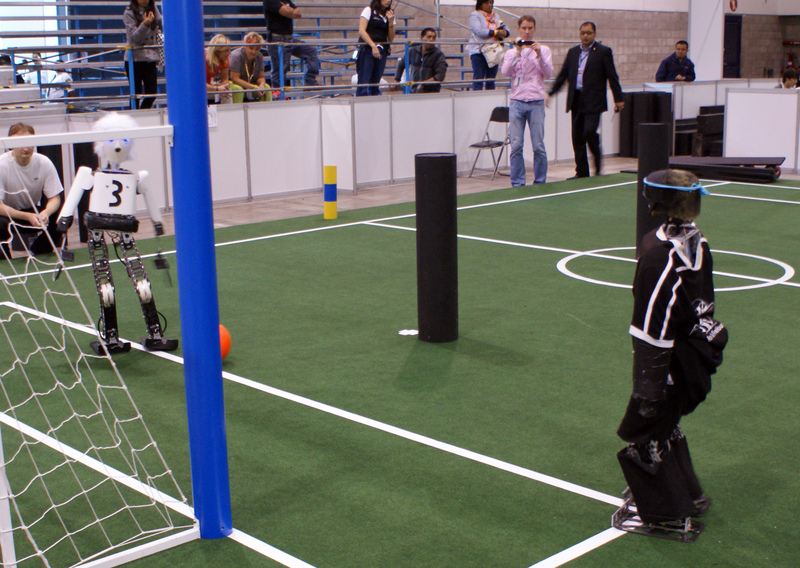 In the last round robin game, our robots met team DARwIn-XOS from USA. 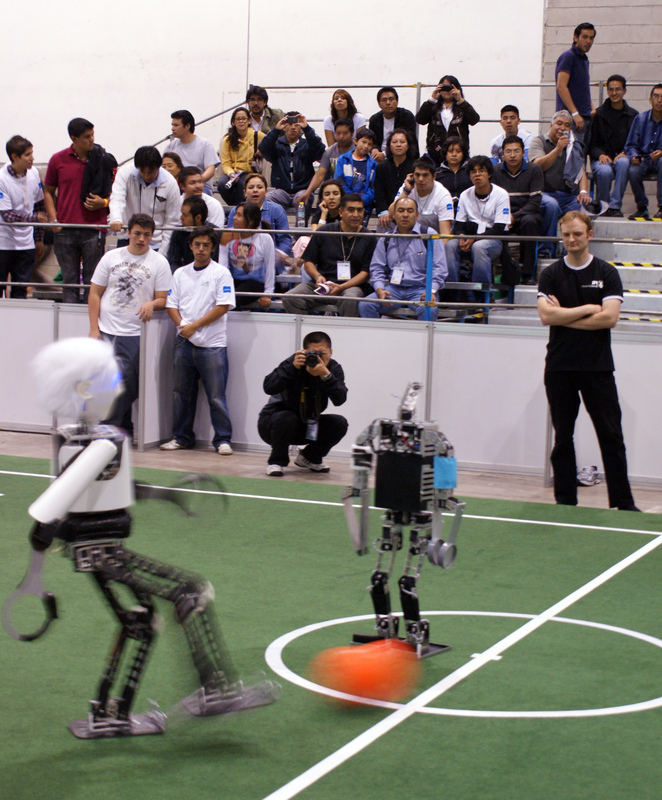 Both teams played with only one robot -- we used Dynaped in the first half and Copedo in the second half. 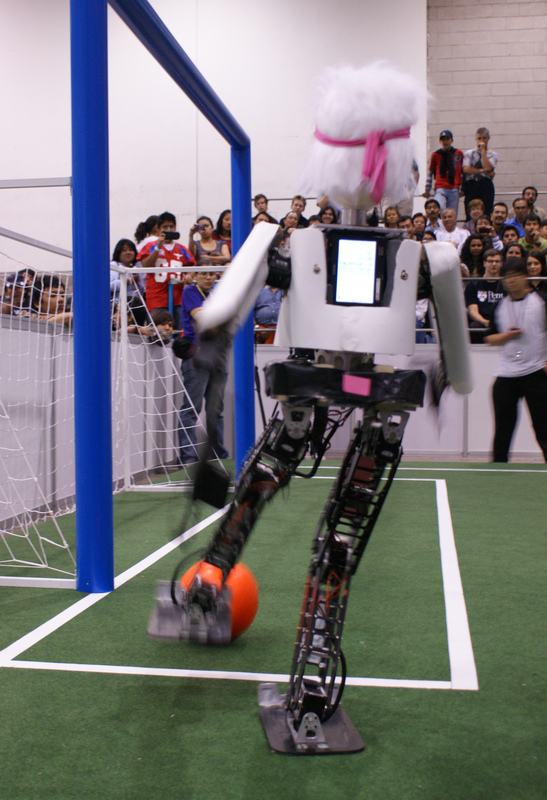 Because there were some interruptions our robots scored only nine goals. 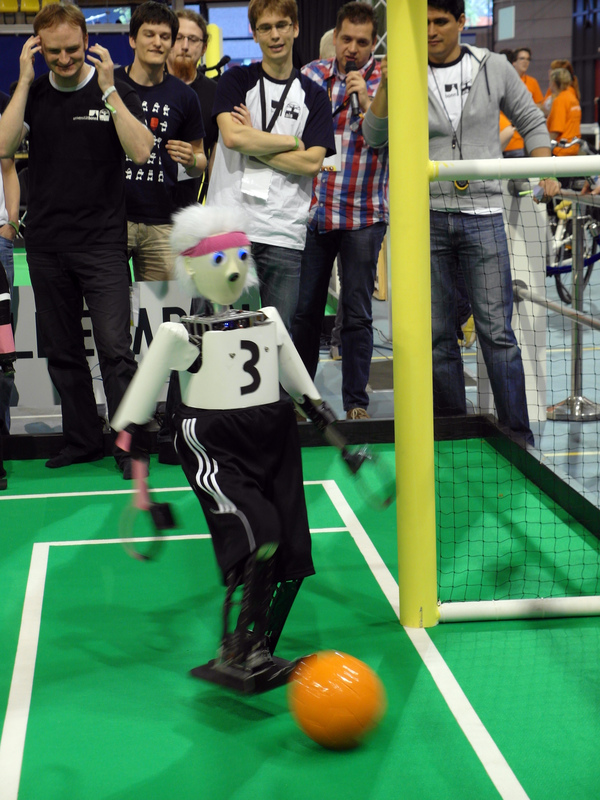 With 9:0 points and 23:0 goals, NimbRo wins the round robin. 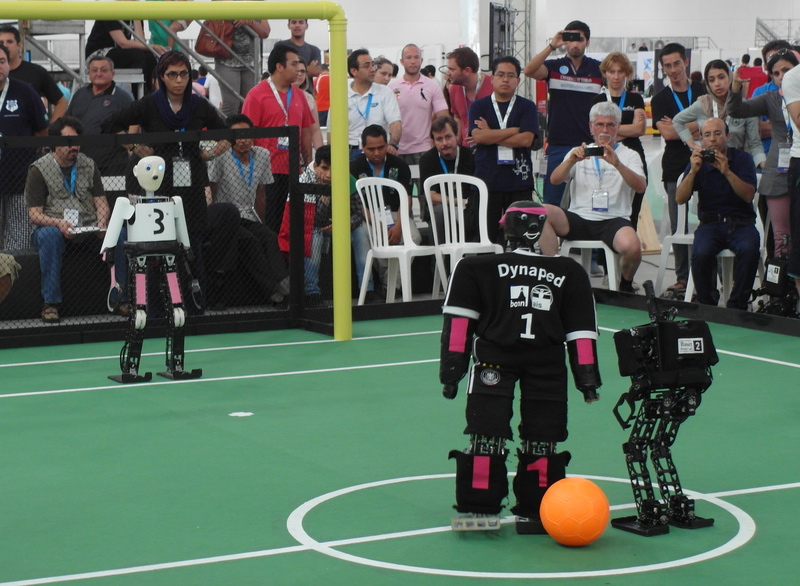 We participate at RoboCup 2012 in Mexico City in the Humanoid League TeenSize competition with the robots Dynaped, Copedo, and Bodo. 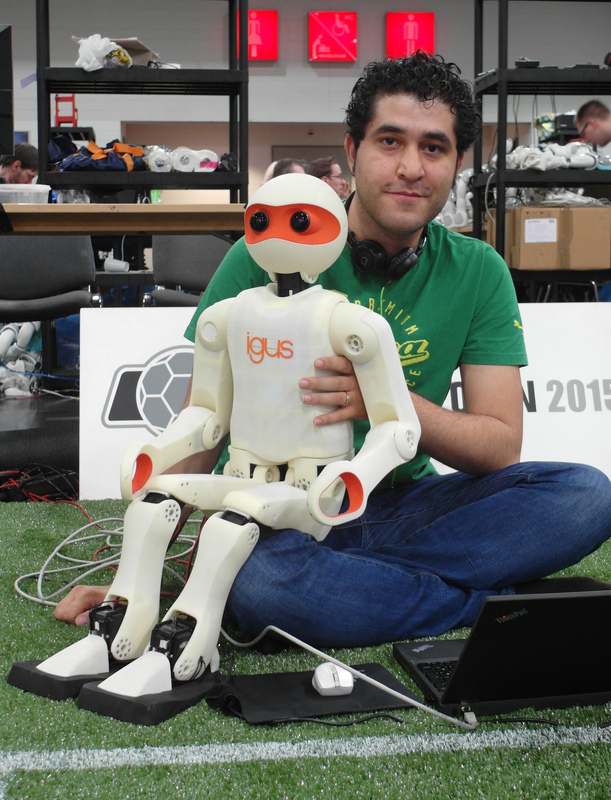 In the first round robin game, our robots met the team SHAYRAN from Iran. 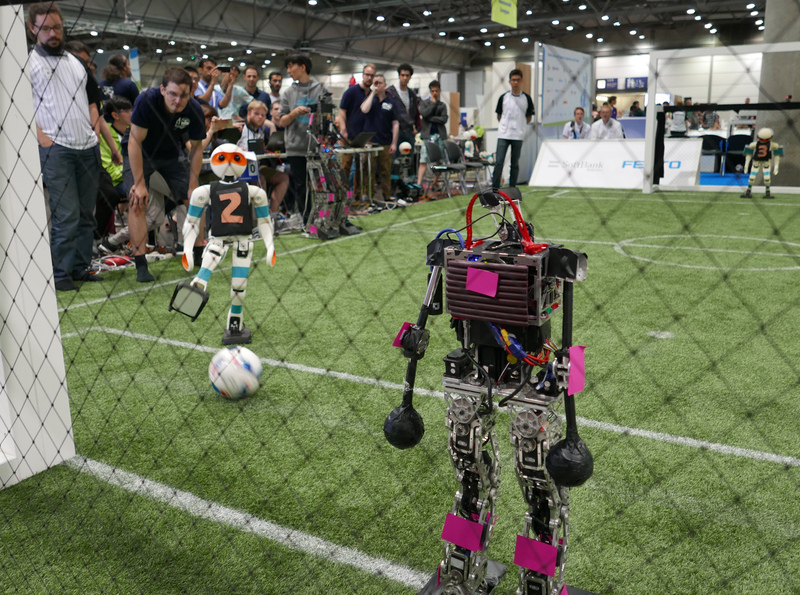 After some diffuculties that our robots had in the first half, Dypaped scored reliably in the second half and the game ended early 10:0 for NimbRo. 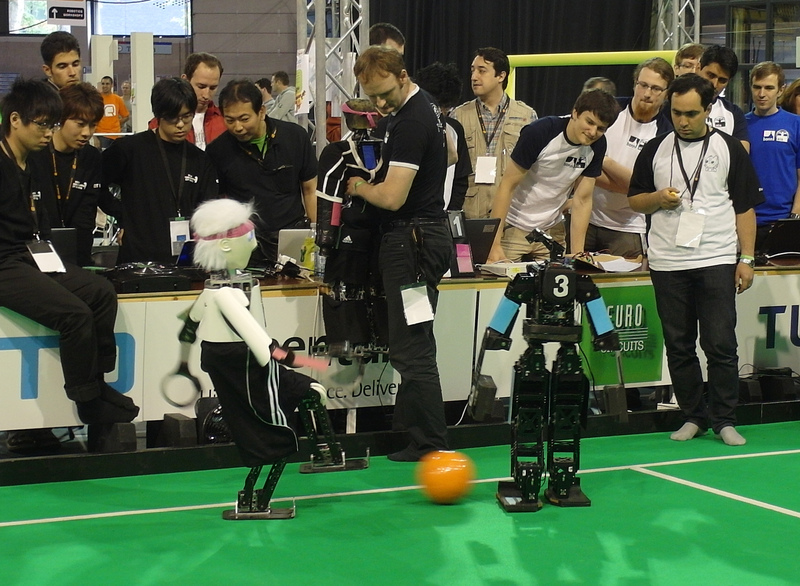 In the afternoon, our robots met the team CIT Brains from Japan in the second round robin game. 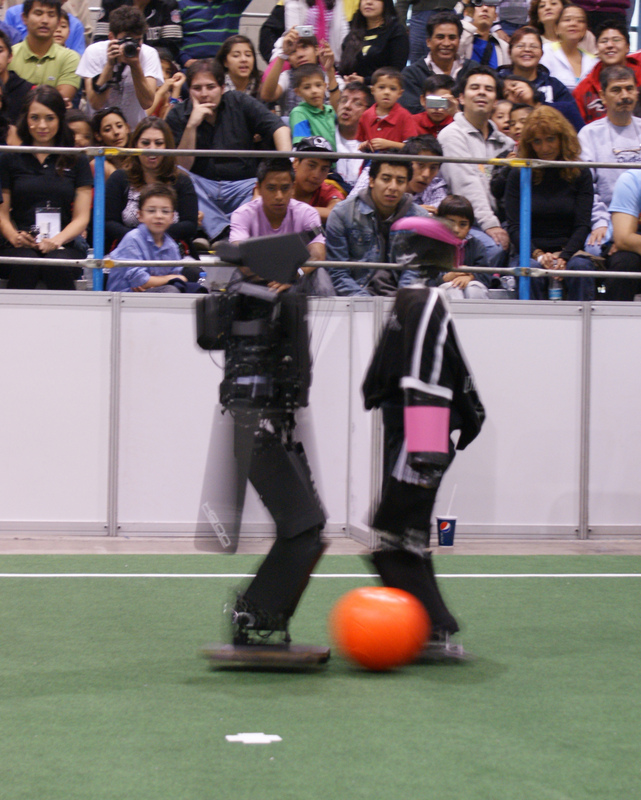 Both teams had technical difficulties with their robots. 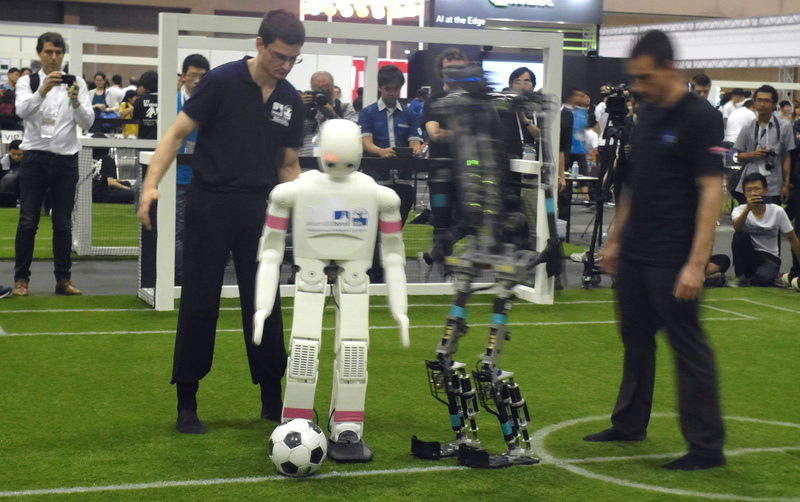 While the japanese field player quickly approached the ball and also kicked it towards our goal, the NimbrRo robots still had an advantage. 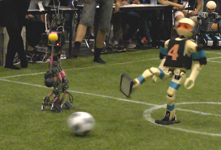 After 3:0 at half time, the game ended 4:0 for NimbRo. 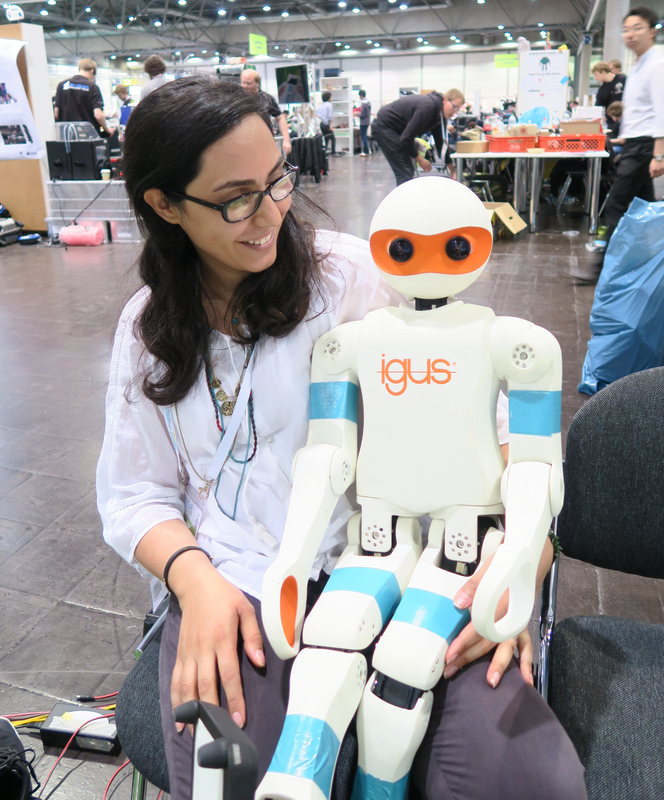 We gratefully acknowledge financial support of Igus GmbH for the participation at RoboCup 2012. 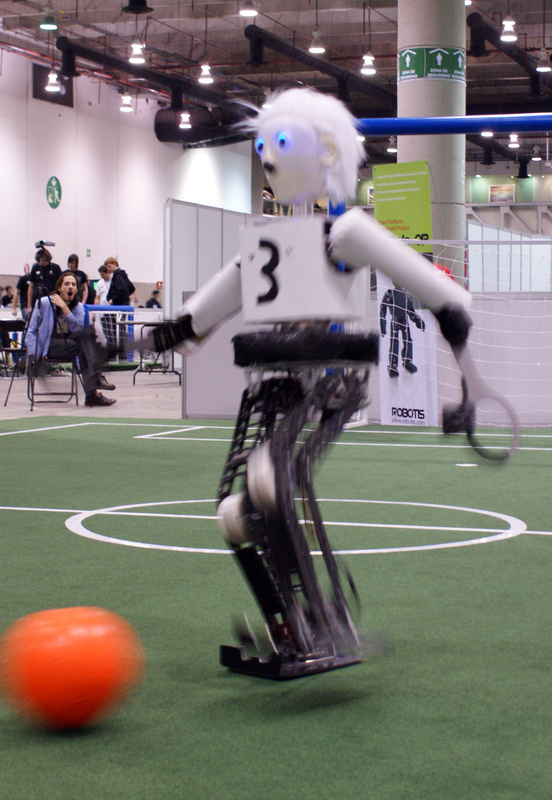 We won the 2011 Humanoid Soccer TeenSize tournament. 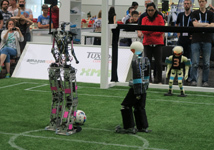 In the TeenSize final, our robots Dynaped and Bodo met the team KMUTT from Thailand. 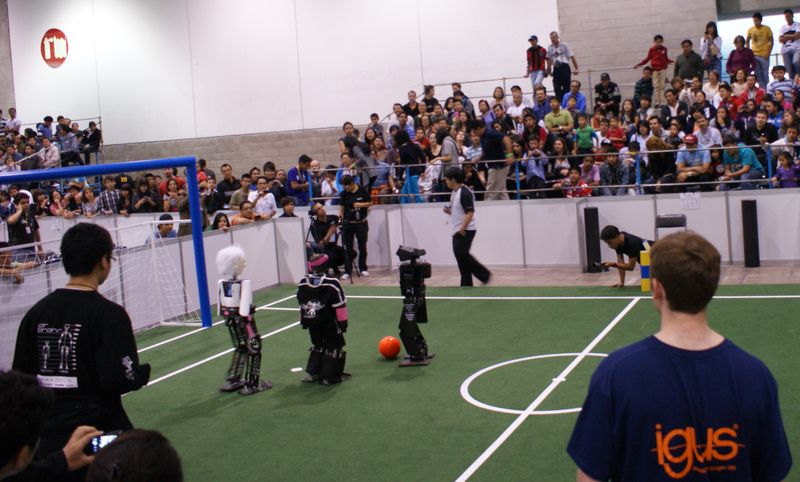 The Taiwanese team had a good defense. 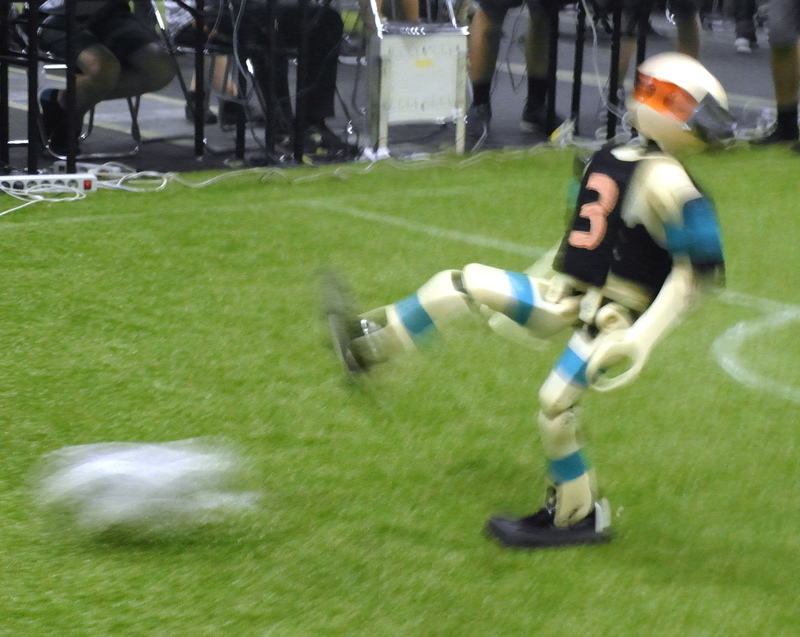 Nevertheless, the score was 6:0 at half time. The game ended early at a score of 10:0 for our team. 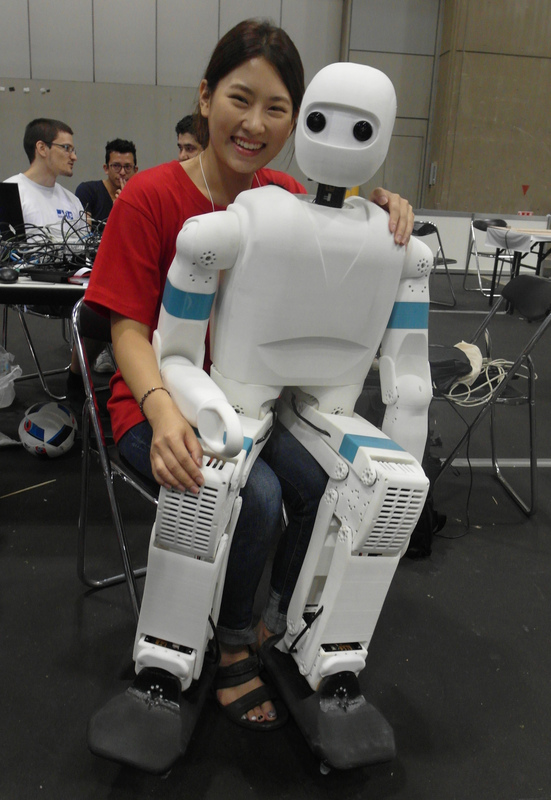 Our robots continued with round robin games and met again team KMUTT from Thailand. 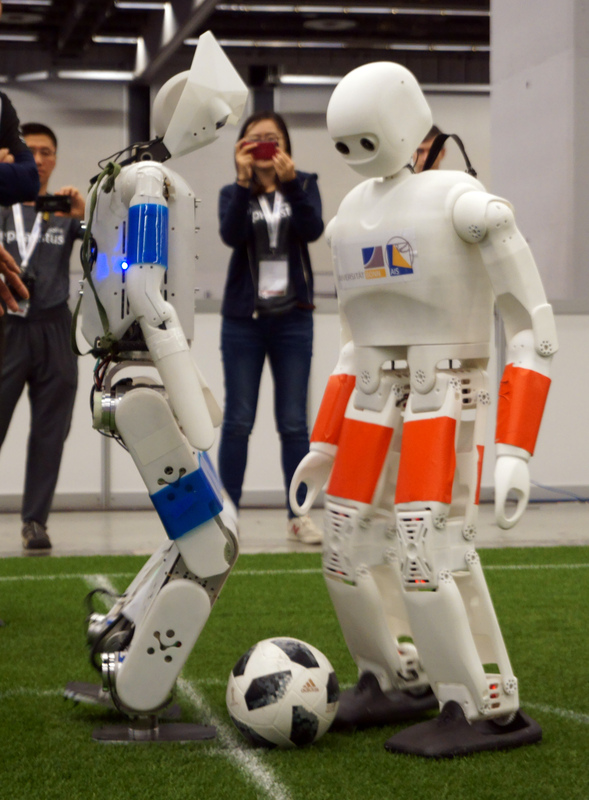 They improved their play. 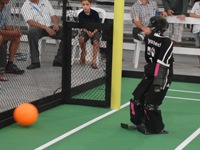 In particular, the KMUTT goalie jumped reliably and saved many goals. 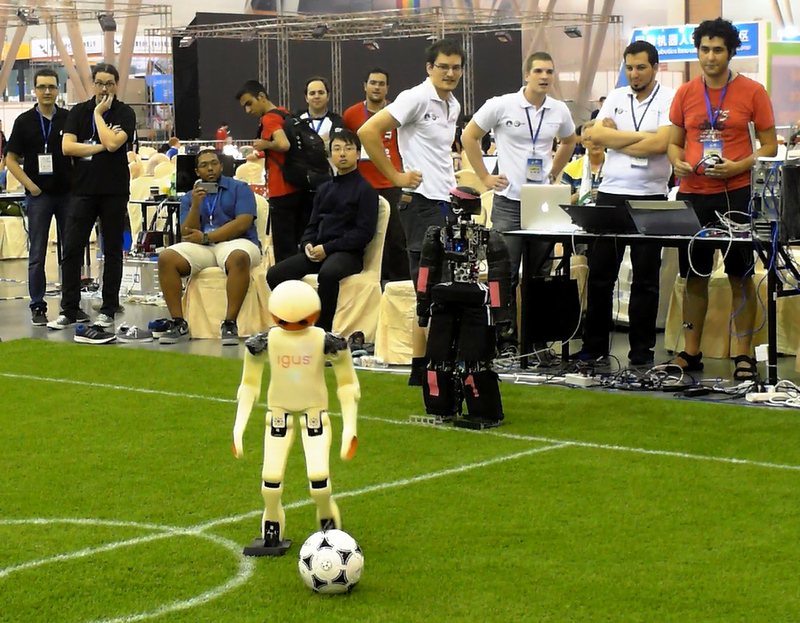 Hence, the result was only 8:0 for our team. 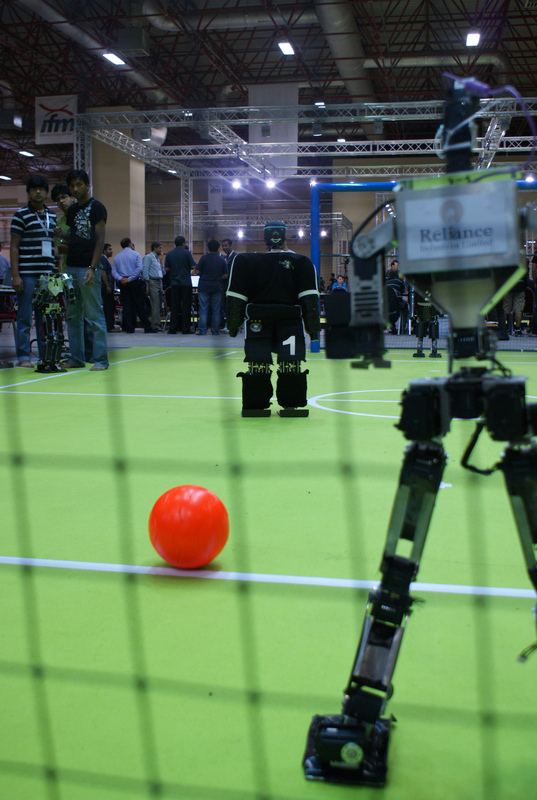 The second game vs. AcYut 4 from India was won by our robots 10:0. 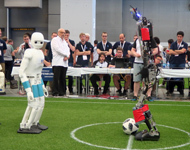 Our robots had to show their skills in the technical challenge. 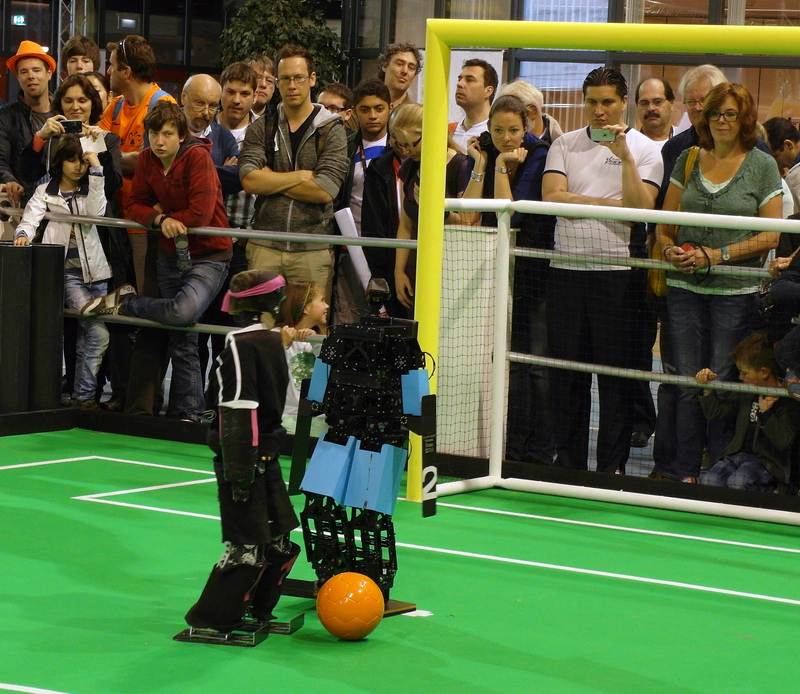 Dynaped dribbled the ball sucessfully between multiple obstacles. 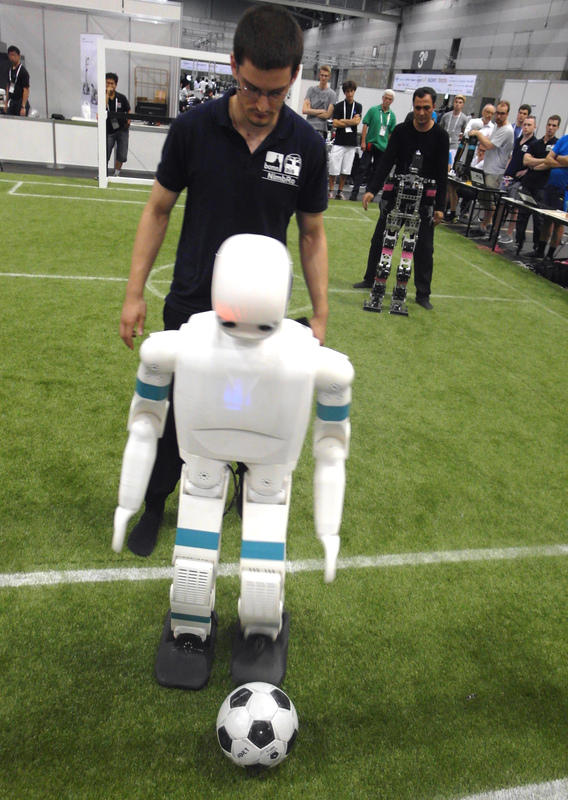 Together with Bodo, it completed the Double Pass Challenge half way. 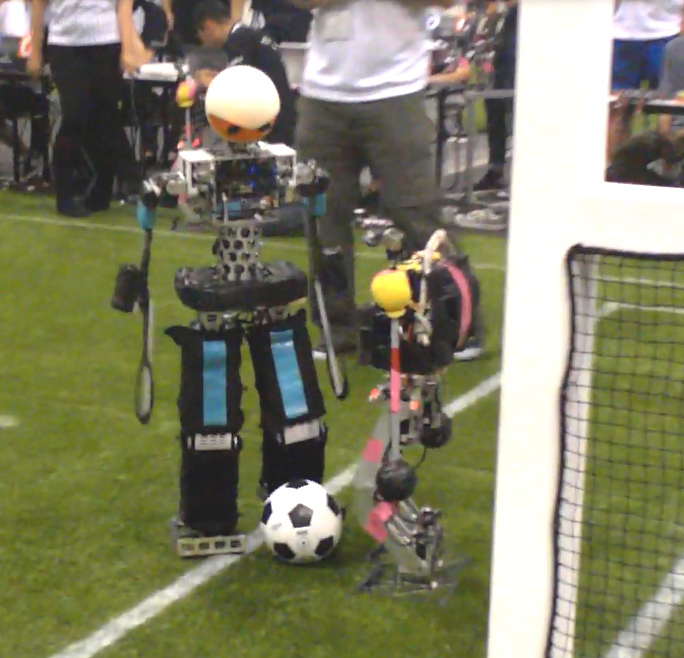 In the TeenSize soccer round robin, our robots Dynaped and Bodo won the first game 9:0 vs. KMUTT from Thailand. 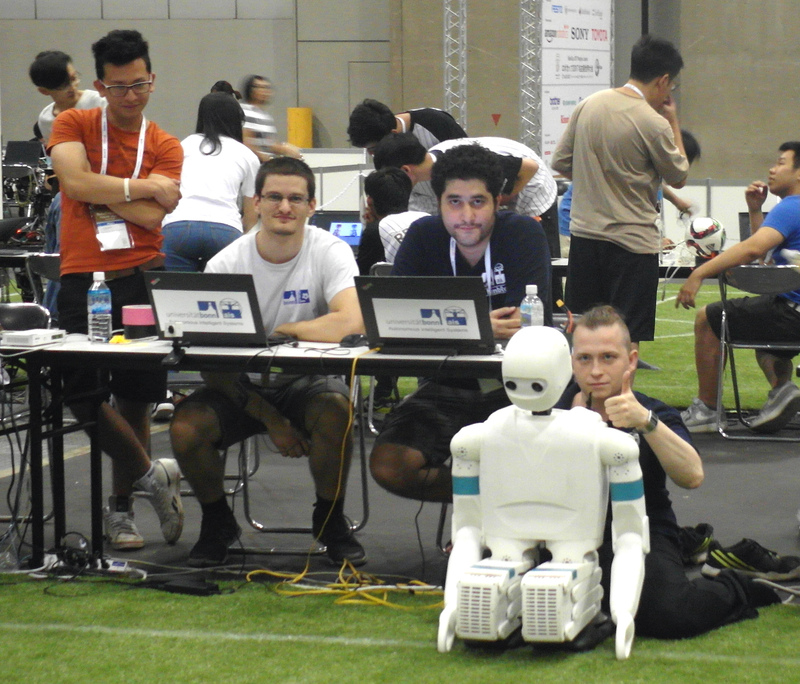 Our team also won the second game vs. AcYut 4 from India 10:0. 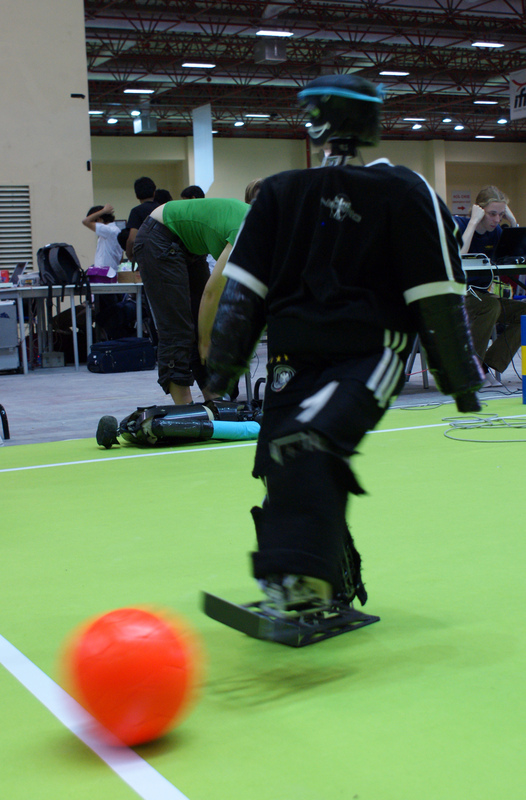 6.7.2011 Our team NimbRo participates at RoboCup 2011, which takes place at the Expo Center in Istanbul. Information about earlier tournaments can be found here.